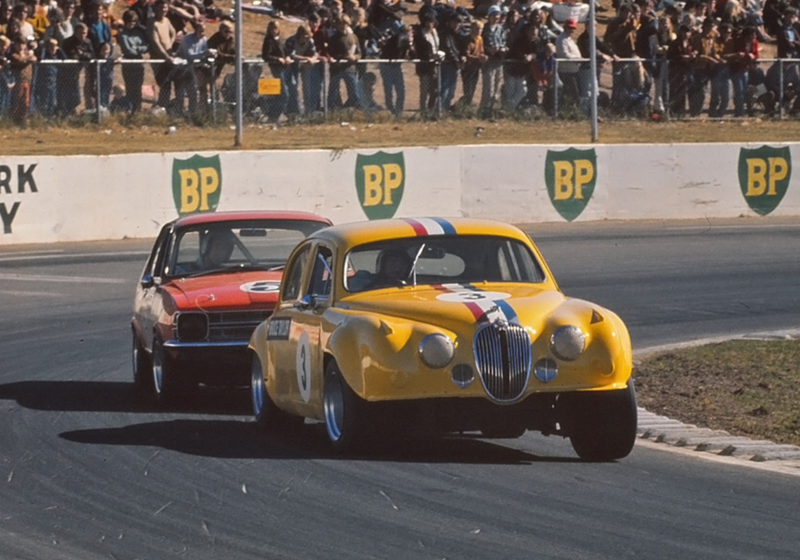 The car made its stunningly successful debut at the 1971 AGP the previous November. Matich won the race in a brand new untested car, the first monocoque and first single seater his team built. In the broader historic context it was the first time an Australian built car had won an AGP since Warwick Pratley’s George Reed Special Ford V8 victory at Narrogin, WA in 1951. This is a bit of a nutty long article. 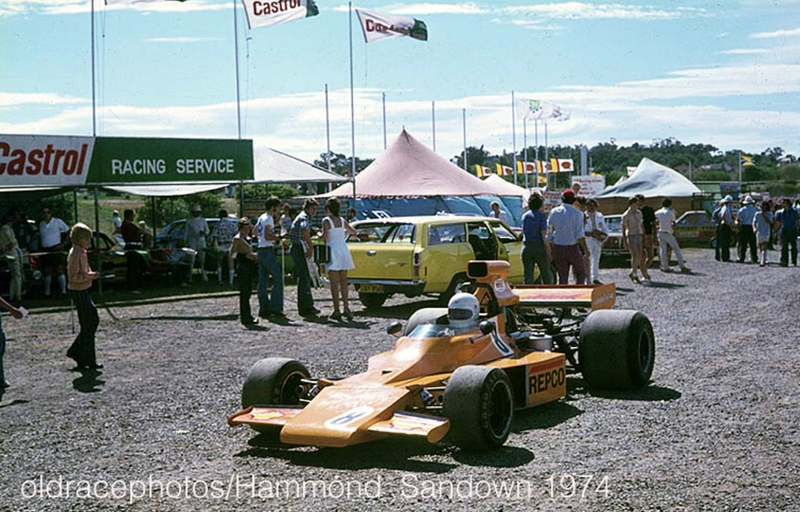 I tripped over some photos of the 1972 ‘Victoria Trophy’ at Sandown, shots not in the immense F5000 Facebook Groups photo archives, so i thought i would whack a ‘quickie article’ together to show my F5000 FB mates there are still shots to be found. Then i started thinking about why Matich didn’t win more Gold Stars, he only won in ’72. That led to research on his early ’60’s single seater campaigns which segued into his mid-late sixties sportscar specialism when he wasn’t eligible for the Gold Star, a single seater championship. And finally back to single seaters again in the F5000 period. 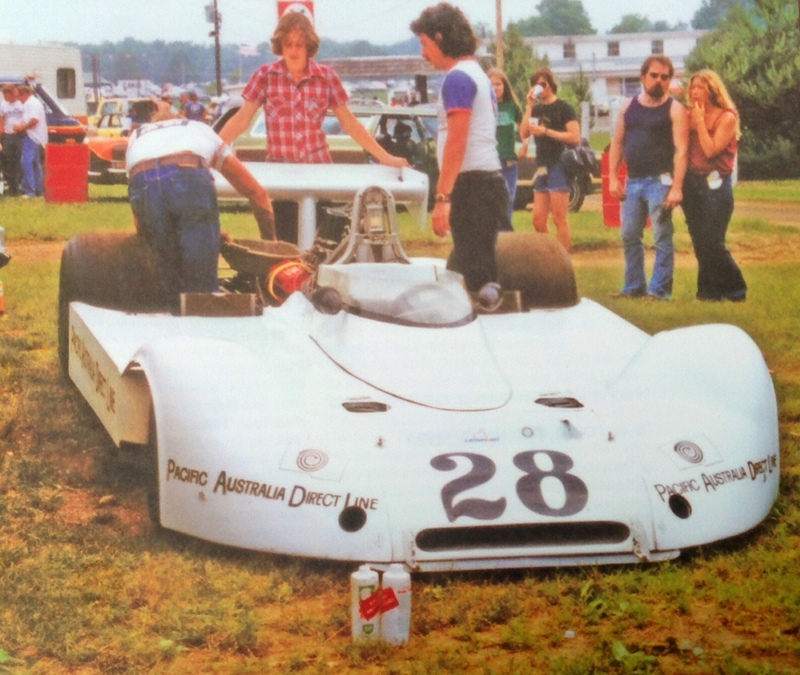 Then there are the Matich cars he built and drove which are a key part of the story…and i kept on writing of course. 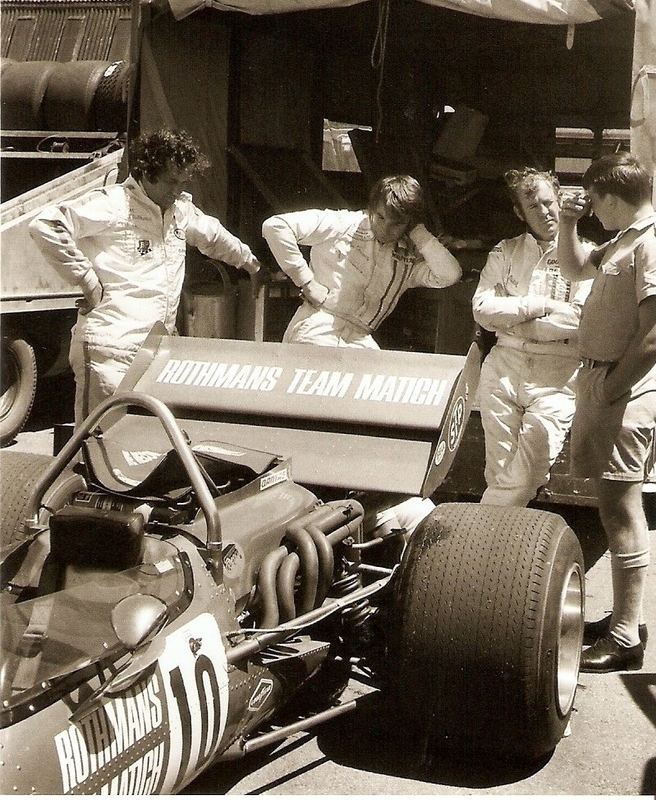 .Then the substance of FM’s Matich F5000 cars and their racing campaigns with Matich. 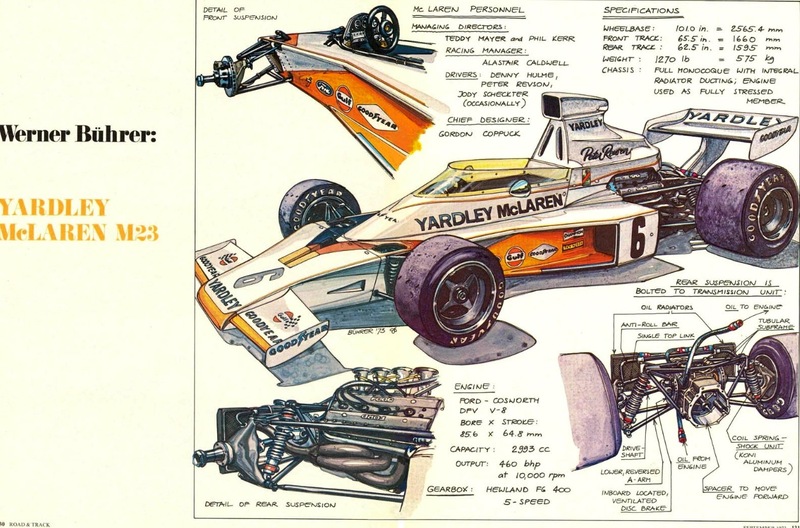 In terms of the Matich F5000 detail i have drawn heavily on conversations and a manuscript provided by Derek Kneller, (DK) an Englishman who was a Team Matich engineer/mechanic for the whole of its F5000 period. He literally shipped FM’s first McLaren M10A to Oz and followed it in August 1969 and returned to the UK in 1974 after FM retired and the cars were sold. 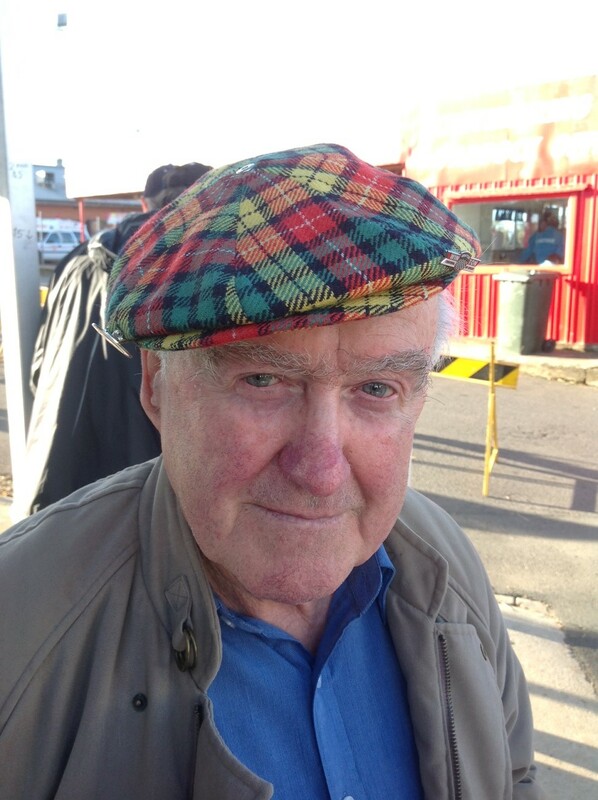 The very articulate Derek was in Australia recently for FM’s funeral and recorded a very interesting interview with ‘Pitlane’, there is a link to it towards the end of this article, its well worth watching. Many thanks Derek! If Australians have seen some of Derek’s material before its because it was included in Aaron Lewis’ excellent article on the Matich F5000 cars published in ‘Australian Musclecar Magazine’ some years ago. Much of the material has not been published before however. 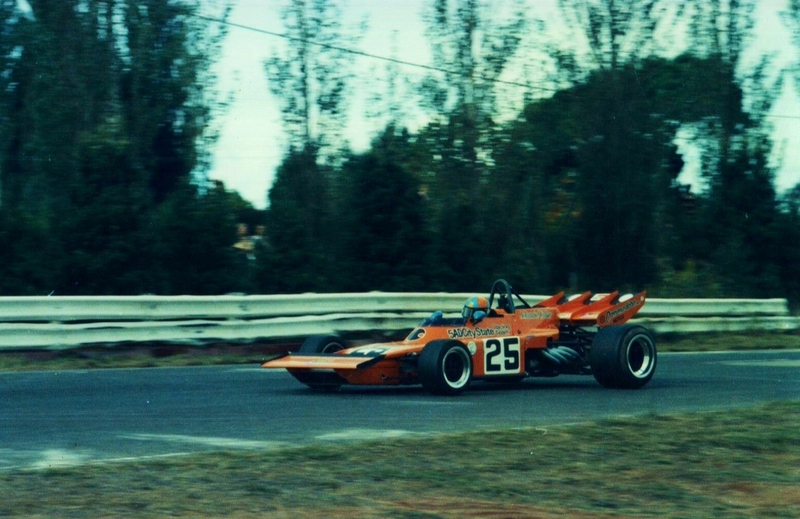 Max Stewart took the 1971 Gold Star in his 2 Litre Mildren Waggott, his blend of speed and reliability ‘knocked off’ the F5000’s in the class’ first year as Australia’s National Formula 1 (ANF1). Even Max saw the writing on the wall, he sold his faithful Mildren and replaced it with a Repco Holden powered Elfin MR5. The ’72 Series comprised established stars; Matich, Bartlett and Stewart, coming men Muir, Walker, McCormack and Brown and some solid ‘journeymen’. 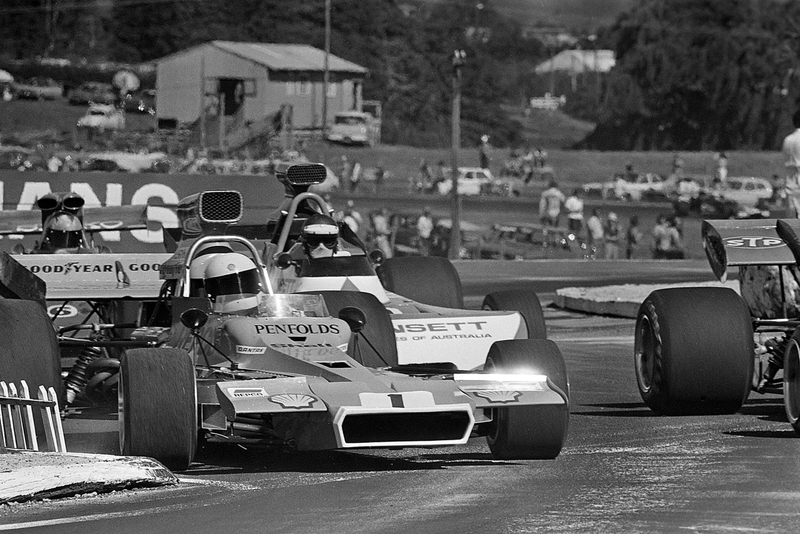 The ‘form’ drivers were Matich and Bartlett but Muir made a great F5000 debut in the just completed Tasman Series. FM’s Tasman was disappointing having won the AGP upon the A50’s debut in November 1971. He expected to be more competitive in the Tasman only to watch his Kiwi Driver/Constructor rival Graham McRae win the series in his McLaren based Leda LT27/McRae GM1. McRae won 4 rounds and scored points in 5 of the 8 rounds. The Matich team continued to develop their new car, A50 ‘001/2’ throughout the Tasman series as DK recalls ‘…There were some problems in the team during the Tasman. I was homesick and returned to the UK after the ’71 AGP. Whilst Peter Mabey is a top bloke and a great Chief Mechanic most of the rest of the team were not pulling their weight in NZ, doing the all-nighters or whatever was required. So the load fell on Maybey’. ‘Peter had been with FM for 4 years including the build and racing of the SR3 in the ‘States, in fact i was to replace him as Chief Mechanic, but he stayed on once it was clear we were to build a single-seater, something he had not done before. None of that was a drama, we worked well together’. 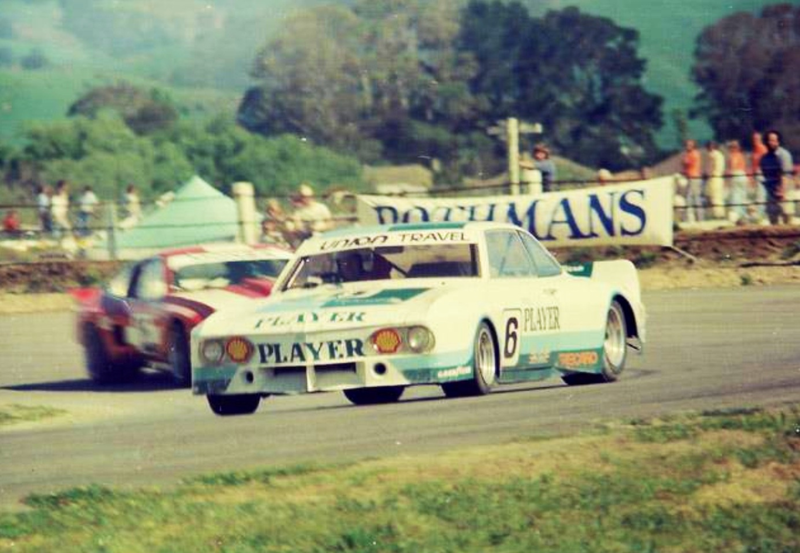 ‘The upshot of the workload and pressure was that Peter left the team after Levin, he had just had enough, as had his wife of the pressures of racing. ‘The rear suspension geometry was altered with a lighter rear subframe and raced at Surfers Paradise, where the car was more competitive. 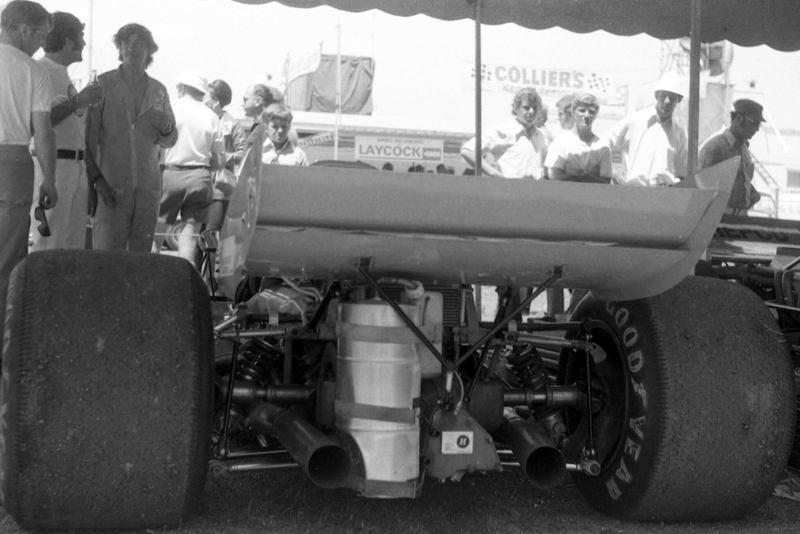 The rear suspension geometry was altered again after Surfers (rear roll centre raised) and Frank won the next race at Warwick Farm. 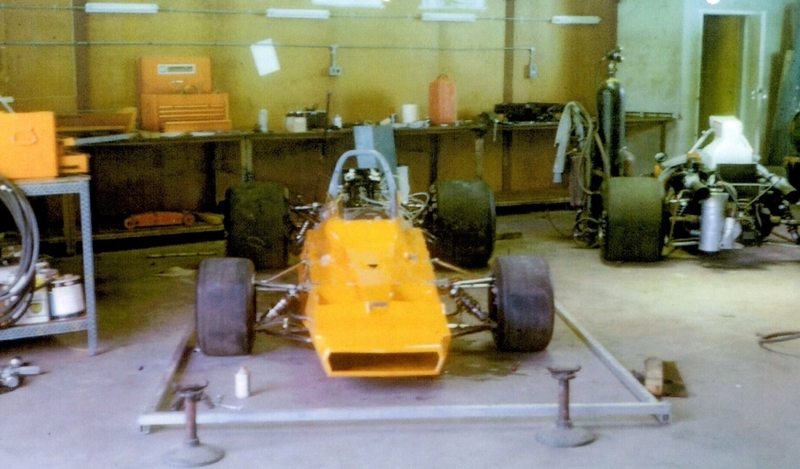 The same chassis was used for the rest of the Tasman series, for the successful 1972 Gold Star series and the 1973 Tasman, at its end the car was put on chassis stands at the Brookvale factory’. Matich won, as Kneller notes at Warwick Farm, his backyard and the circuit at which he primarily honed his cars setup and picked up points in 4 of the 8 Tasman rounds, despite the in team dramas. Bartlett also scored 4 times in the Tasman and won at Teretonga. The win was impressive, scored in the McLaren M10B previously owned by Niel Allen. 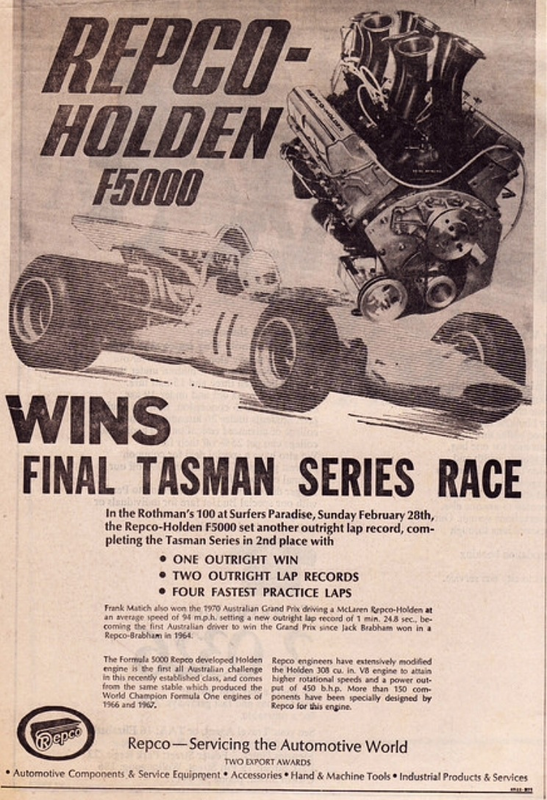 1972 was that chassis’ third Tasman Series. The reliable old beast was replaced by a brand new Lola T300 for the Gold Star Series KB having watched his friend and mentor, Frank Gardner’s progress in the car concepted by FG as a replacement for Lola’s ageing T190/2 series. Gardner was Lola’s development driver/engineer. The prototype T300 ‘T242’ made its debut at Thruxton on 1 August 1972. By the end of the season the T300 was the fastest thing in Europe. FG took wins at Hockenheim and Oulton Park in September. 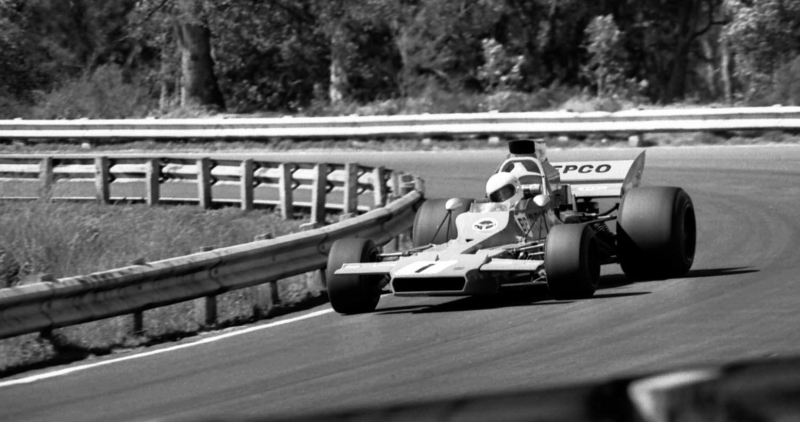 In addition he won the 1971 British F5000 Championship with points accumulated in both his T192 and T300. 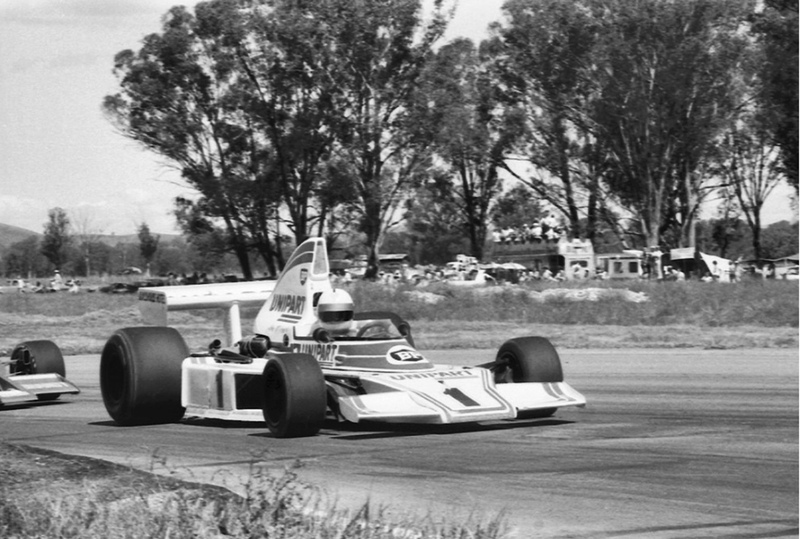 Mind you, the very fast, Leda LT27/McRae GM1 didn’t break cover until after the end of the British F5000 Championship and was THE CAR in 1972, McRae won the Tasman and US F5000 Championships, both with GM at the wheel. In Australia Lola T300’s were bought by Bartlett, Bob Muir and F2 driver Gary Campbell stepped up into Gardner’s ’72 Tasman entry. 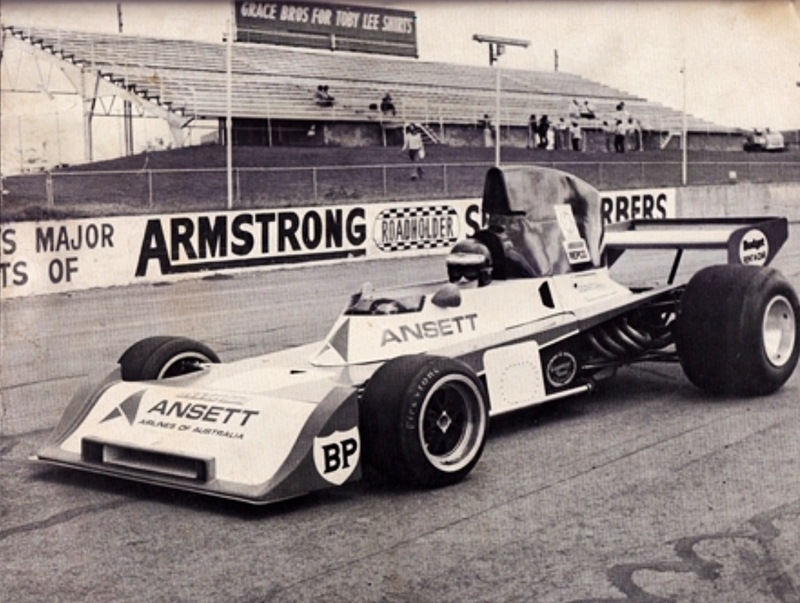 Ansett Team Elfin were represented by both driver/constructor Garrie Cooper, and John McCormack, the latter became more and more competitive with each 5 litre drive. 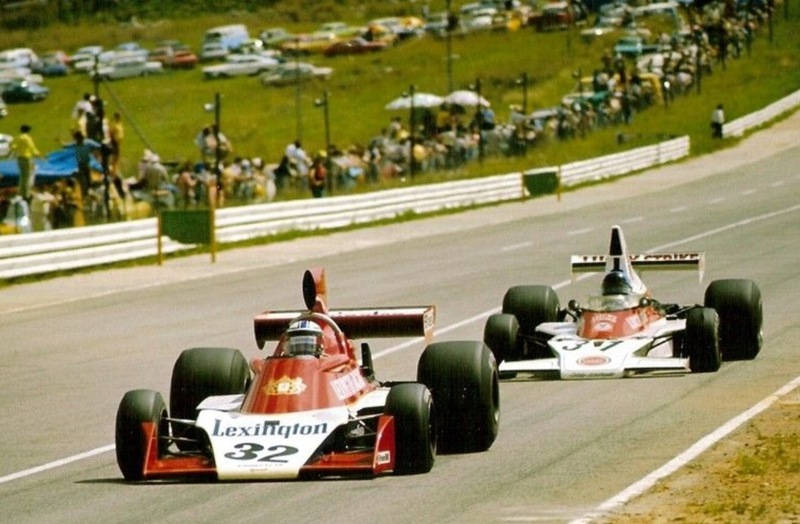 The Elfin MR5 Repco’s made their debut in late 1971 and were developed over the 1972 Tasman Series, new Elfins were also bought by Max Stewart and John Walker. By the seasons end Walker acquired a Matich with which to contest the ’73 US Series, the Matich had the safety fuel tanks of the spec required for the L&M Series. And was a faster car. Warwick Brown’s mentor, businessman Pat Burke bought Alan Hamilton’s low mileage ex-Allen spare M10B and made a big impact. 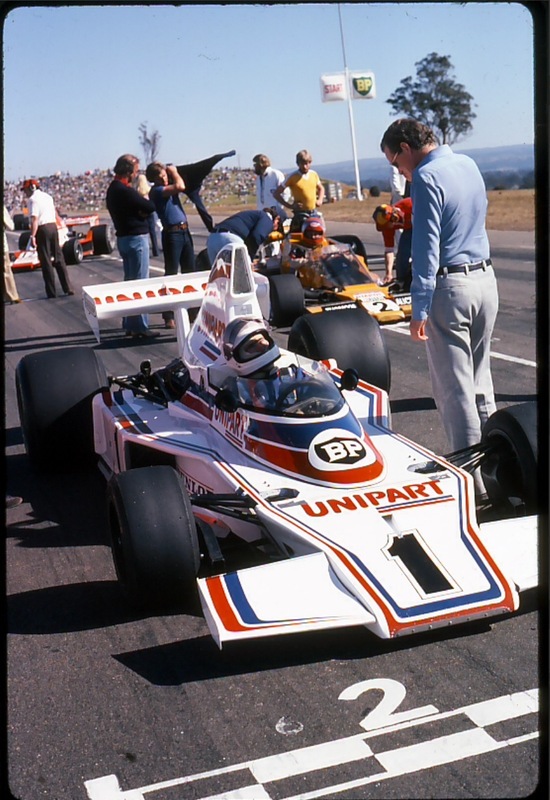 Warwick would be a force in F5000/CanAm through to the end of his driving career in both Australasia and the USA. Matich set pole on 61.5 secs nearly 1 second quicker than McRae’s Tasman pole time only 2 months before. Bob Muir was next on 61.9 and was quick with a new Chev, then came Bartlett, McCormack, Campbell, Max Stewart, Warwick Brown and John Walker. Further back were the ANF2 cars. 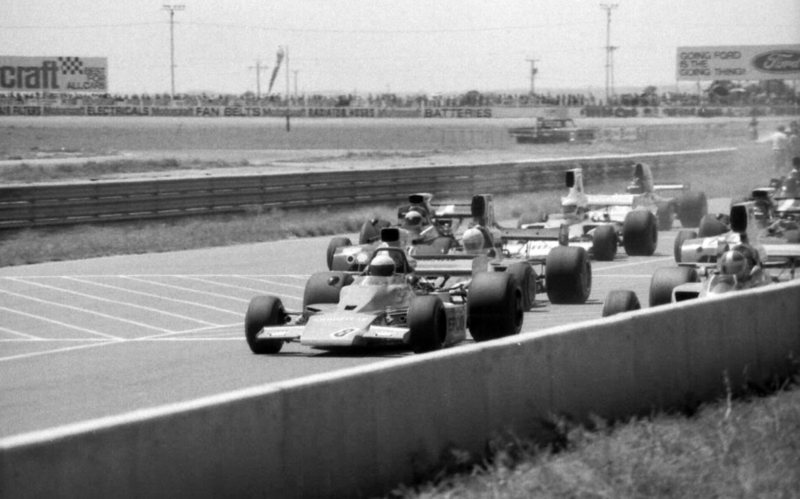 A crowd of 20000 in beautiful sunshine were in attendance to see 8 F5000’s and 9 F2’s. Matich got the jump at the start and was never headed, behind him were Muir, Bartlett, McCormack , Brown, Stewart and Walker. Stewart slipped past WB but almost immediately dropped a valve in his Repco Holden V8, Walker moved forward then Brown pitted having slowed. 10 laps down Matich lead Muir by 7 seconds who was well clear of KB who was being challenged by the Elfin duo of McCormack and Cooper. Campbell clobbered the fence at ‘Torana’ corner, Walker was through to 6th, the race came alive with Mac challenging Bartlett on lap 20. The pair were at it for 6 laps, nose to tail before the Lola yielded to the Elfin MR5, then KB’s engine lost its edge and he retired with ignition failure. Muir was driving a great race, now Mac set after him, he had maintained a good pace despite being short of water, eventually the Lola started to smoke badly but Bob was able to keep clear of the Tasmanian to maintain 2nd spot. Behind Mac were Cooper, Walker, Brown and Malcolm Ramsay in the little Birrana 272 Hart Ford F2 car. 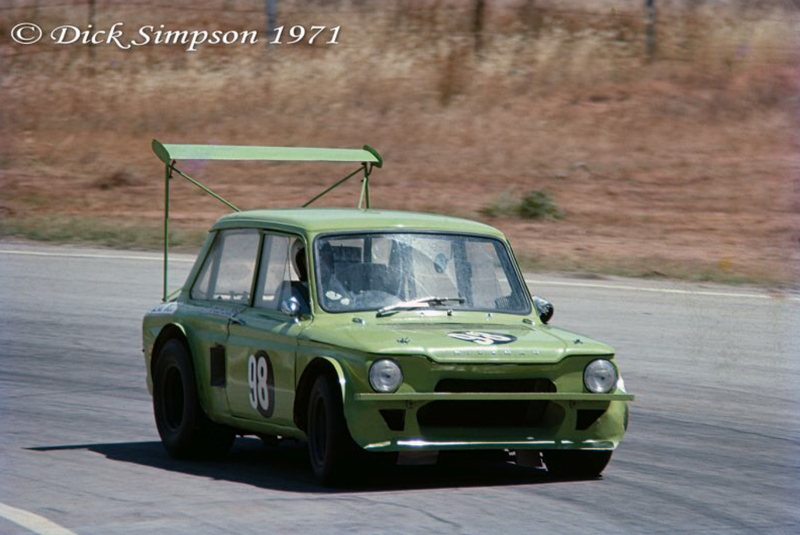 This was the prototype of a series of cars which dominated the small bore class in Oz for the next few years. ‘Australian Motor Racing Annual’ noted Matich’s great win and McCormack’s strong drive in 3rd having been ill for most of the week prior. 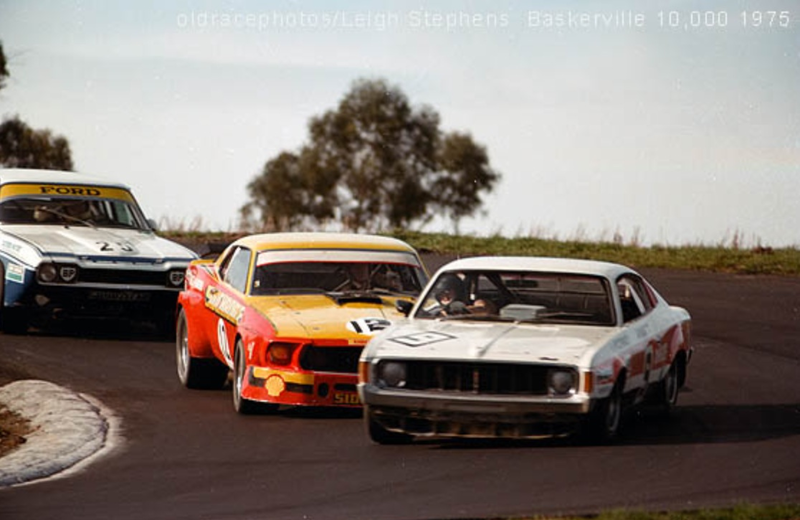 For Matich it was the start of a dominant 1972 Gold Star campaign; he won the series from Kevin Bartlett with wins at Sandown, Oran Park, Surfers’ and Warwick Farm. KB won at Adelaide International and McCormack the Symmons Plains round in his native state of Tasmania. Arguably FM was Australia’s greatest resident racing driver of the sixties and seventies, certainly he was one of them, despite that he collected only one Gold Star. Why? FM cut his racing teeth in sportscars in the mid-fifties, quickly progressing through Healeys’ to the Leaton Motors Jaguar C and D Types and Lotus 15 Climax 2.5. Then two Lotus 19’s. He first raced open-wheeler Elfins taking points in the 1963 Gold Star in an Elfin 1.5 Ford, the title won by Bib Stillwell. 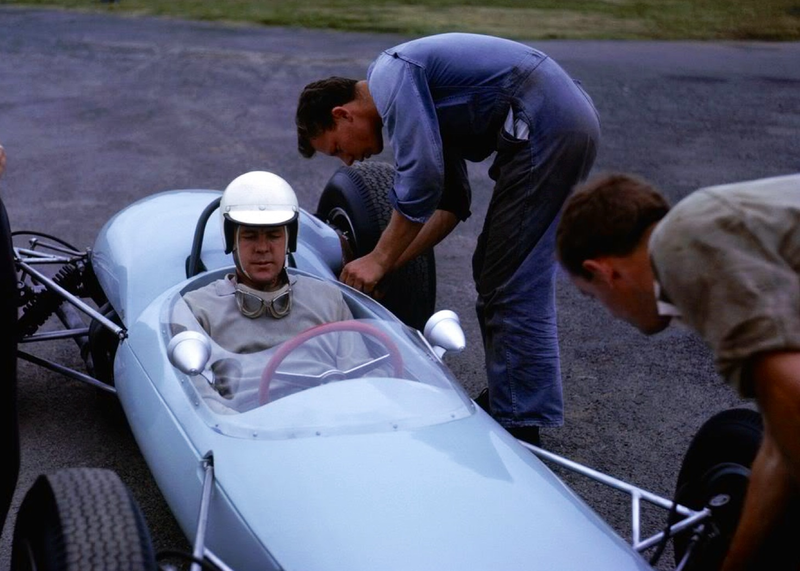 He became serious about his open-wheeler program in 1964, buying the latest ‘Intercontinental’ Brabham, the BT7A. He very quickly got to grips with the 2.7/2.5 litre Coventry Climax FPF engined car. 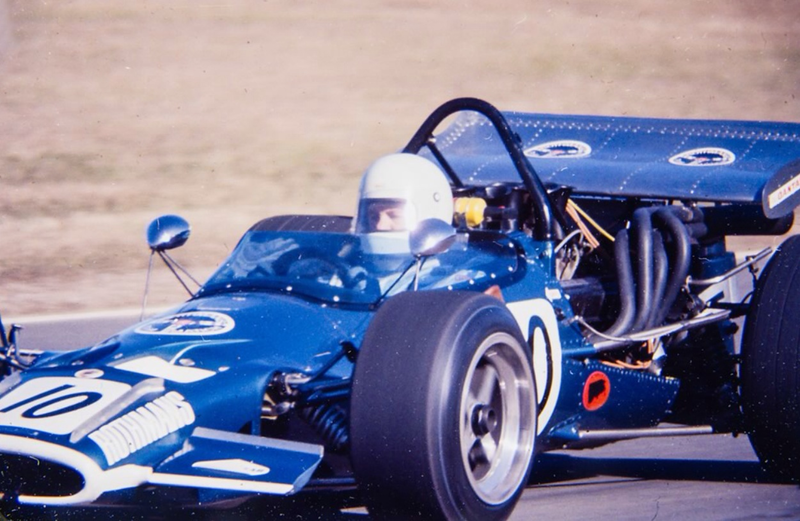 Stillwell maintained his earlier model BT4 for ’64 but again won the championship, Matich took one win. There was little doubt that FM was the quickest local, a driver who had not yet peaked, whilst Bib, having served a long apprenticeship, was atop the mountain, drove well, was well funded via his car dealerships and had well prepared cars driven with more mechanical sympathy than Matich. FM lacked reliability which was perhaps, if you believe what was written at the time, a function of being hard on his equipment, his cars equally well prepared, but perhaps not quite as well financed as Stillwell’s. 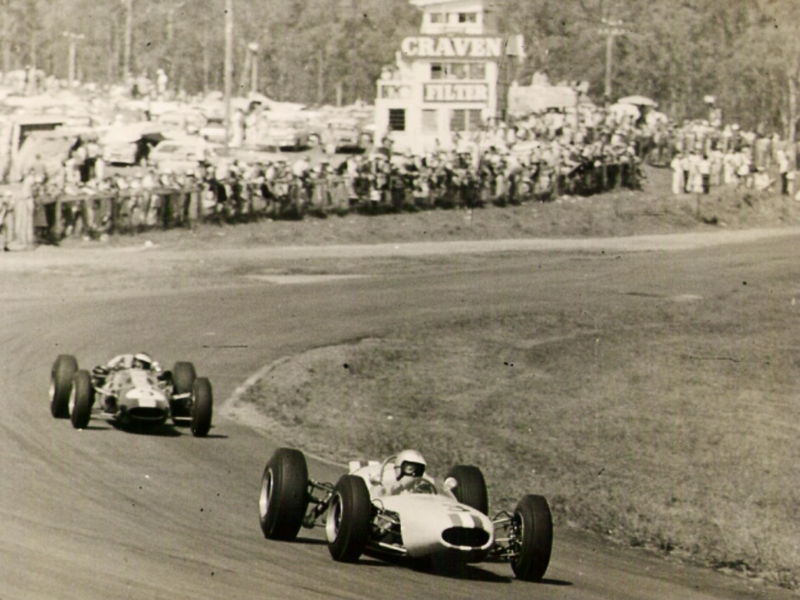 Matich was equal 4th in the Gold Star in 1964 his speed absolutely confirmed in the 1965 Tasman Series, where his year old, well developed car gave nothing away to any of the Internationals or the latest BT11A Brabham’s driven by Graham Hill, Stillwell or Jack himself. He contested the 1965 Gold Star in the BT7A, his best results two 2nds, the title won again by Stillwell, who, having won 4 on the trot retired from racing. Matich refocused on sports cars, he saw greater commercial opportunities as they grew in stature and importance globally. 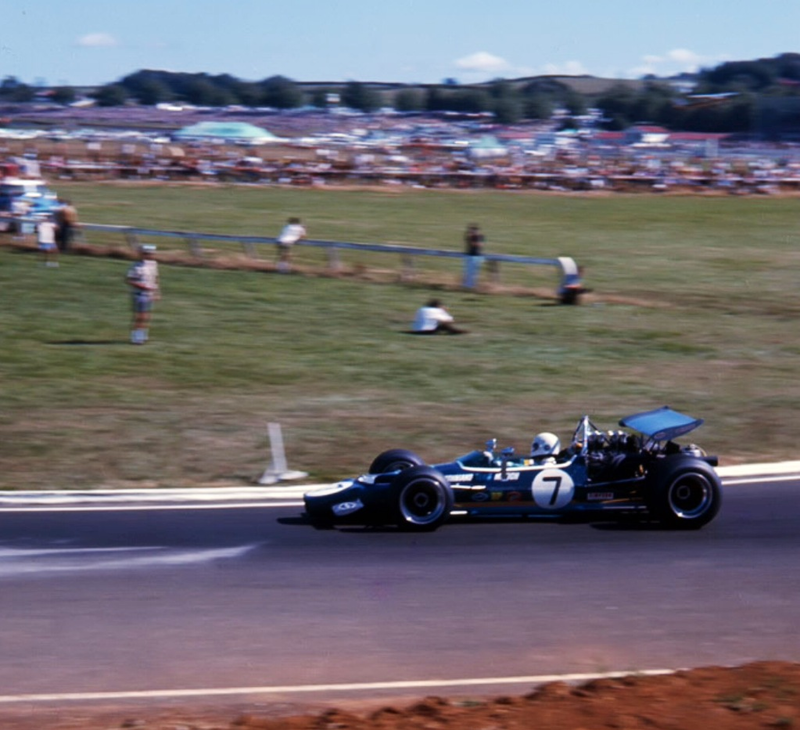 Whereas in 1964/5 he continued to race his Lotus 19B as well as the single-seater Brabham, from 1966 to 1969 FM raced sports cars to the exclusion of openwheelers. Sadly. So Spencer Martin, Kevin Bartlett, Leo Geoghegan, John Harvey and other Australian top liners in single-seaters didn’t have FM ‘in their sandpit’ from 1966 till later in 1969. 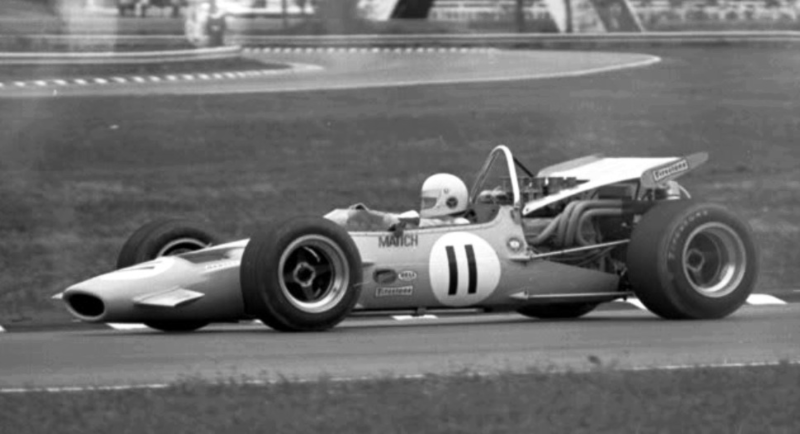 His Matich SR4 powered by Repco’s quad-cam 5 litre ‘760 Series’ V8 was intended as his 1968 Can Am weapon but was finished late and didn’t contest the title won by the McLaren M8A Chevs of McLaren and Hulme. 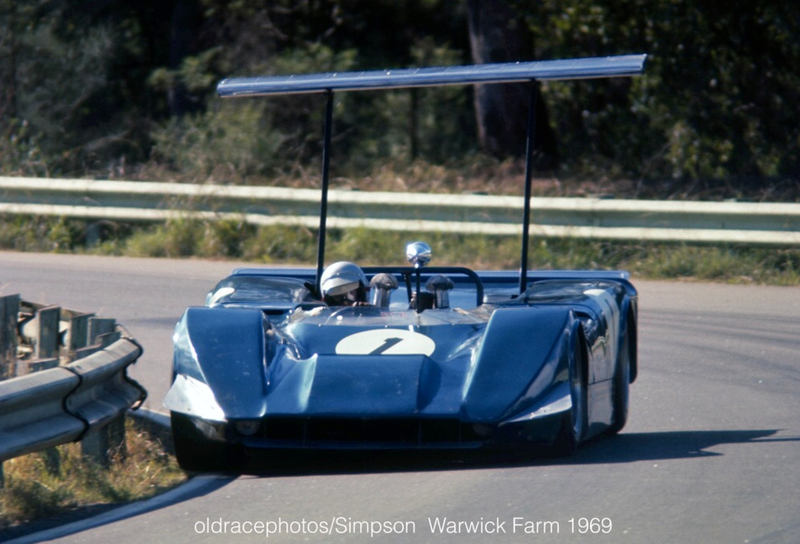 No way was the SR4, powerful as it was, going to take that title, but it would have been interesting to see how the beautiful handling, spaceframe chassis SR4 would have gone in the ’68 Can Am all the same. Instead he raced it in Australia in 1969 and ‘blew the rest of the field off the planet’ taking the national title in a display of absolute engineering and driving dominance. The Repco engine behaved, the valve gear resonance dramas which destroyed Jack and Jochen Rindt’s 1968 F1 season not apparent in the ‘760 Series’ 5 Litre variant of the engine which revved lower than its ‘860 Series’ 3 litre little brother. One racing’s endless pub topics of debate is ‘whom is better than whom’ both globally and in our particular countries of origin. I’ve always enjoyed these debates secure in the knowledge its pretty much impossible to compare drivers across eras even if a ‘pure statistical’ approach of races entered/won is taken. Of more interest and perhaps accuracy are the opinions of ‘expert observers’ of the sport at a particular time commenting on drivers and cars with all relevant factors which should be considered at the time in the context of the time. The other two ‘5 star’ drivers that year were Leo Geoghegan and Kevin Bartlett. The analysis suits me as FM and KB are my two greatest Australian resident drivers of the 1960 to, say, 1975 period. Who did i consider in the mix? Lex Davison, Stan Jones, Bib Stillwell, Spencer Martin (boy it would have been good to see him peak, he retired before he did in my opinion), Leo Geoghegan, John Harvey, Max Stewart, John McCormack, John Walker and John Goss. 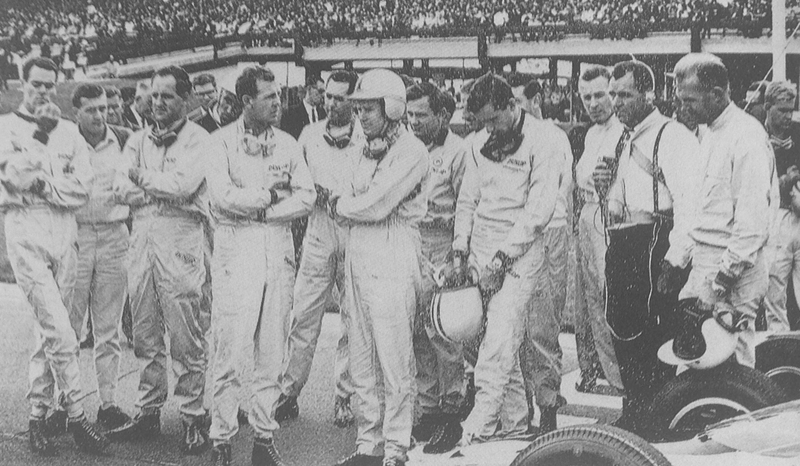 Outside this mix are Jack and Geoff Brabham, Gardner, Schenken, Walker, Jones, Perkins, Warwick Brown and Bruce Allison who ‘took the hard road’ and left the country to seek success, fame and fortune. ‘Top 6 drivers in the world’ is a big call in relation to FM. Or not? I am speculating, we all have our own list in early 1968 when the magazine was published before Jim Clark’s death. But a Top 6 drivers in ‘The World Best’ then maybe includes; Clark, Hill, Brabham, Stewart, Gurney and Hulme. 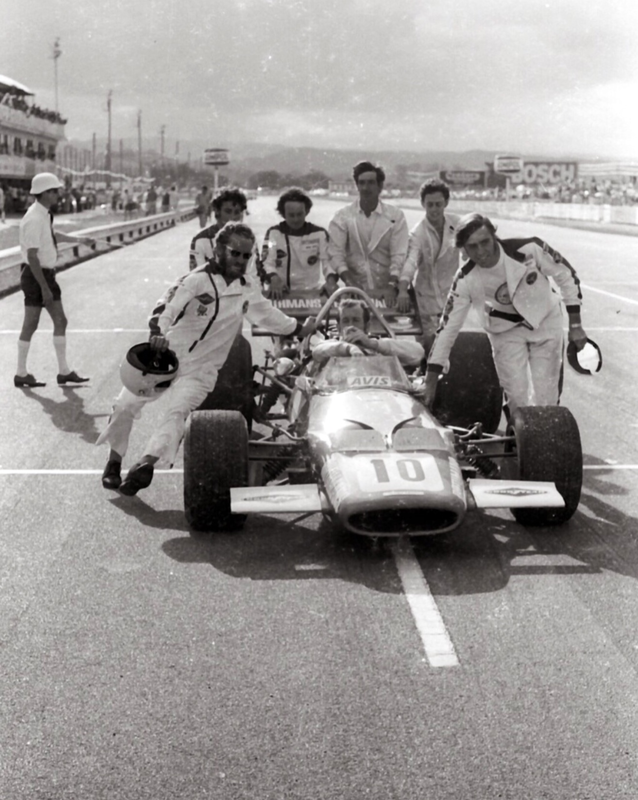 Top 6 ‘The Worlds Fastest’ maybe includes; Clark, Stewart, Gurney, Rindt, Amon and Rodriguez. Whichever way you cut it FM was ‘up there’, famously the only member of the Grand Prix Drivers Association who never raced in an F1 World Championship GP. And someone who had opportunities to race GP cars in Europe but for family and business reasons chose to race Internationally from his Australian base. 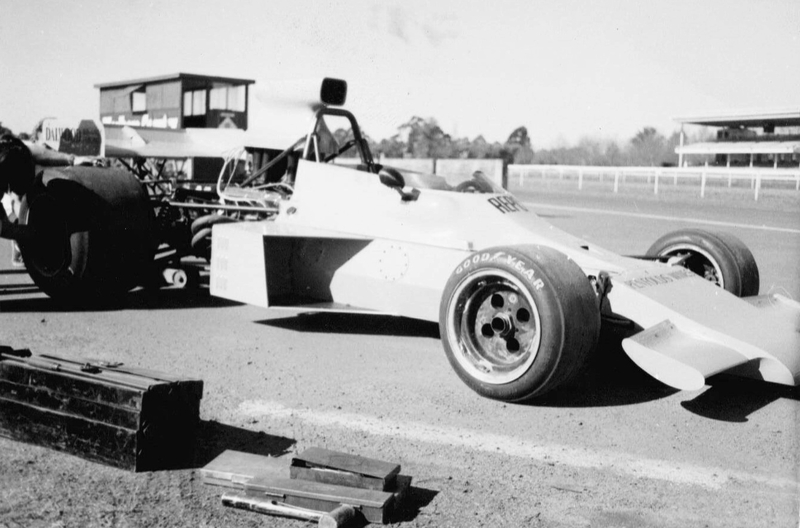 F5000 was being mooted as Australia’s next ANF1, the 2.5 Litre Tasman Formula waning. 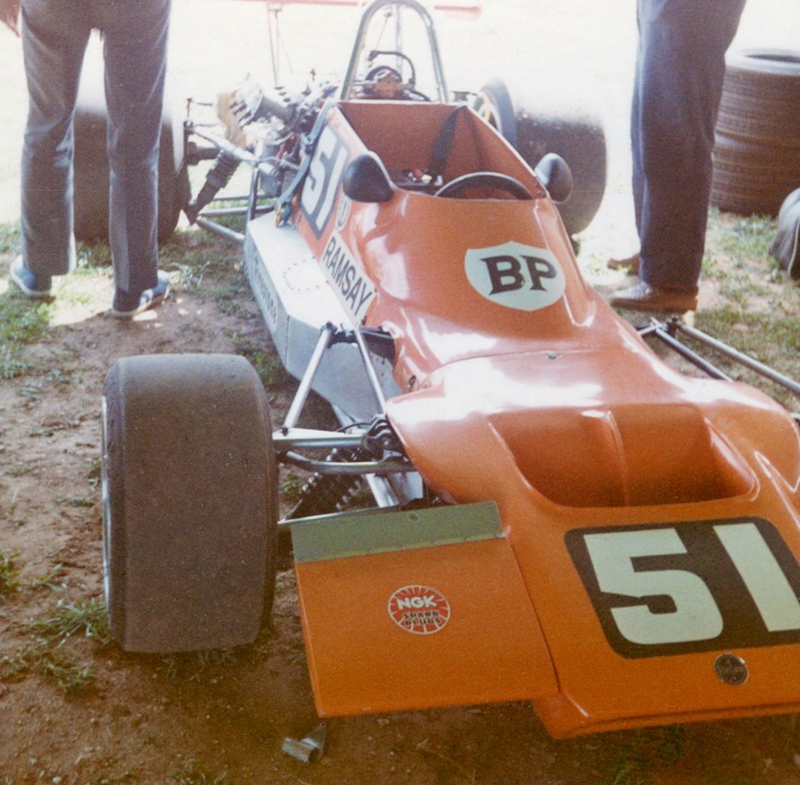 If ever a single seater class were tailor made for Matich it was this, and so it was that Matich imported the first F5000 to Australia, his McLaren M10A Chev arrived in Sydney in August 1969. 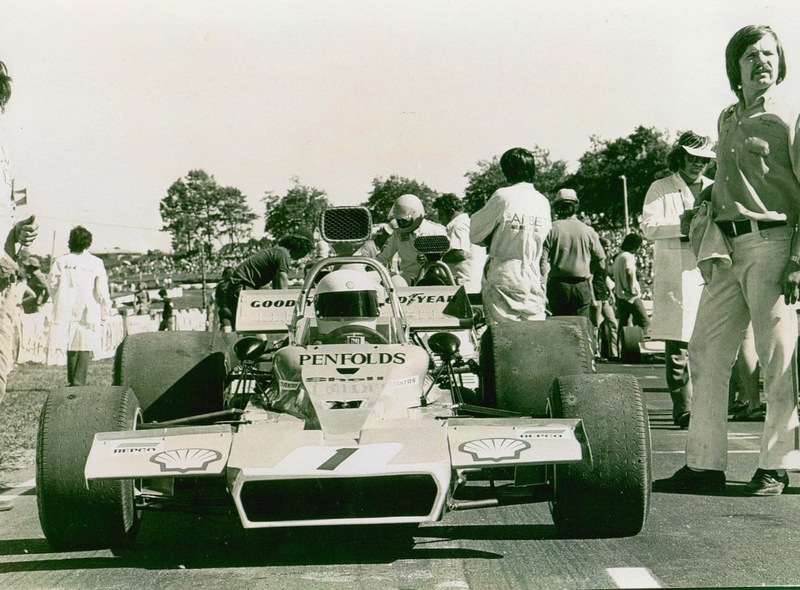 FM’s move was a big one as he imported the car before the decision by CAMS had been made, politically it was smart as it added to the pressure to go the F5000 route. 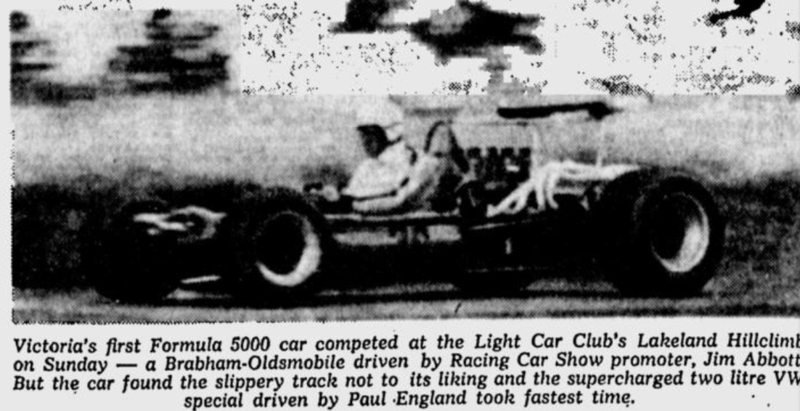 It’s an arcane point but perhaps the first competition outing of an ‘F5000 car’ in Australia was Jim Abbott’s Hillclimb of his ex-Gardner/Bartlett Brabham BT23D Traco Olds at Lakeland Hillclimb on Melbourne’s eastern outskirts on 31 May 1969? Melbourne ‘Age’ June 4 1969. DK recalls; ‘Frank’s first F5000 was a McLaren M10A (# 300-10), coloured pale yellow it arrived in Australia at the beginning of August 1969. 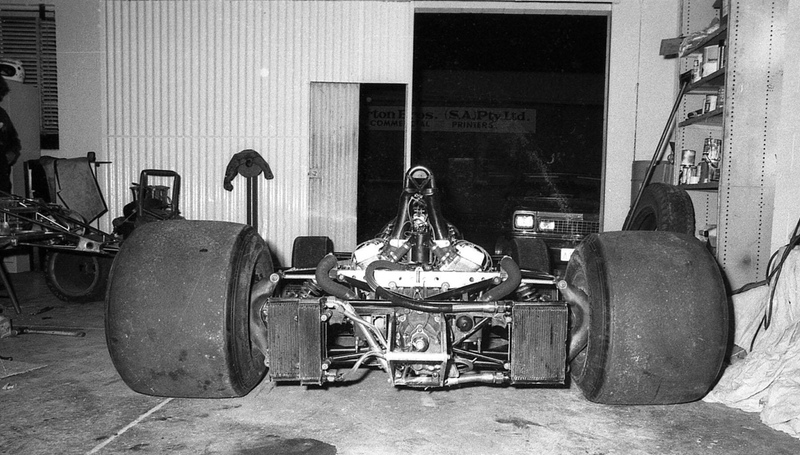 I crated the chassis at Frank Williams workshop before leaving for Australia, I arrived on 11 August’. ‘The engine was a Traco Chev on carbs Frank shipped from the ‘States. The chassis arrived at Frank’s Castle Cove workshop on 13 August. Peter Mabey and I assembled it, i made and mounted the rear wing. The car had an LG600 Hewland gearbox. It was first tested at Warwick Farm the Friday before it’s first race, Frank finished 3rd to the Mildren twins, Bartlett and Max Stewart’. ‘The week after the race we stripped the car down and painted the chassis two-tone blue, royal blue at the top, light blue at the bottom. The nose was reshaped to accommodate a lightweight aluminium radiator. 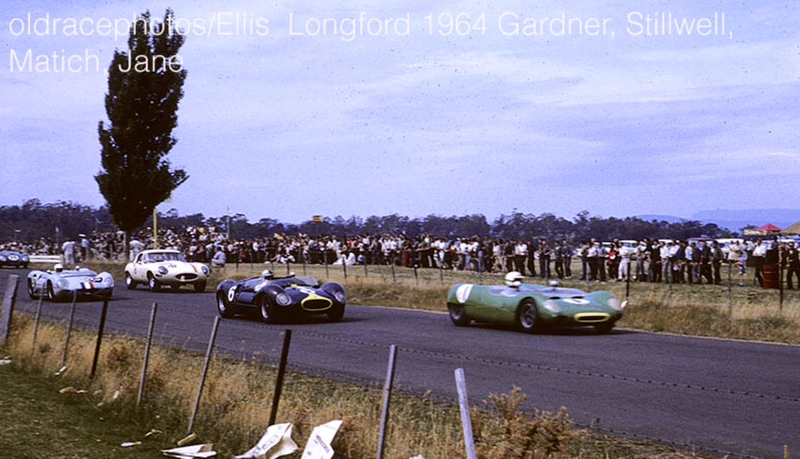 The car’s next race was at Calder in outer Melbourne, we tested it a couple of times at Amaroo Park before changing the engine spec to fuel injection and the gearbox to the smaller, lighter Hewland DG300 before the 1970 Tasman Series in which Frank competed together with the 2.5 litre Tasman cars’. 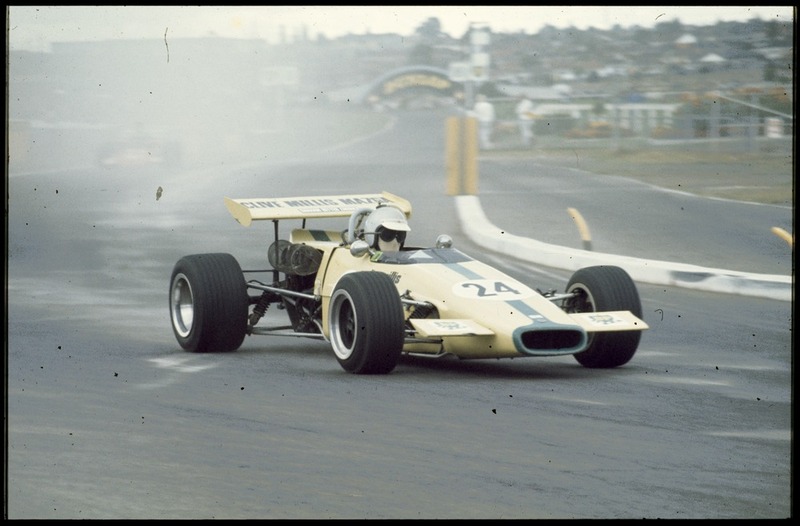 1970 was a transition year in Australia, whilst that summers Tasman Series was for both Tasman 2.5 and F5000 cars the Gold Star series was for Tasman 2.5 cars only albeit the Australian GP that November was for both categories. Go figure? The choice of our next ANF1 between 2 Litres (Euro F2 became 2 litres in 1972) and F5000 was fraught and so was the transition to F5000 once CAMS made that choice. 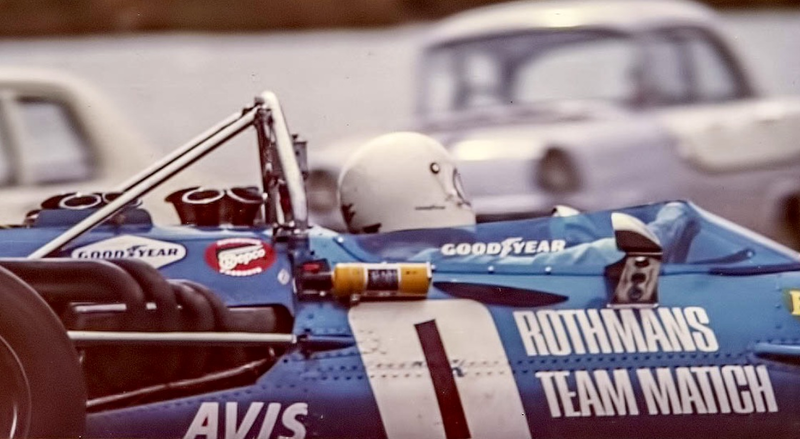 With more luck Matich could have taken the 1970 Tasman, he started in NZ with a bang; 3rd in the first round at Levin, he won the NZ GP at Pukekohe and on Wigram’s airfield circuit the following weekend. 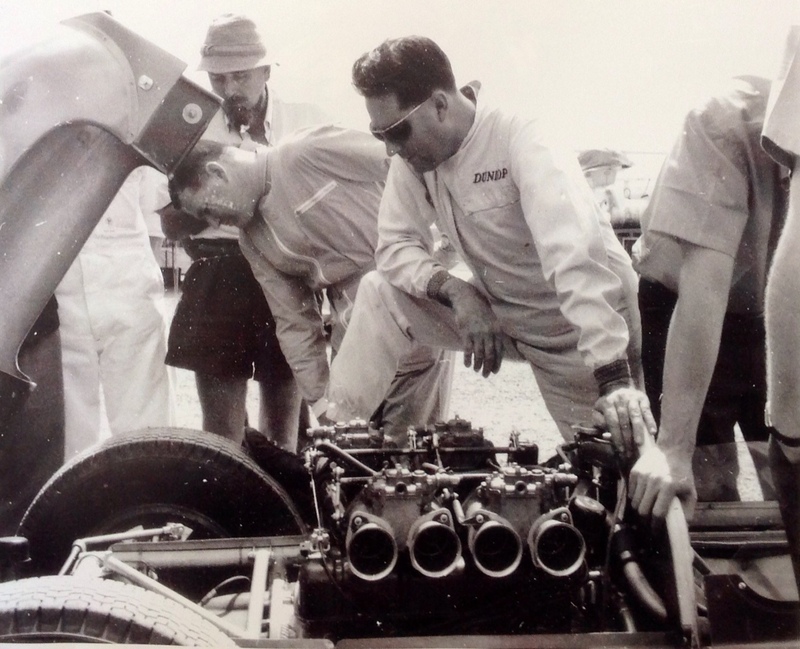 The team missed the Teretonga round to give them time to rebuild their only Chev engine which had done nearly 1000 miles, before the three Australian races. These were as bad as the Kiwi ones were good! FM was 4th at Surfers, broke an upright at his home track, Warwick Farm and then had a throttle cable break at Sandown’s final round. 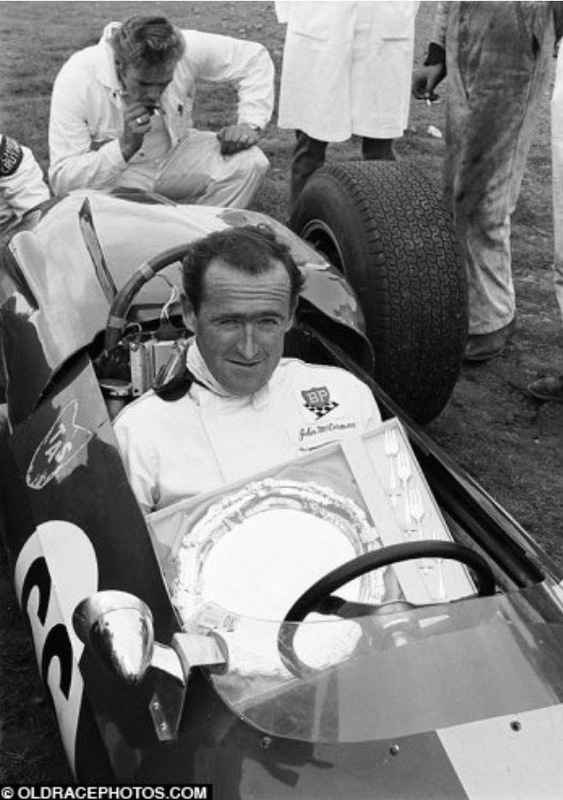 Graeme Lawrence won the title, the Kiwi drove the Ferrari Dino 246 Tasman car which won in Amon’s hands in 1969. This engine, designed by Phil Irving, also the designer of Repco’s ‘620 Series’ V8 which won Brabham’s 1966 World Titles, promptly won the 1970 AGP, having made its debut in Matich’s new McLaren M10B (#400-10) on 12 July at Warwick Farm. Matich won the AGP from pole also taking fastest lap, close to a perfect weekend. Niel Allen’s M10B Chev was 2nd and Graeme Lawrence’ Ferrari Dino 246T 3rd. The new Matich McLaren M10B Repco looked a good bet for the 1971 Tasman Series but Graham McRae had a very potent M10B of his own which was continually modified by McRae in a successful UK F5000 campaign in 1970. The Series was dominated by these 2 drivers and Niel Allen who showed his mettle with 2 wins in his M10B. He took the NZ GP at Pukekohe and the Teretonga round with his well developed chassis and powerful Chev, both courtesy of Peter Molloy his race engineer. McRae took wins at Levin, Wigram and Sandown and the title by 4 points from Matich. Frank had great reliability from his new Repco, if not quite as much ultimate grunt. He won at Surfers, was second at Pukekohe, Wigram and Teretonga and took third at Sandown, he was only out of the points in two rounds. 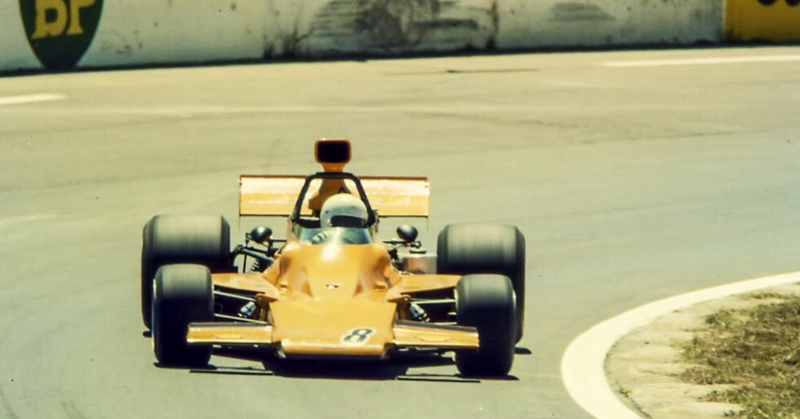 Matich took his McLaren, razor sharp after it’s 1971 Tasman campaign to the US L&M F5000 championship, taking in the first two rounds at Riverside on 25 April and Laguna Seca on 2 May. He won and finished second in this ‘hit and run campaign’ before heading home to Australia, much to the relief of the series regulars! DK;’ We took the whole equipe to California, we shipped the car by air and the truck and trailer by sea. We based ourselves at Carroll Shelby’s workshop in LA, it was there we met Carroll Smith who team managed our campaign in the US in 1973. 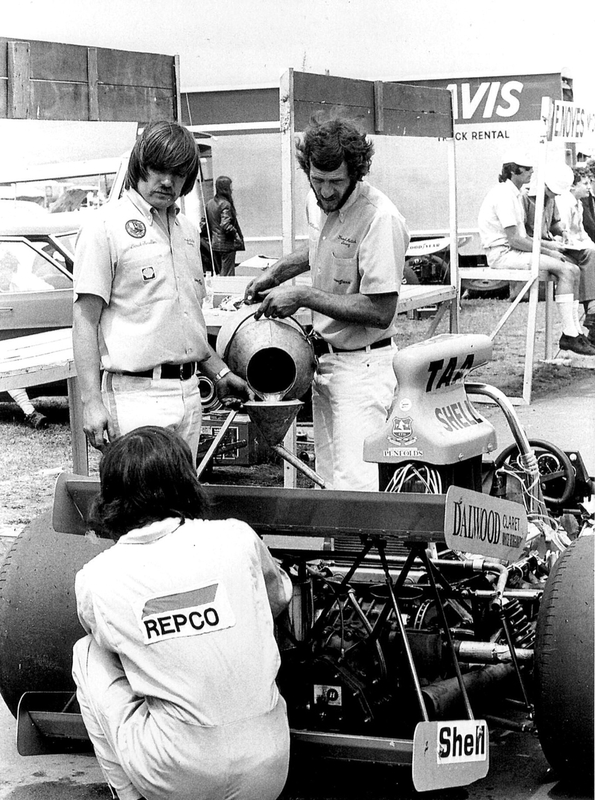 We only had 1 Repco engine though, it was relatively early in the Repco program remember. The engine had done the 2 US meetings and plenty of testing. That and the fact that FM had commitments to sponsors back in Australia meant we had to come home’. In a busy year Matich contested some rounds of the 1971 Gold Star series. He missed the first round at Lakeside, not yet back from the US, Bartlett took the win in his M10B. He crashed the car before the Oran Park meeting on the Thursday, a Lotus 7 inadvertently getting in his way and doing enough damage for the car to be retubbed. He bounced back to win at Surfers in August in the newly rebuilt car now dubbed M10C in deference to its various Matich mods and chassis repair in Australia. He retired at Warwick Farm and at Sandown with jammed throttle slides, Bartlett again winning. He didn’t contest the Symmons Plains and Mallala rounds. Max Stewart took the title with one win but a mix of speed and reliability gave him a 1 point victory for the title over Bartlett, who won twice. Matich’s McLaren M10B/C was raced in both Australasia and the US, the car an amalgam of his teams ideas and feedback via a development program with Trojan Industries in the UK, the makers of customer McLaren cars. 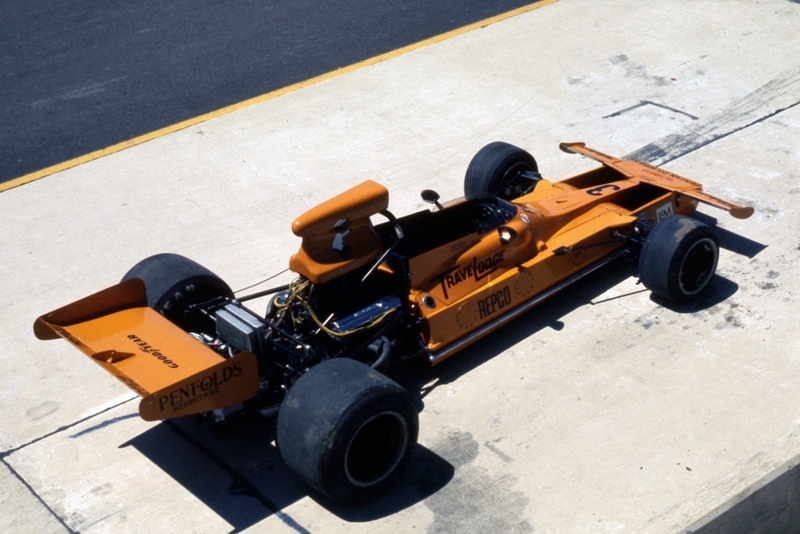 Matich had learned all he needed to know about ‘what makes an F5000 tick in 1969 and 1970’ ‘We’d developed the McLaren as far as it would go. 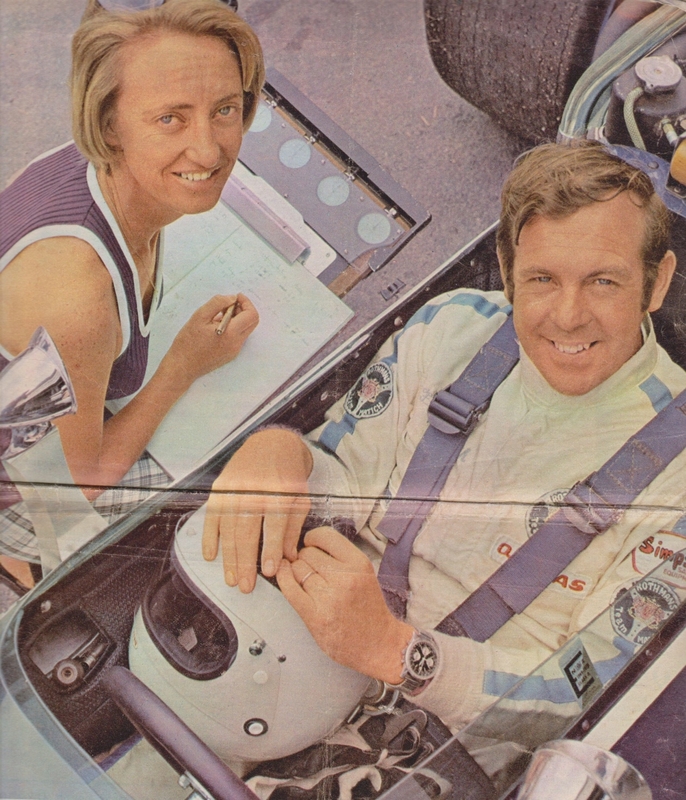 It was time to move on to something else’, Matich told John Smailes in an interview for ‘The Australian Motor Racing Annual’ in 1971. 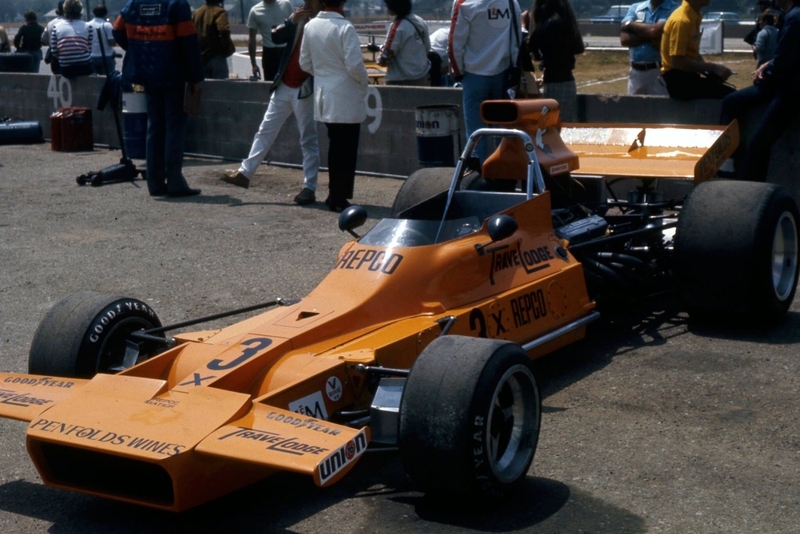 In terms of the cars design principles FM’…wanted as durable and maintainable a car as possible with inbuilt strength far greater than many F5000’s being built today’. Economy of maintenance was important, the Matich ‘triangulated monocoque’ ‘built on the same principles as a space frame-with the same comparative ease of repair and maintenance’. Frank’s team had the capacity to build their own cars. The very successful SR3 and SR4 spaceframe sportscars were built by Matich and a group of subcontractors in Sydney and in Melbourne for the castings. The first drawings of the ‘A50’ were commenced by HN and FM in November 1970 a year before its victorious debut in the 1971 Australian Grand Prix. 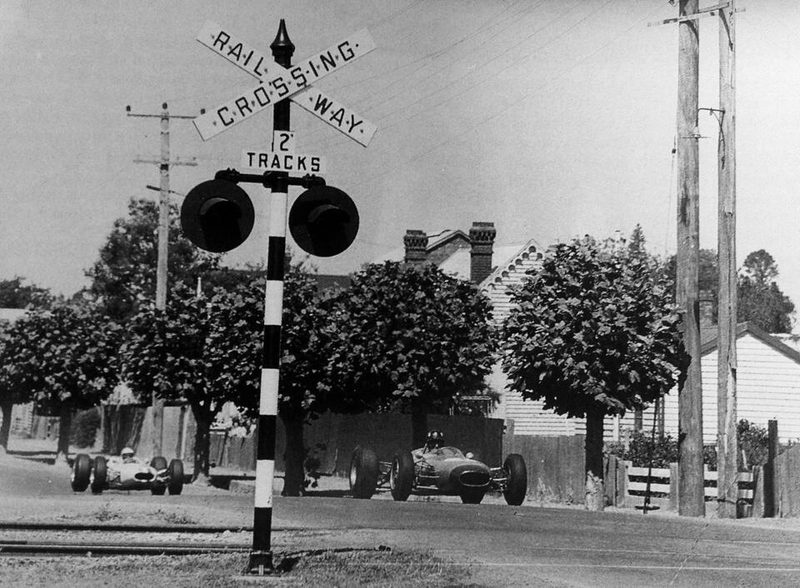 ‘A’ was for Formula A or 5000, ’50’ the number of years at the time the projects prime sponsor, Repco had manufactured automotive components in Australia. The car comprised ‘…three sections-a detachable front, central monocoque tub and detachable rear holding the engine. Eight bolts hold the rear (A frame) section in place, six bolts secure the front. In the event of an accident or undue flexing it’s a simple matter to bolt on a replacement section’, Matich said. DK;’ We didn’t have the necessary folders to work with sheet aluminium so John Joyce at Bowins (Bowin Racing Cars in Brookvale) did some of that work and built the unique to A50 ‘001’ front and rear bulkheads which were Tig welded. Peter and i built up the tub and HN made most of the suspension components in nickel bronze. I wanted them Tig’d and grumbled about that, the first suspension and spares were nickel bronze welded’. The clever part of the cars design was this ‘modular concept’. 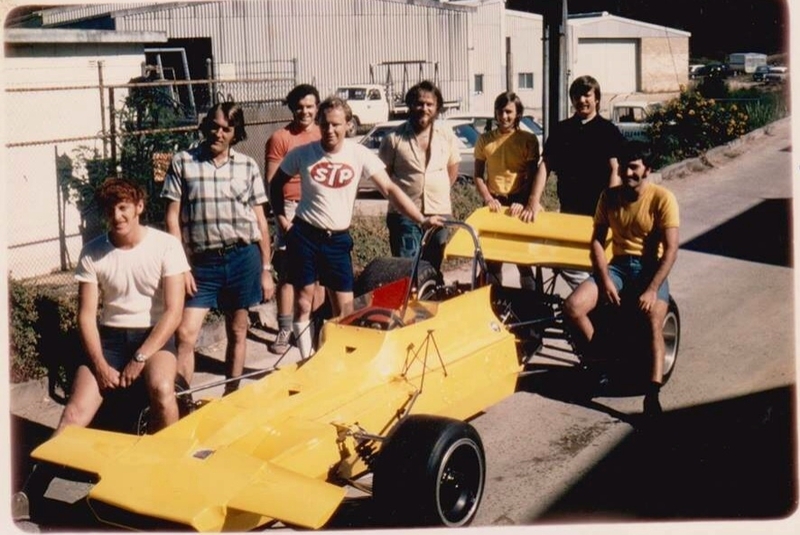 During the F5000 program the team built 6 monocoques; 3 at the Brookvale workshop behind the Brookvale Mall shopping centre 17 Km from Sydney, the other 3 were built in a batch by the Commonwealth Aircraft Corporation (CAC) at Fishermans Bend, 6 Km from Melbourne in early 1973. The cars remained competitive throughout the formula by the team ‘playing with’ weight distribution, track/wheelbases and aerodynamics (later cars were side-rad/chisel noses) by the use of different front and rear fabricated sheet steel detachable sections, bellhousings and of course bodywork and wings. All the while using the same tub design from 1971 to 1974. Noting the A53 won the Australian Grand Prix in John Goss’ hands in 1976 and was still competitive beyond that…that their was nothing wrong with the tubs or the underlying design philosophy is clear. 25 gallons of fuel in total, is carried in the tubs side pontoons, the fuel contained in locally made puncture proof foam cells. DK;’ Frank wanted as much of the car as possible made in Australia, he was a real patriot in that way. We could have had the fuel cells made by Goodyear free via our tyre contract but instead had them made by a Dunlop subsidiary about an hour from Melbourne. It also gave us better control of the product’. Instruments comprised Smiths mechanical tach, oil pressure and water temperature gauges. 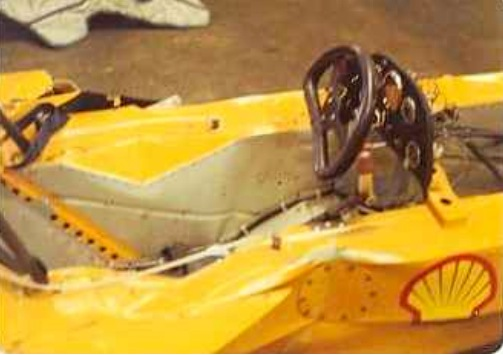 The gear change for the ubiquitous Hewland DG300 ‘box was on the right and the steering wheel was a ‘half moon’, round at the top and flattened at the bottom, sensibly, to ease access and egress into the car. The challenges of building cars at the time are interesting, FM ‘…The A50 was an extremely difficult car to build or to build accurately, we went through three draftsmen before we got the car completed’. You can never build a good car from the drawing board. You can build a pretty one-but not one which is functional. You can’t draw in three dimensions, at least not successfully. It’s very much a matter of trial. You build a tub, see if you like it and if you don’t you throw it away. It’s far more expensive but you get a better car in the long run’. 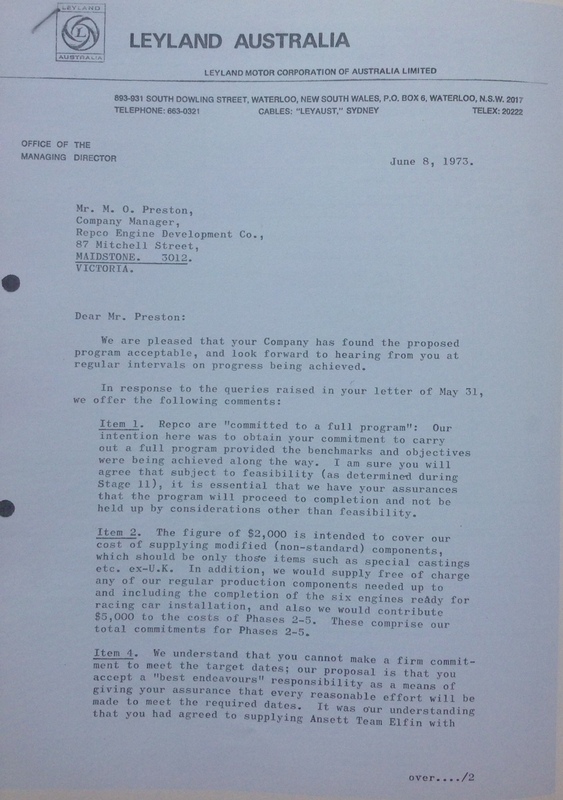 The days of CADCAM were still a long way off in 1971! The cars wheels were cast by the CAC in Melbourne; the rears in both 13 and 15 inch diameters and widths of between 15 and 17 inches. The fronts were 13 inches in diameter with widths of between 10 to 11.5 inches. 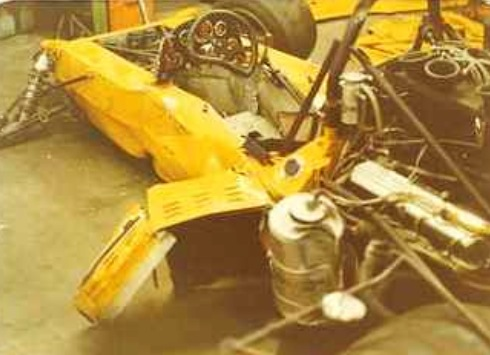 Front suspension was identical in layout to the SR4; FM ‘unequal length wishbones with the bottom arms reaching forward to the bottom of the radiator and the top arms swinging backwards to the chassis bulkhead’. The rear suspension used, typically for the day, a single top link, twin parallel links at the bottom, twin radius rods for fore and aft location and coil spring damper units. Shocks were Koni double adjustable alloys and adjustable sway bars were fitted front and rear. Steering was by Matich rack and pinion, again cast by CAC in Melbourne. 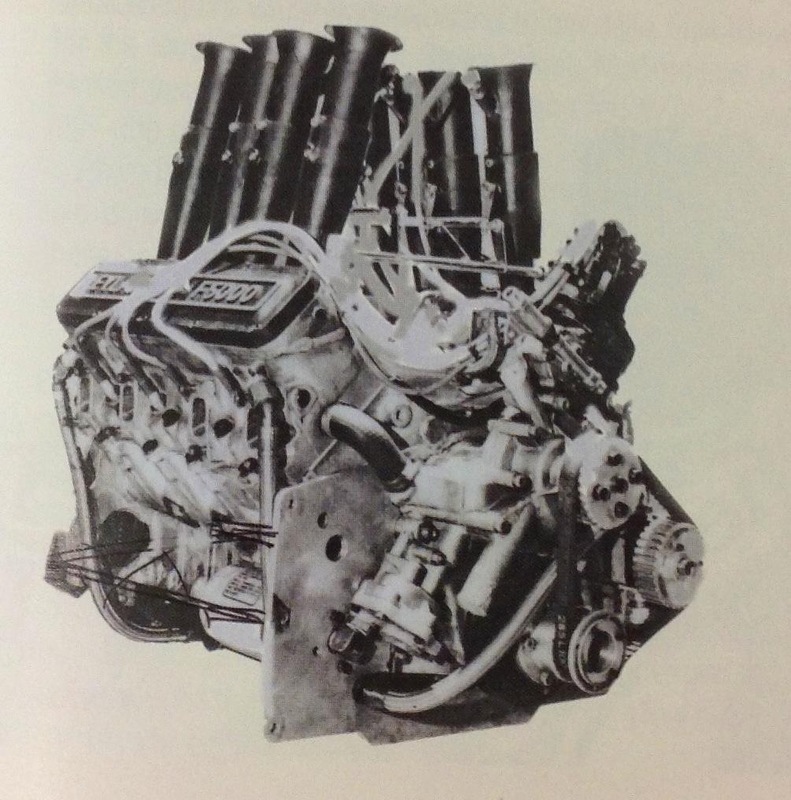 The cars engine was the Repco Holden F5000 unit, designed by Phil Irving, based on Holden’s then new production ‘308’ V8, the engine a story in itself. 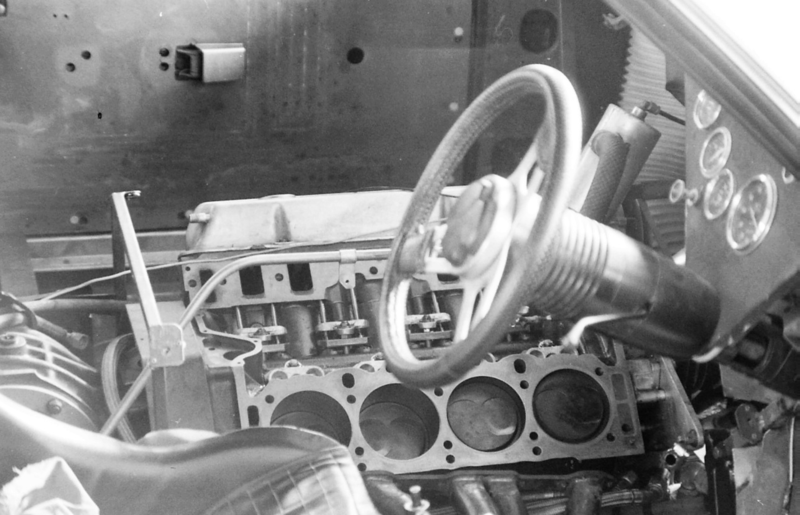 Matich was Repco’s factory driver, the engines also available for sale or lease to customers, and gave ‘460-470 horsepower at 7200 revs’ at the time. DK;’ The A50 was finished on the Thursday before WF. We did 25 laps bedding in brakes, tyres and the engine and FM simply ran away with the race’. Graham Howard’s ‘History of The Australian Grand Prix’; ‘If the pundits thought that Frank Matich’s efforts in getting a brand new car to run faultlessly (and fastest) in practice was a remarkable effort, they-along with everyone else at Warwick Farm-were stunned with what he and his A50 did in the race. And that was to lead flag to flag, have no-one seriously challenge him, set the fastest lap, slow by up to two seconds a lap in the later stages and still beat his nearest rival home by a fraction of a second less than 1 minute, or 2/3’s of a lap’. Bartlett and Alan Hamilton were 2nd and 3rd in their M10B Chev’s. Gardner’s Lola T300 didn’t contest the race after a jammed throttle and ensuing prang in practice damaged the car. 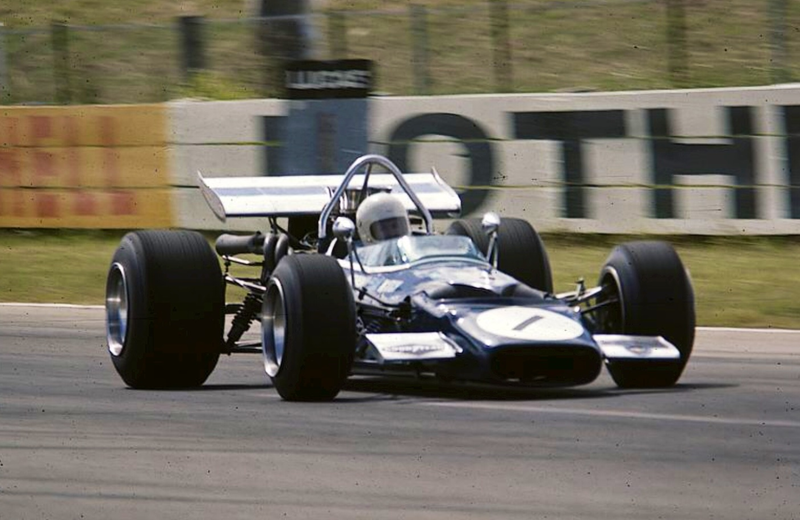 John Surtees competed in his own TS8 Chev in a field of depth comprising both F5000 and 2 litre cars which were always quick on the tight, technical, testing WF layout. 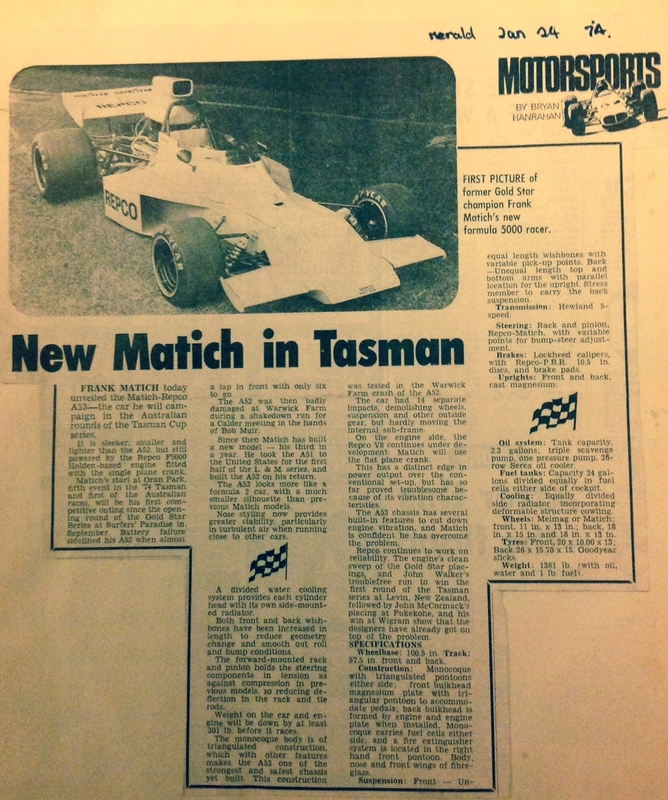 The 1972 Tasman Series I covered in brief earlier in this article. Ditto the 1972 Gold Star. 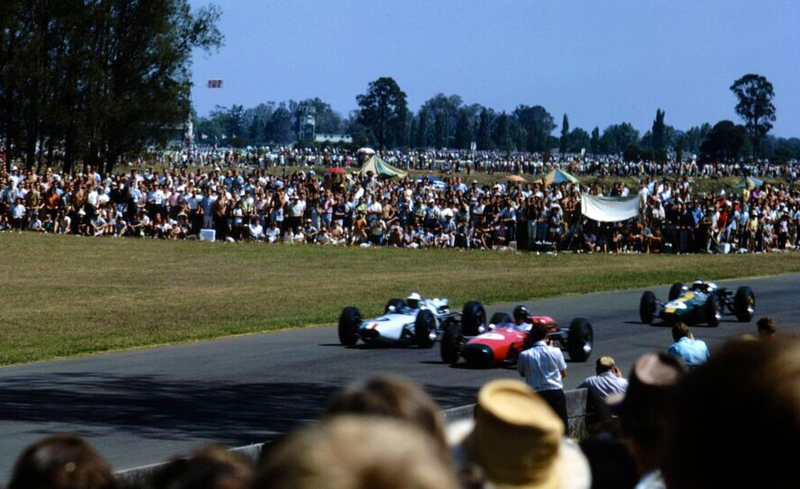 Therefore the A50’s performance in those Championships we have already covered way back at the start of this epic…. Equally good bets for the 1973 Tasman Series were Matich and McRae, the former fresh from his ’72 Gold Star win and continually developed A50 chassis. 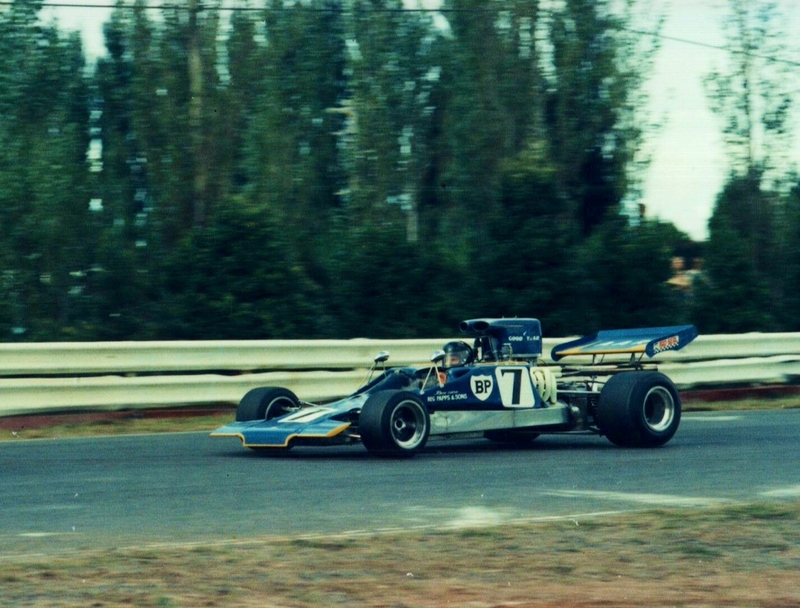 McRae took victory in the ultra competitive 1972 US F5000 ‘L&M Championship’ and was armed with a new GM1, an update of the prior years Leda LT27. And so it proved that McRae took his third Tasman title on the trot, Graham finished with 40 points, John McCormack 2nd on 29 points in the ageing but fast Elfin MR5 Repco with Matich, the ‘factory Repco’ driver 3rd on 27 points in his A50. 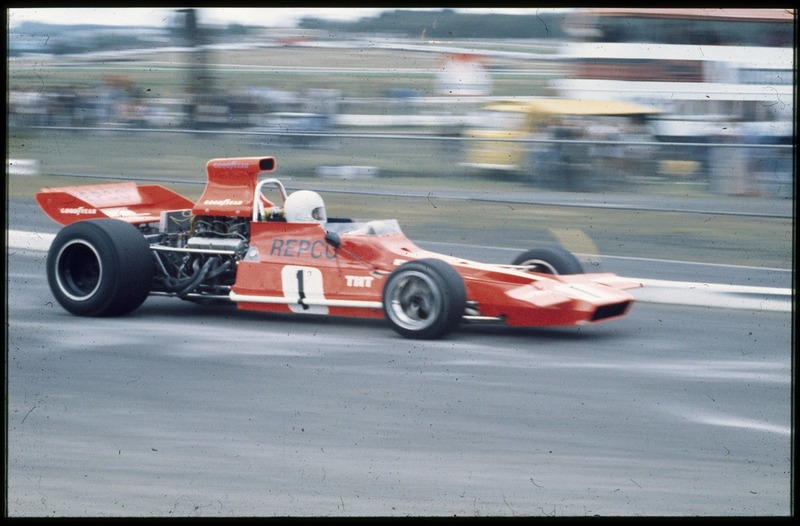 The ’73 Tasman was the most open for years and demonstrated the depth of F5000 fields and plethora of competitive chassis; Allan Rollinson won in a customer McRae at Teretonga, Steve Thompson in a Firestone shod Chevron B24 at a very wet Warwick Farm. Wins for Matich at Surfers Paradise, McRae at Levin, Wigram and Sandown and McCormacks two Elfin MR5 wins at Pukekohe and Adelaide, the first and last races of the series showed no one chassis was dominant. 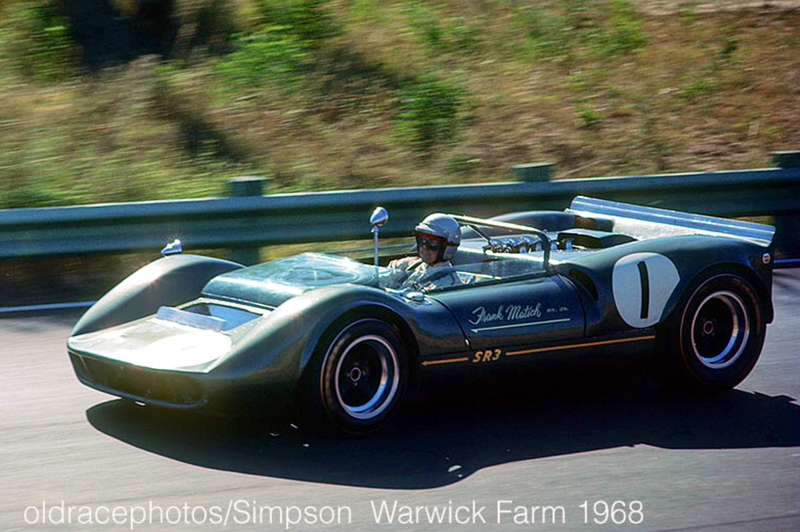 Max Stewart made a strong debut for the very first Lola T330. ‘HU1’ was Frank Gradner’s prototype, was works entered and supervised by FM during the series. Max was quick, it was a Lola T330 and Jody Scheckter onslaught Matich would encounter in the US in 1973. DK; ‘At Pukekohe FM was on pole and lead but then had an accident. He put a wheel onto the makeshift chicane, and bent the steering arm, it was a race we should have won. At Levin we were 2nd. At Wigram 4th with an engine misfire. At Teretonga we started on wets, the weather improved, we changed to dry tyres then it rained and FM spun. At Surfers we won from flag to flag. At Warwick Farm Steve Thomson’s Firestone wets won the day, FM was 2nd. At Sandown the car was 4th with a puncture and in Adelaide he retired with fuel pump failure’. 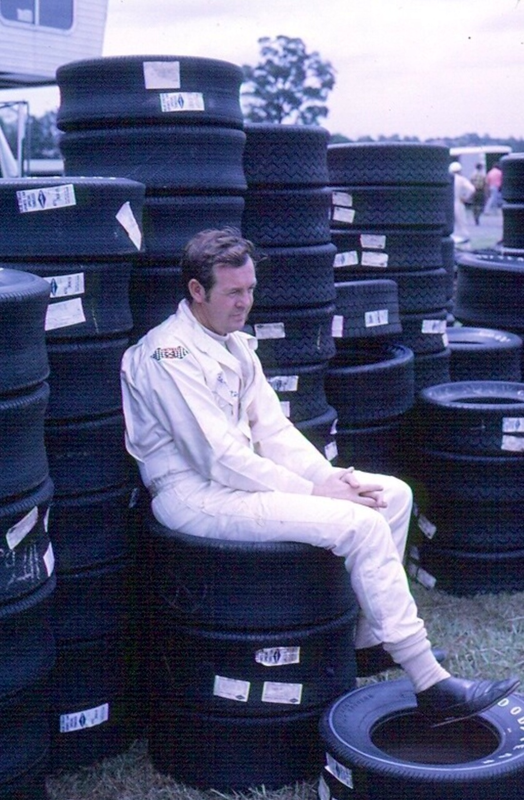 The new cars incorporated all of the teams knowledge racing the A50, FM’s role as a tester for Goodyear racing tyres, for whom he was the Australian distributor and the market intelligence gained in the ’73 Tasman Series. 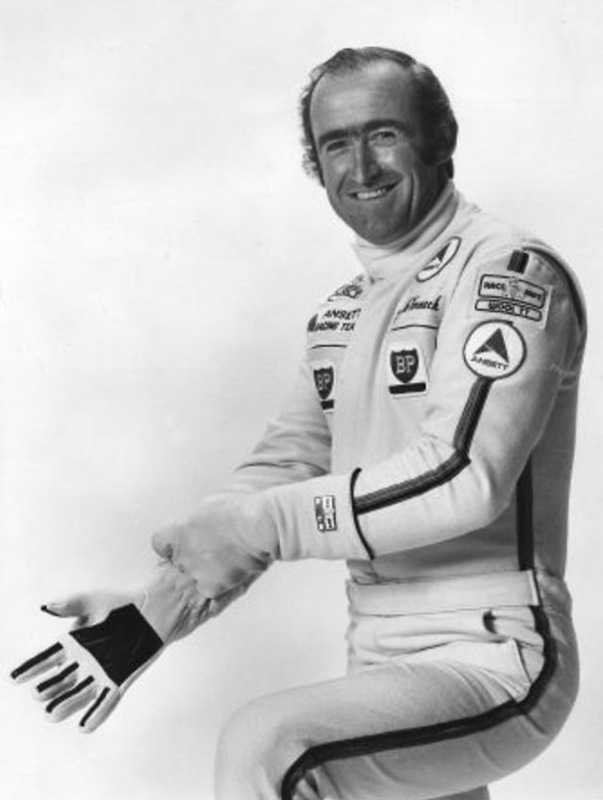 He knew the relative strengths of the Chevron B24/8, Lola T330 and McRae GM1, his primary competitors stateside that year. The challenge was to build a car to beat them and ship it to California before the first round on 23 April at Riverside. ‘In later 1972/early 1973 the Commonweath Aircraft Corporation (CAC) in Melbourne built 3 new chassis’ using drawings supplied by Matich. The CAC had spare capacity as the Vietnam War was over, they did a lot of aircraft maintenance work during the conflict. We knew them well from the castings they had made for us back to the SR3 days. After the ’72 Tasman the A50 was in Melbourne for the motor show. We then took the car to CAC at Fishermans Bend for them to look at, they quoted a price about a third of what it would cost us inhouse so we had them make the tubs for us’. ‘The first arrived in November ’72. 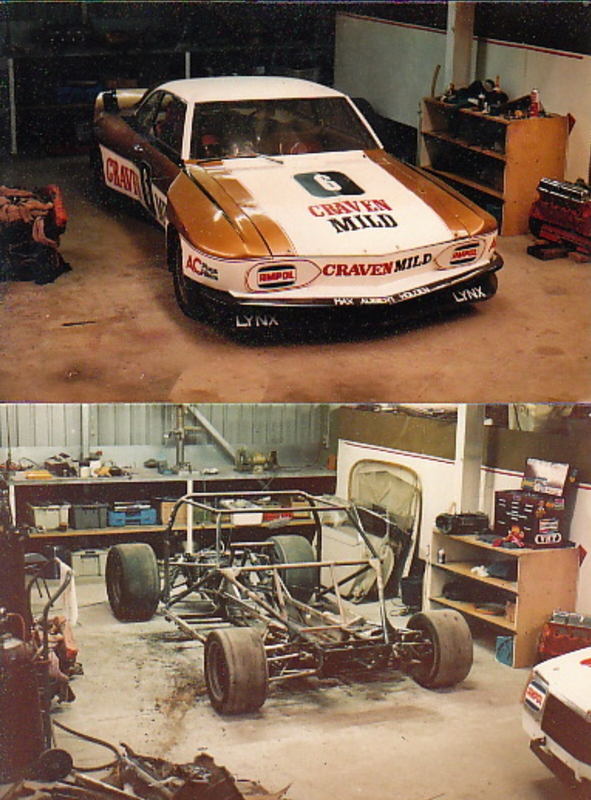 We started to build up a new car for the ’73 Tasman, FM even got a logbook for ‘005’ from CAMS but the project ran late mainly due to fuel cell delays so we used A50 ‘001/2′ again in the ’73 Tasman, which still had done maybe 15 meetings. No car was faster in Australia at the time’. ‘The tubs were basically identical to the A50 chassis (all 3 of which were built at the Matich, Brookvale, Sydney workshop) apart from a different riveting system; the skins were dimpled with a countersunk hole and countersunk rivets used to give a stronger joint and also a flush finish’. ‘These chassis were also lighter and torsionally stiffer than the previous ‘Brookvale’ monocoques, and came with a grey anodised finish to the inside skins’. Two of the three new tubs were built into A51’s, leaving one spare. 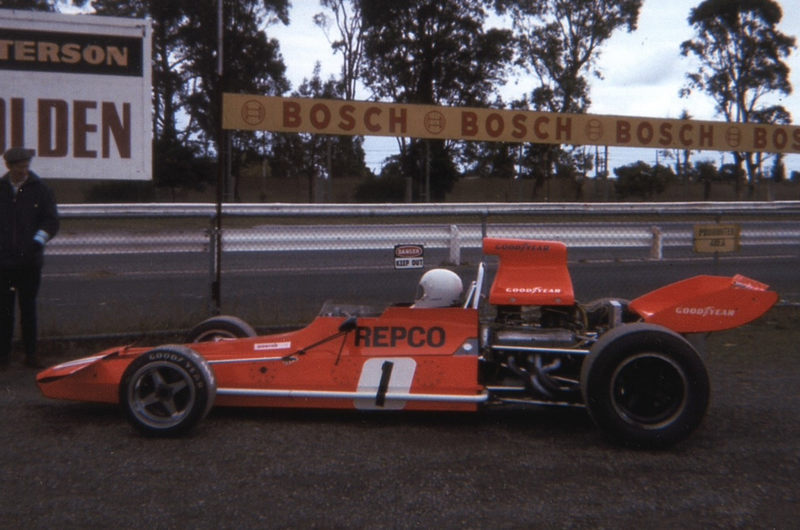 Derek continues’ A51 Repco ‘005’ was built in early 1973 in the Matich Racing Cremorne workshop in Military Road. It had a chrome roll hoop, the radius of the bend was smaller than the A50, (making the car easy to pick in relation to an A50 to the trained eye). There were changes to the front and rear suspension geometry and a redesigned rear lower suspension mounting frame compared to the A50. The radiators were the same light weight aluminium GM rads previously used on the A50. Onboard fire extinguishers were fitted. ‘We were the only team in the series that had a spare car. Both cars were prepared for FM’s use at all 5 races. 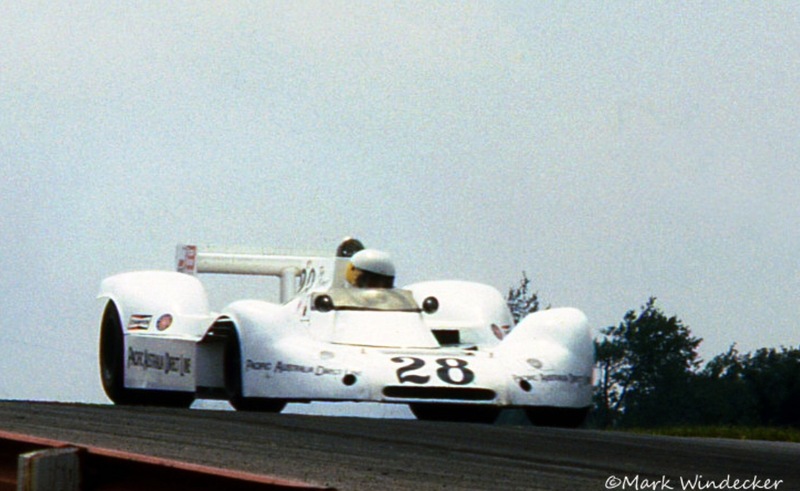 Frank set up and practiced both cars at all meetings, Vern Schuppan drove chassis ‘006’ in practice at Watkins Glen’. Gordon Kirby made the following observations about the Australian onslaught in his ‘Autosport’ Riverside race report; ‘Frank Matich’s capacious Early Racing Enterprises transporter contained two completed, brand new Matich Repco A51’s and like Brian Redman went equally well with each car…The A51’s have a couple of extra inches in the wheelbase as well as an engine which is half an inch lower than in the A50. With Carroll Smith directing the Penfolds Wine sponsored team, there was a lot of experimentation going on throughout the week. The cars went from brand new to fully race worthy in an incredibly short space of time; so much that Matich didn’t select which of the equally competitive cars to race until Sunday morning’. In fact Matich’s ability to choose between 2 cars of which to race, FM wanting to compete in each of the 2 heats with different cars, and then make his chassis choice for the final, lead to ‘The Matich Rule’ to disallow just what FM proposed! 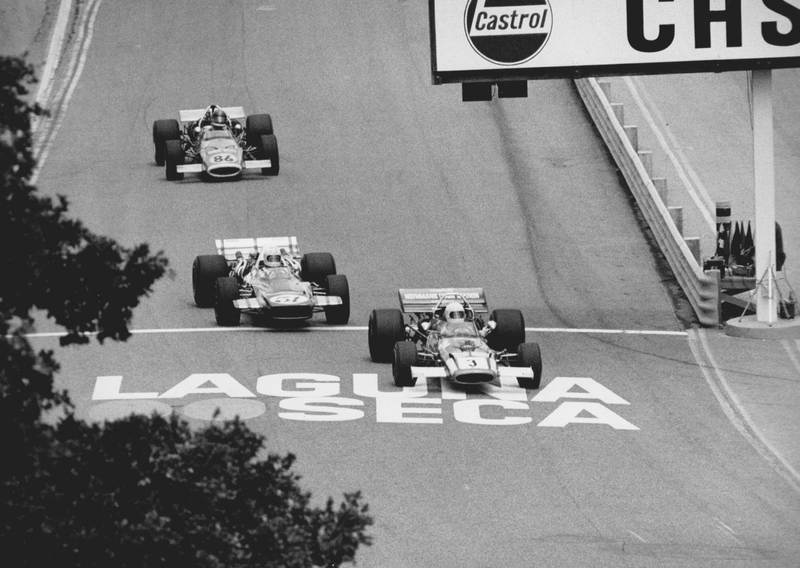 The A51’s were fast, but the ‘game changing’ Lola T330 (and it’s 1974 T332 successor) was the greatest F5000 car ever. Full stop. Coupled with the speed of the Lola’s and the individual genius of Jody Scheckter in Ron Tauranac’s Trojan T101, Team Matich ran into engine problems, the Repco Holden engined cars oil systems not scavenging properly on the fast, long radius turns not encountered in Australasia. ‘The cars did not perform as expected we had a handling problem on the latest spec Goodyear’s and the bumpy nature of the US circuits. The tyres weren’t identical to those we tested before going to the US. FM wasn’t the only driver testing the F5000 tyres, the final production tyres we were presented were different, so we were playing catch-up. The cars were still as fast as any at Riverside’. ‘At the start of the season the A51 was as competitive as the T330 but its development accelerated with so many drivers and teams running and experimenting with the T330’s’. After the engine problem was sorted it was decided to redesign the chassis to overcome the handling deficiencies, hence the A52 design’. ‘The best A51 result was 5th at Michigan although Frank ran in the first 3 at the Riverside first round until he had gear shift problems’. 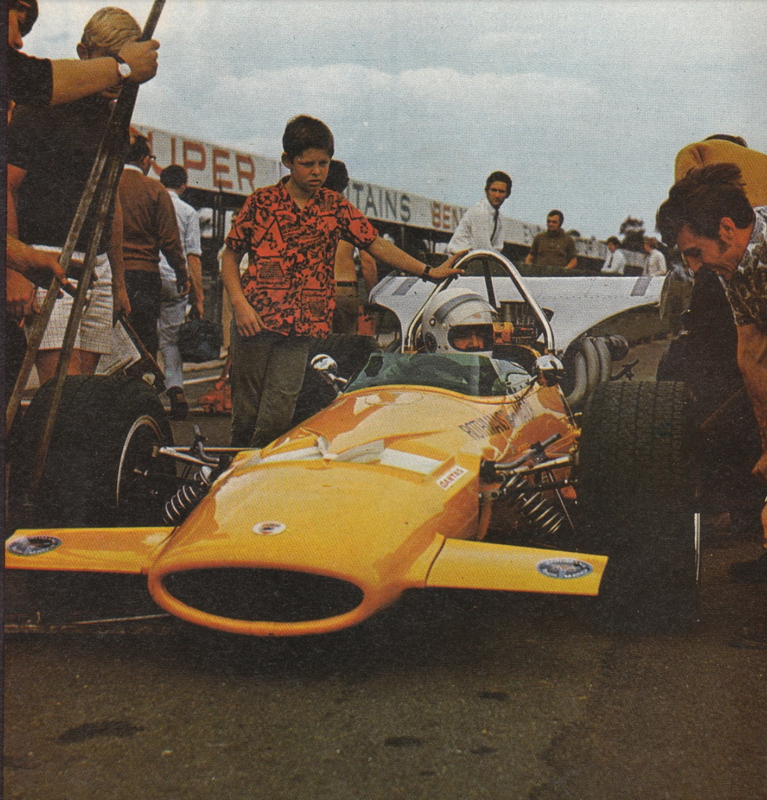 Brian Redman opened the T330’s account at the season opening Riverside round, Matich was 17th. 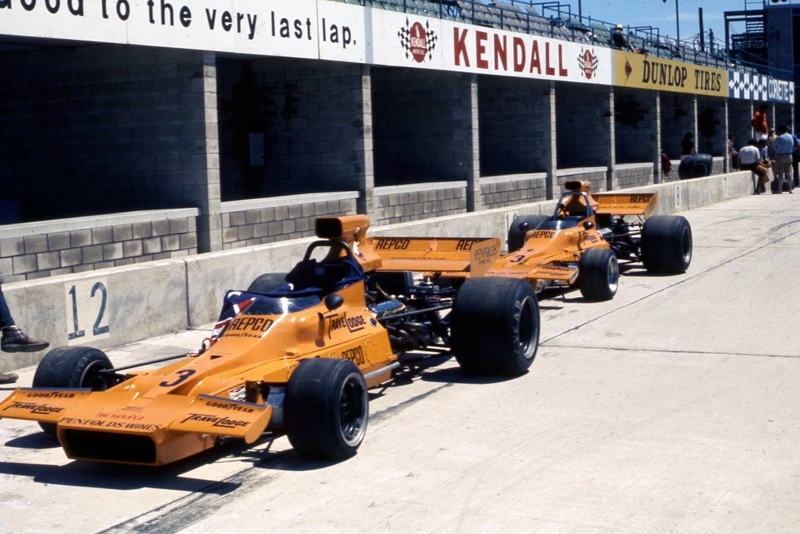 The team entered the Michigan, Mid Ohio and Watkins Glen rounds, in the latter the cars did not start as Kneller related. Jody Scheckter took the series driving the Trojan T101, he also drove a T330 in two rounds. 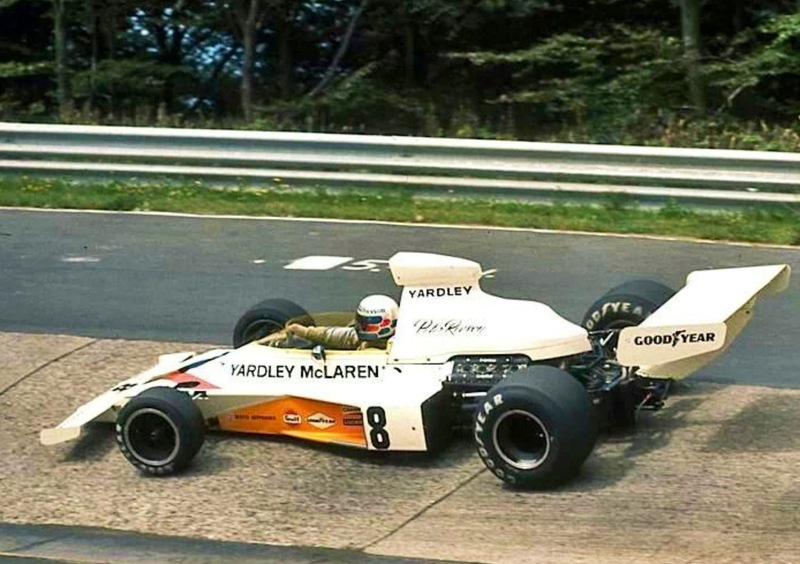 The Trojan was good but Jody was better, he made his GP debut in a Mclaren M23 later in 1973. 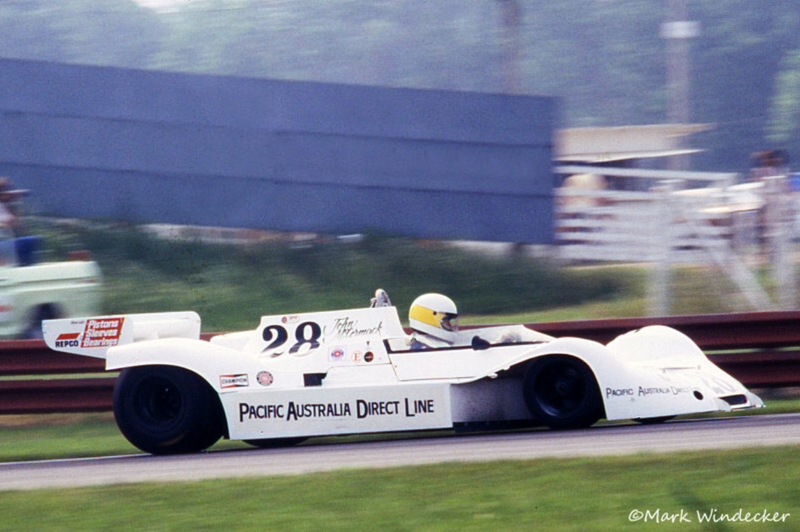 That year Aussies John Walker, Matich A50, Bob Muir, Kevin Bartlett and Max Stewart all Lola T330 mounted contested some L&M rounds. Their results and experiences would be an interesting story in itself, perhaps one Kevin Bartlett would be prepared to relate in a later article. Its a tangent too far for this already long piece. 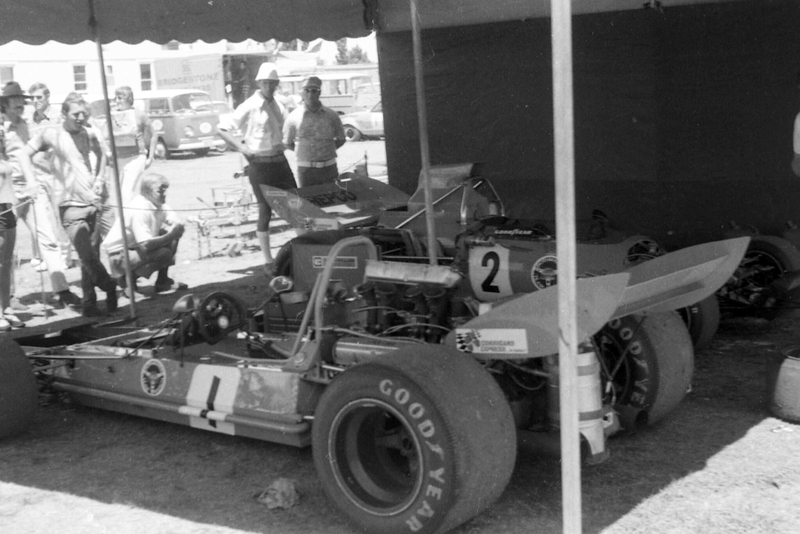 As DK relates above apart from the engine dramas, there were improvements to the chassis needed to remain competitive, the game had quickly moved on from the early Tasman months of 1973 as the US teams developed their cars from the production spec delivered by their English makers. DK; ‘The A52 was built using the A51 ‘006’ chassis and rear end but with a longer engine/gearbox adaptor (bellhousing) giving a 2inch longer (50mm) wheelbase than the A51, this was in line with the Lola T330′. ‘The radiators were moved to the sides of the chassis along with modifications to the engine water pump so that each radiator cooled the opposite side cylinder head and were shrouded with aluminum ductings’. ‘The oil tank was repositioned behind the lefthand radiator (from beside the cars gearbox, outside its wheelbase) and the battery moved from the front of the car to above the bellhousing’. 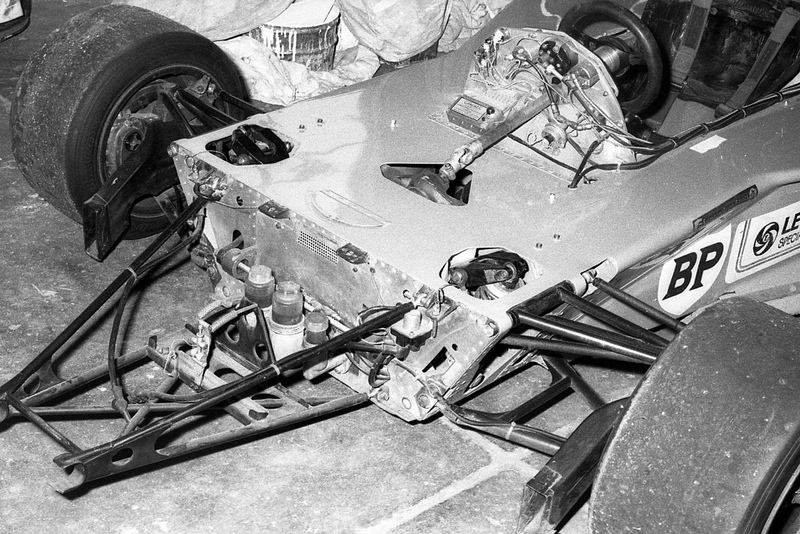 At the front of the chassis the steering rack was moved from the chassis itself to a heavily redesigned front subframe. The top pick up point for the shock absorber/spring assembly was raised approx 1 1/4 inch (30mm) along with a redesigned lower wishbone and new front uprights. These mods gave an increase in front suspension movement’. ‘To complete the design a chisel shaped nose made from fibre glass was added, the complete car was about 10 Kg lighter than the A51’. ‘The A52 was tested extensively by Frank at Warwick Farm during late July/early August 1973 with a hope of returning to the US series, but a problem with the sponsors in the US prevented this happening’. ‘The car was comprehensively destroyed in a test session at Warwick Farm in late September whilst driven by Bob Muir. The chassis was beyond repair, both outer and inner skins were damaged. The photos show damage from the car hitting the water-sprinkler system at Warwick Farm, 50mm diameter steel pipes at great speed’. ‘Frank was not happy as he had just left the circuit after a successful session and had let Bob have a drive to get another drivers opinion of the car, Bob had been driving a Lola T330 Chev in the US’. The death of the A52 was a bummer to say the least. Muir was happy to have had the prang in the strong Matich tub not a T330! Clearly the team were heading in the right direction with a car that was as fast or faster than the the best in Australia at the time; both Bartlett and Stewart were racing their T330 Chevs at Surfers on the day FM was running away with the ‘Glynn Scott Memorial Trophy’ and both were razor sharp having, like Matich, been racing in the US L&M. The A52 was undeniably fast, but the team now needed to build another car and again had the chance to make further changes from the A52 to a 1974 Tasman Championship contender, the series commencement only a few short months away at Levin, NZ on January 5 1974. John Mc Cormack won the first of his Gold Star’s in 1973 with fast, consistent performances in his evergreen, cleverly developed Elfin MR5 Repco. 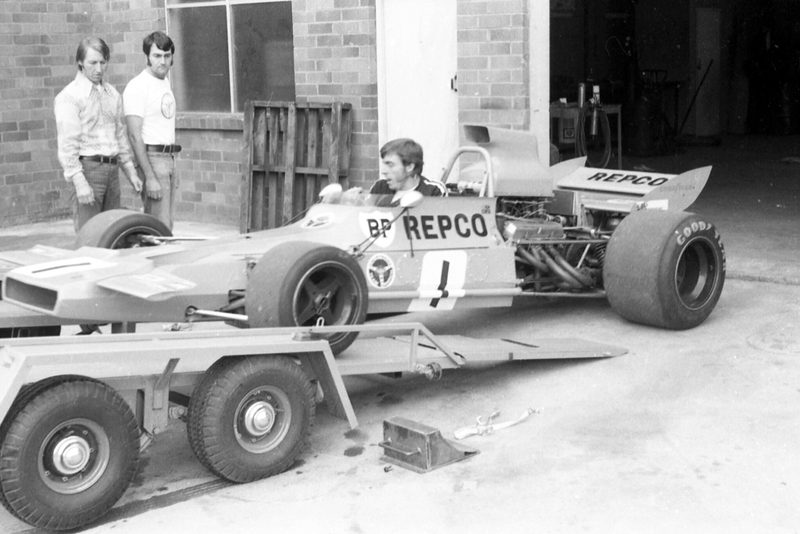 Garrie Cooper had built a new car, the Repco Leyland powered MR6, a superb, small car styled in the mould of the Tyrrell 006. The aluminium block V8 was around 100 pounds lighter than the Holden but, as was later to be revealed the weight reduction was offset by the inherent deficiencies of the engine itself. 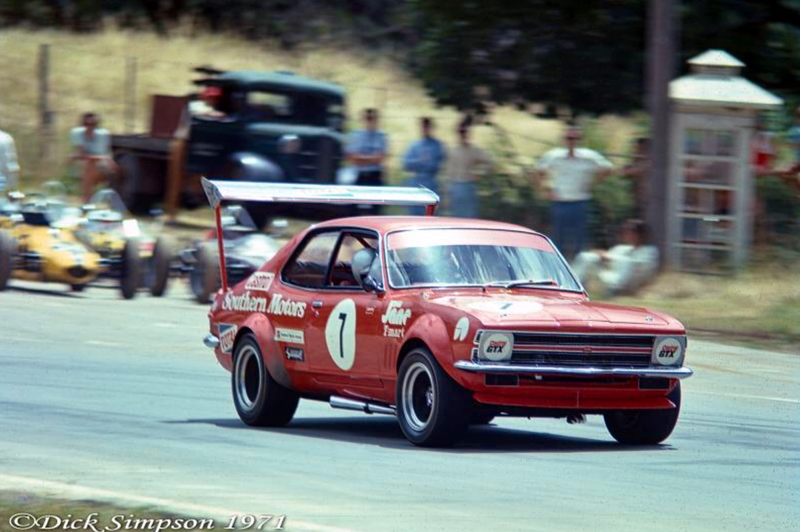 The MR6 would find success in 1975, but Repco Holden engined. In the meantime Mac’s old Elfin was a race winner in NZ in 1974. 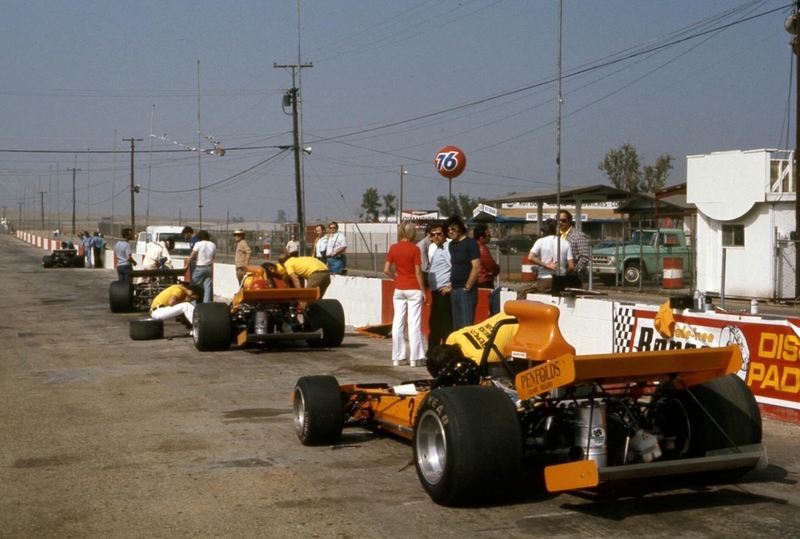 Bartlett, Walker and Stewart returned with their Lola T330’s. Unfortunately KB’s campaign was cut short by a Pukekohe shunt which broke his ankle, leg and hip. 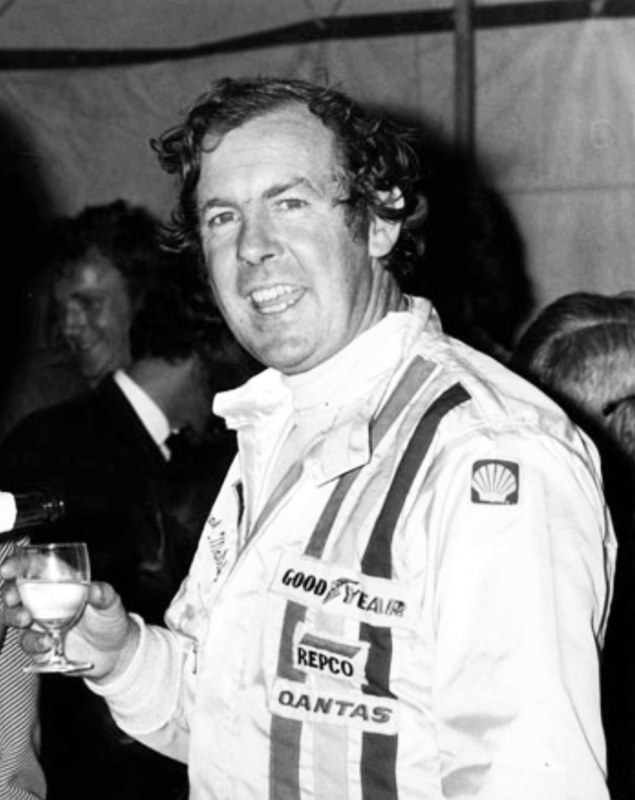 KB’s return to racing and his win at Bathurst with John Goss the following October was as heroic as Warwick Brown’s return to racing in the first production Lola T332 ‘HU27’ that summer of ’74. Warwick was hobbling around the Surfers paddock at the Gold Star meeting in September ’73, no way did i think he would be back in harness in January given his physical state then. But he was and won the final Tasman round in Adelaide. Former Kiwi Tasman champ Graeme Lawrence was back in another new T332 having run a 2 Litre Surtees in 1973, and himself survived an horrific accident in his then new Lola T300 in 1972. Lawrence, Bartlett and Brown were all foundation members of the ‘Lola Limpers Club’ and fortunately all are well and truly still with us! 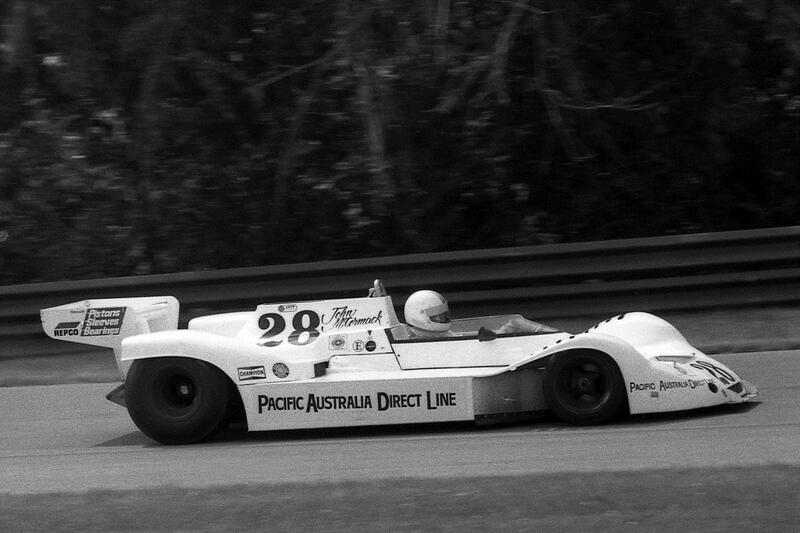 Graham McRae was back in the GM2, a superb ‘McLarenesque’ chisel nosed, side radiator car, which convincingly won the 1973 AGP at Sandown on 4 November. 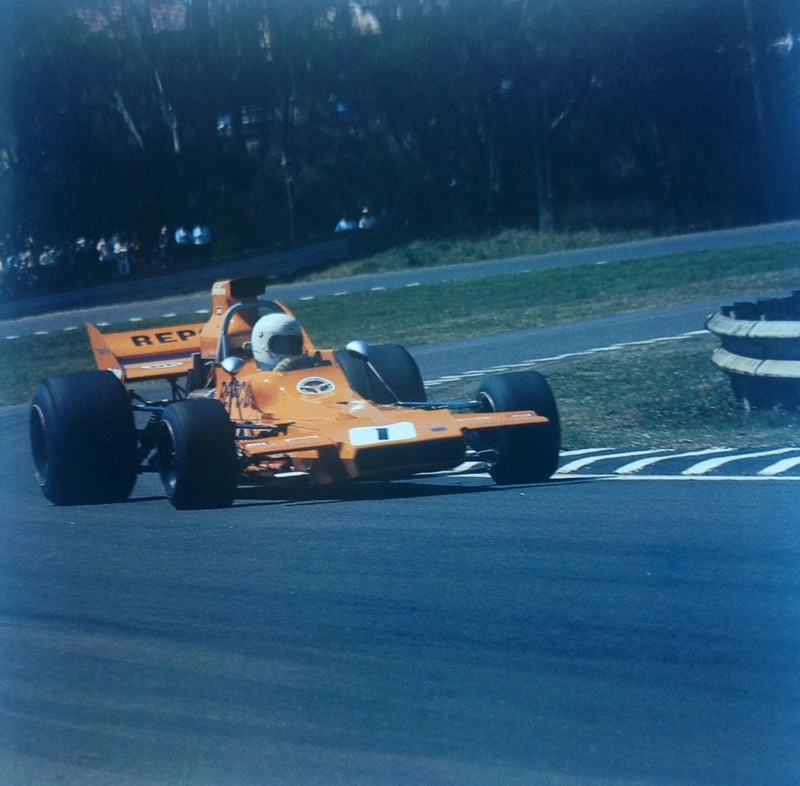 FM didn’t contest the ’73 AGP as Bob Muir had destroyed his mount, the A52. Count Rudi van der Straten was back again with Teddy Pilette and Peter Gethin in Chevron B24’s, both cars were converted to the latest B28 spec during the Tasman. 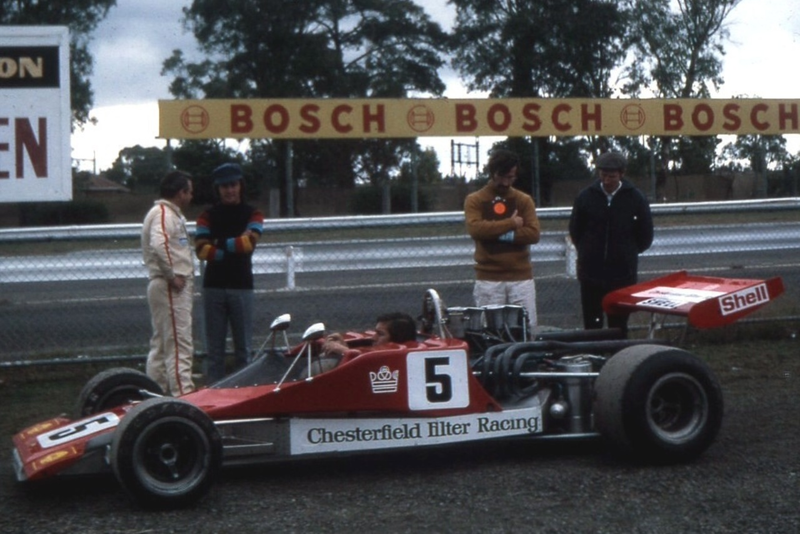 Perhaps the Series was slightly ‘skinnier’ in terms of international representation than 1973 but there was still a formidable field of top class drivers in the best F5000’s of the day. ‘The car was built using the final CAC tub and was a refinement of the A52. Both the front and rear suspension geometry was changed having longer wishbones to smooth out roll and bump conditions. The front subframe was redesigned to accomodate an improved steering rack mount and another inch was added to the bellhousing to give a longer wheelbase. New radiators to improve engine cooling along with new, longer radiator ducts were fitted. The fuel system was redesigned, the mechanical fuel pump was moved from its original position behind the distributor drive to a position similar to a Cosworth DFV, low down on the front of the engine driven by a narrow toothed belt from the front of the crankshaft. The A53 weighed 1361lbs (618 kilos) with oil, water and 1 gallon of fuel. DK; ‘Frank had been thinking about retirement during the last couple of months of 1973 whilst his wife, Joan was ill, he had placed ads in Racing Car News to sell all of the cars. The A53 was extensively tested by Frank in the run up to the 1974 Tasman series, but was not raced in New Zealand due to Joan’s illness. FM sent me to Pukekohe to check out the opposition’. 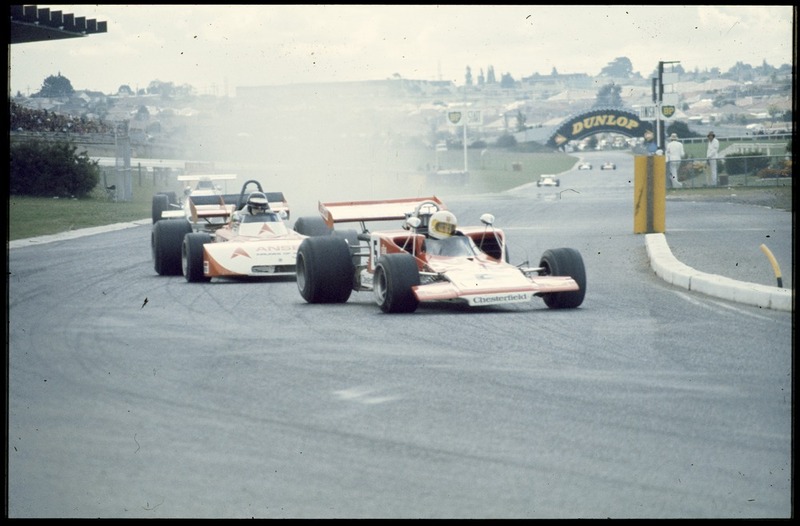 The Kiwi Tasman rounds were won by John Walker, he took the season opener at Levin in his Lola T330 Repco, Gethin then won at Pukekohe in the VDS Chevron. 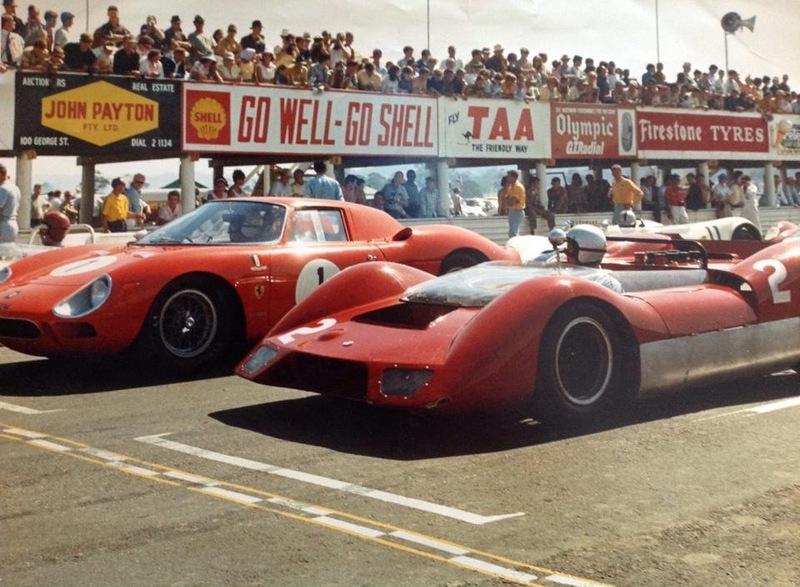 McCormack’s Elfin MR5 Repco won the NZ GP at on the Wigram airfield circuit and Max Stewart won at Teretonga in his Lola T330 Chev. 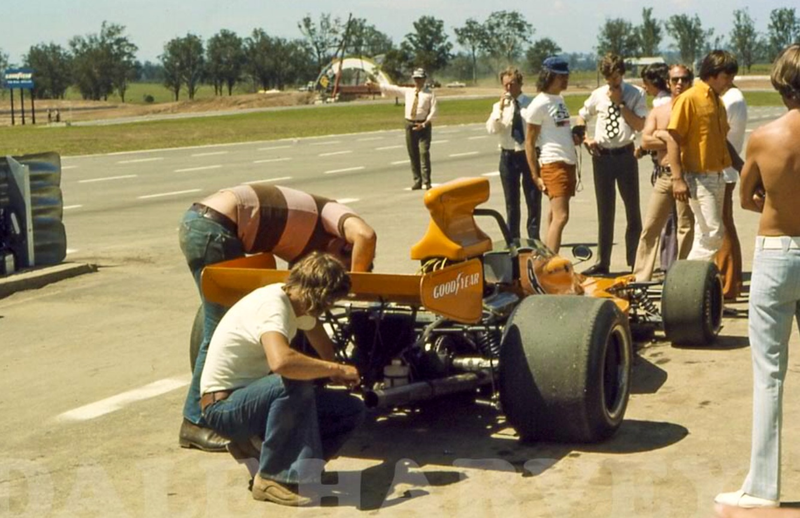 The series was wide open when the cars arrived in Sydney for the fifth round at Western Sydney’s Oran Park circuit. Warwick Farm, very sadly ran its last Tasman meeting the year before and had ceased to be used for motor racing. The A53’s race debut was the first Australian Tasman round at Oran Park on 3 February. 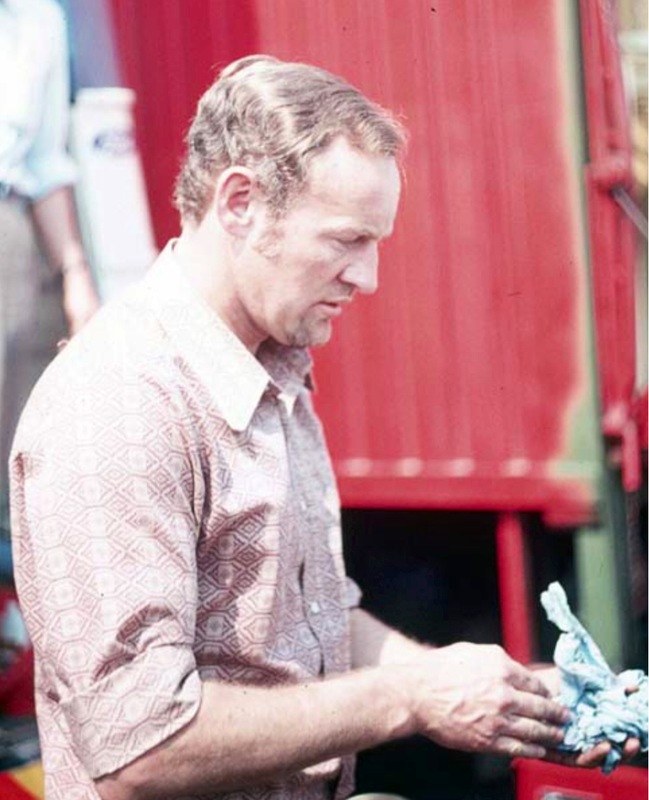 Kneller…’Early in the week before the race Frank had an accident with a small Honda generator on his boat, burning his left hand and his chest. He was electrocuted and was lucky not to have been killed, only the generator stalling prevented that. He practiced the car at Oran Park on the Friday but decided not to race as he was having trouble effectively driving the car and concentrating, although his times would have put him towards the front of the grid’. ‘Bob Muir was offered the drive, his times in free practice were very competitive. During official practice the engine suffered from fuel vaporisation. During pit stops the mechanical fuel pump was absorbing heat from the circuit tarmac causing a vapour lock in the fuel system. There was also an oil pump problem, Bob qualified at the back of the grid 5.5 seconds slower than his best time on Friday’. ‘The engine was changed overnight and a heat shield added around the fuel pump. Bob’s times in the Sunday morning warm up were on the pace of the front runners (low 40seconds). He started the race well and was up to eighth by lap 6 but retired around lap 70 with fuel pressure problems again’. The following week Frank had recovered enough to race at Surfers Paradise although he was still suffering from the burns to his hands. In a strong, gritty performance, he qualified and finished third behind the two Chevron B24/28’s of Pilette and Gethin. ‘For the third round at Sandown a new flat plane crank Repco engine was installed. Frank qualified second to Gethin and led the race for 15 laps. He was leading by over 6 seconds when the water pump pulley worked loose and the engine overheated. Frank pitted and retired to save the engine’. 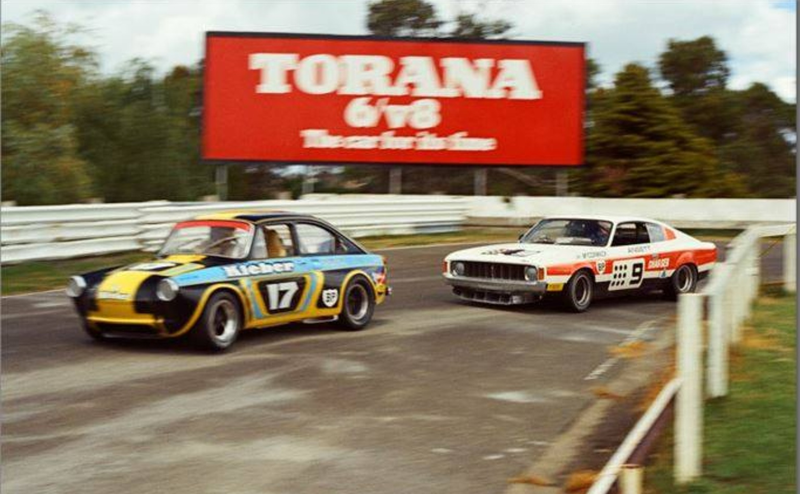 ‘The last ’74 Tasman race was at Adelaide International Raceway. A fresh flat plane engine was installed and in practice Frank was behind Max Stewart (FM 49.8 to MS 49.7). Frank ran second for the first 10 laps before spinning on some oil and falling back to seventh, he drove back up to second by lap 51 but a misfire set in when he was only 2.5 seconds off the lead, he then spun again while lapping a slower car, eventually finishing fourth’. ‘That was Frank Matich’s last race in his own make of car. About 2 weeks after the end of the Tasman he called me to his house and told me that he was going to retire from racing and was going to close down Matich Racing. He said since the boat accident he had been suffering from bad headaches and lack of concentration and thats why he spun both in practice and the race in Adelaide. Along with other matters he thought it was time to retire from racing’. 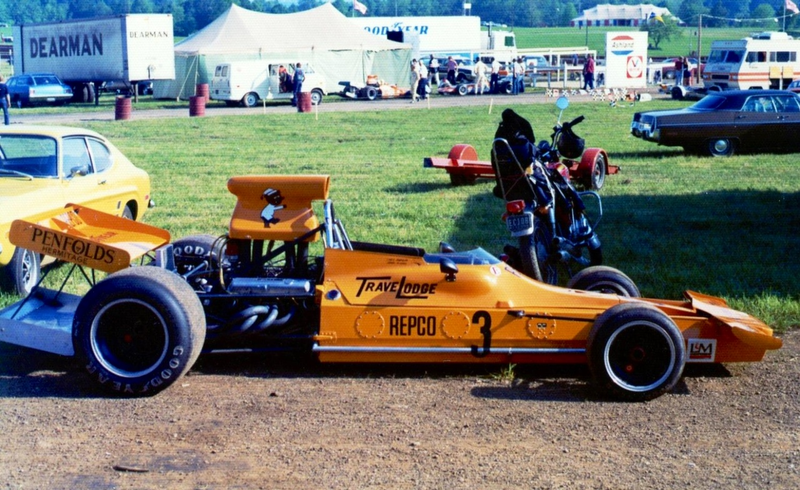 ‘The A53 with the latest Repco engines were as competitive as any other F5000 car at the time and we had not scratched the surface with its development. We had the car and enough spares to race the A53 in any series in the world, these spares were made in December ’73/January ’74 so i don’t think FM had made up his mind to retire until after the ’74 Tasman ended. 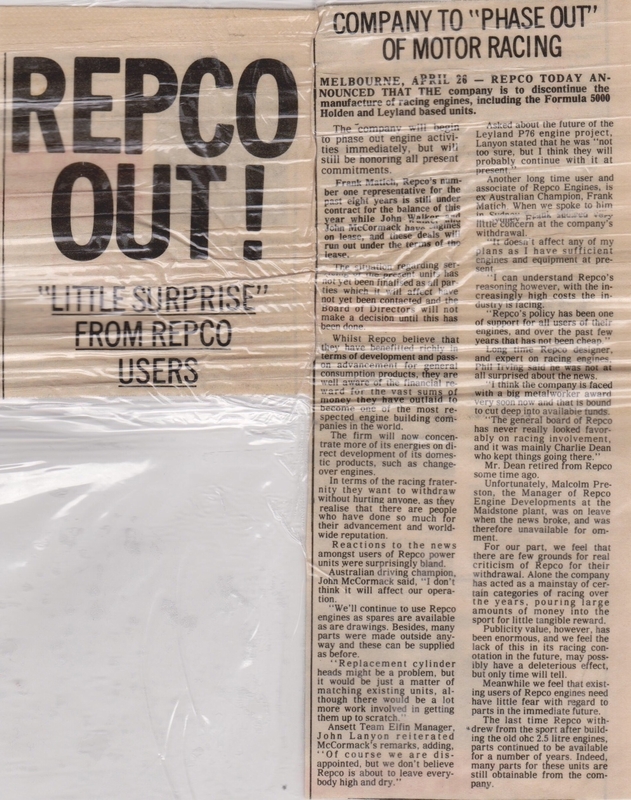 Repco was not the main cause, their announcement to withdraw was not made until April, long after the discussion FM and i had’. ‘All the cars were put up for sale in the May 1974 edition of the ‘Racing Car News’, the A50 ‘001/2’ Gold Star/Australian GP winning car was advertised as a rolling chassis for $A3950. The A51 ‘005’ rolling chassis $5950 and the A53 ‘007’ rolling chassis $9750. 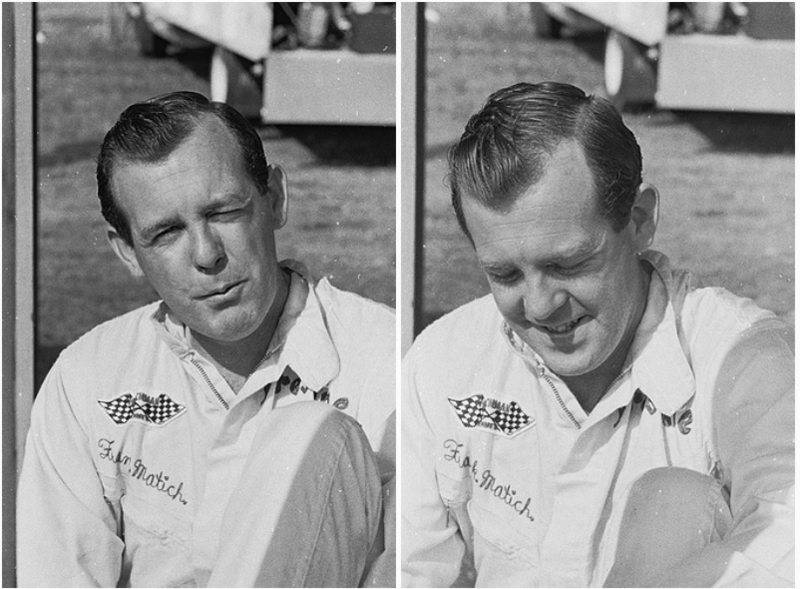 When Frank Matich retired he was 39 years old and still at the peak of his powers as both a racer and constructor of racing cars. He was without doubt and objectively showed he was as quick as the world best in the sixties when he raced against them in equivalent cars. 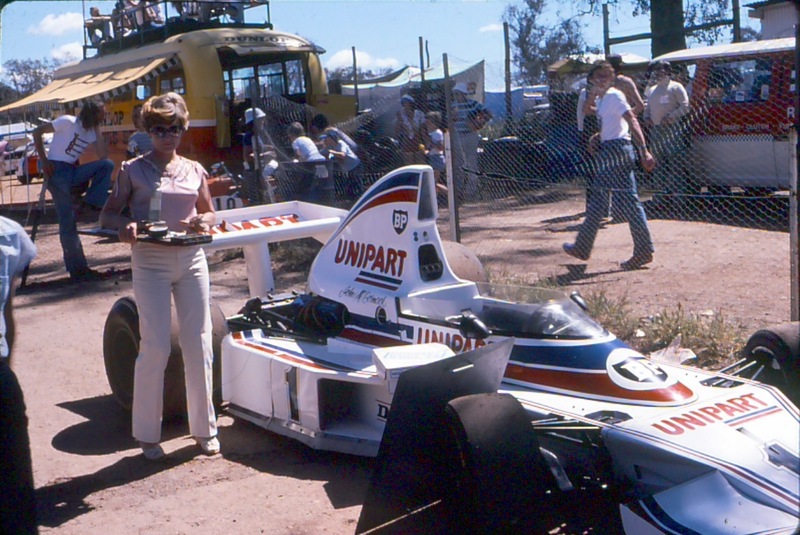 His sportscars were the fastest in Australia and his F5000’s as fast if not in some years faster than the worlds best. In that context he retired too early, Derek Kneller says the A54 was being concepted when FM retired. Personally i like my heroes to retire at their peak rather than the back ‘of the curve’. If FM had not peaked he was perhaps close to it. The family business was motor racing, FM’s wife Joan was very much involved from start to finish. Always very much a family man as well as ‘obsessively focussed’ as ‘successful racers’ are in any field of life, it was time to give his family of six the time now they needed and deserved, whilst continuing the businesses involved in motor racing if not the actual building and racing of the cars themselves. 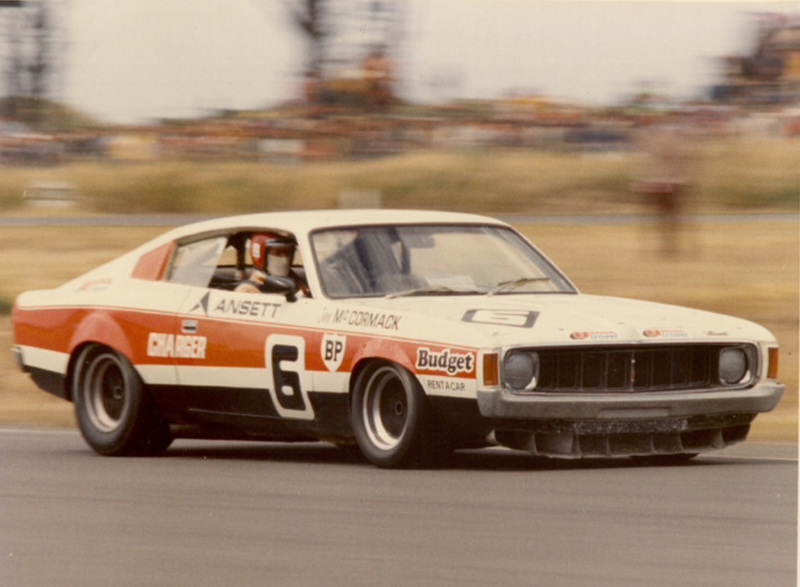 FM was never far from the scene and Matich cars remained successful particularly in John Goss’ hands, he won the 1976 AGP at Sandown in A51/3 ‘005’ against much younger cars. No longer with us, Frank Matich died on 11 May 2015. FM was a man of immense achievement, not without his faults mind you, and a great Australian. I hope i have conveyed some of that. ‘Pitlane’ Interviews with Derek Kneller. Elfin MR8 Chev and James Hunt. 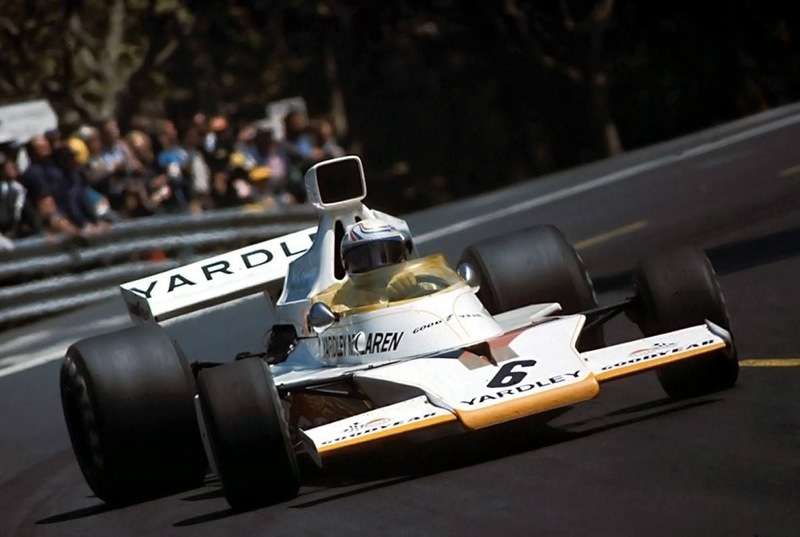 Peter Revson on his way to fourth place in McLaren M23/2 in the 1973 Spanish GP, Montjuich Park, Barcelona. No other individual chassis has raced in F1, F5000 and Can-Am championships before conversion back through F5000 to its original F1 specifications. McLaren M23/2 is that car. The McLaren M23 was one of the marques most successful designs, winning Grands’ Prix from 1973 to 1977 and Drivers and Manufacturers World Titles for Emerson Fittipaldi, James Hunt and McLaren in 1974 and 1976. 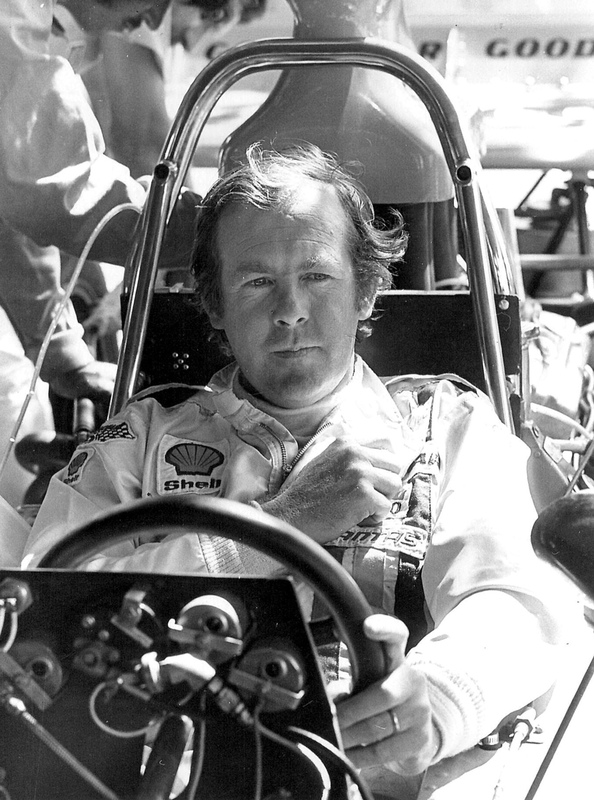 Gordon Coppuck was responsible for the teams innovative and successful CanAm and Indycar designs, Ralph Bellamy’s departure from McLaren and return to Brabham gave Coppuck his F1 design chance. 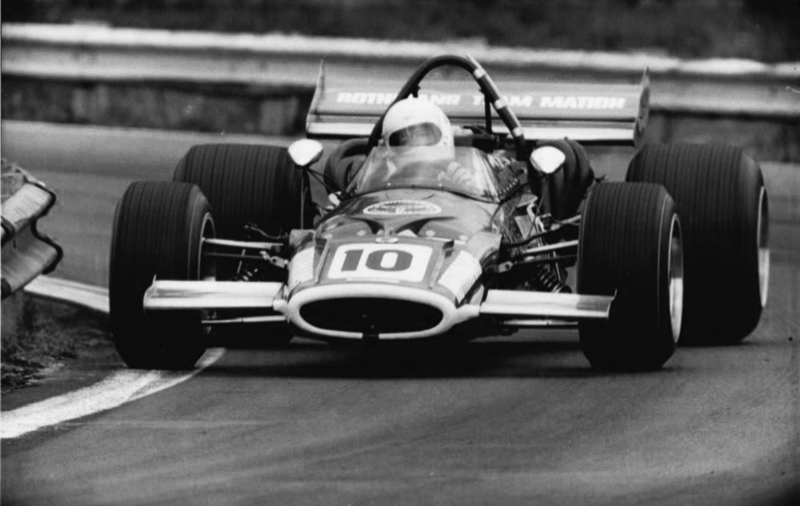 The car followed the conceptual path blazed by the Lotus 56/72 in having a chisel nose, side radiators and rising rate suspension, rather than the Tyrrell ‘bluff nose’ alternative aero approach of the day. 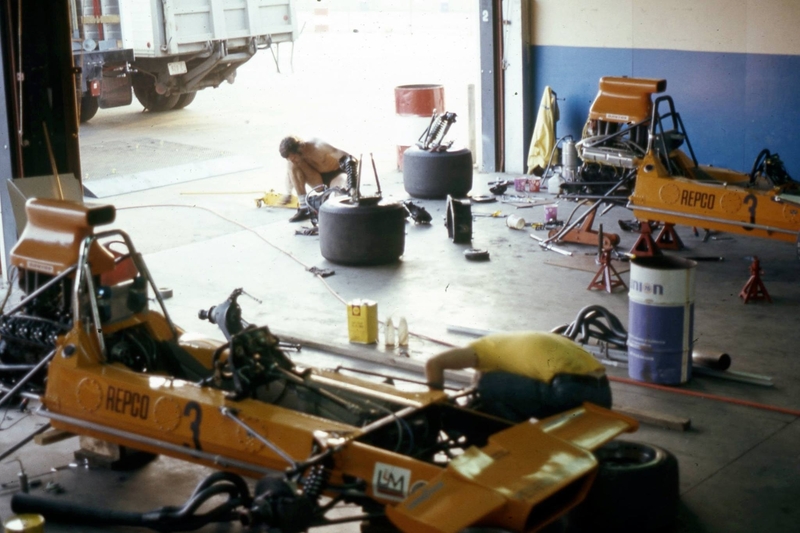 McLaren’s very successful M16 Indycar followed the 72 so it was a logical step for Coppuck, using the well established McLaren interactive design approach, with many on the shop floor having input into the conceptual stages of new car development. The M23 was a typical British ‘kit car’ of the period with its Cosworth DFV 3 litre V8 and Hewland FG 400 5 speed gearbox. New deformable structure rules mandated for ’73 allowed a fresh approach to address the M19’s shortcomings which were a lack of straight line speed and weight. The chassis was formed in 16 gauge aluminium sheet, all joints bonded and riveted, the radiator sidepods an integral extension of the structure. Fuel tankage was centralised to promote a ‘Tyrrell like’ low polar moment of inertia, the driving position pushed forward relative to the M19. Front suspension comprised rising or progressive rate linkages, a large lower wishbone and top rocker actuated inboard mounted spring/shock units. At the rear a reversed lower wishbone, single top link and twin radius rods were used, spring rate progression was achieved with the winding of the coil springs. Brakes were Lockheed ‘Can-Am’ calipers, rotors 10.5 inches in diameter, outboard at the front and inboard, beside the gearbox, at the rear. The bodywork was ‘all enveloping’, the airbox neatly covered the engine aiding airflow to the rear wing. Wheelbase of the new machine was 101 inches, front track 65 inches, rear 62.5 inches, the length was 170 inches with the whole lot weighing a claimed 1270 pounds distributed 34/66 % front to rear. 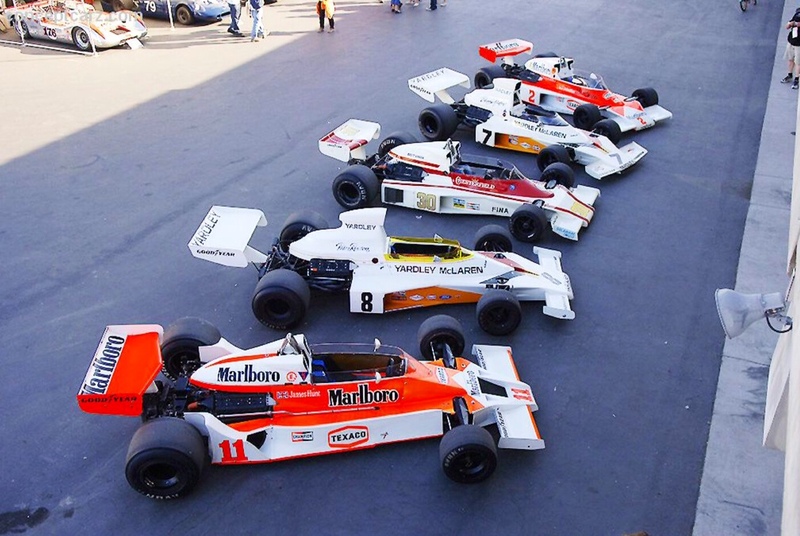 Four of these ‘original spec’ cars were built for 1973, the prototype M23/1 was tested at Goodwood by Denny Hulme before setting off for the season opening South African GP at Kyalami. Denny was immediately quicker than in the M19, rapidly adjusting to the ‘far forward’ driving position- Hulme put the car on pole at Kyalami and lead the race before puncturing a tyre on debris. 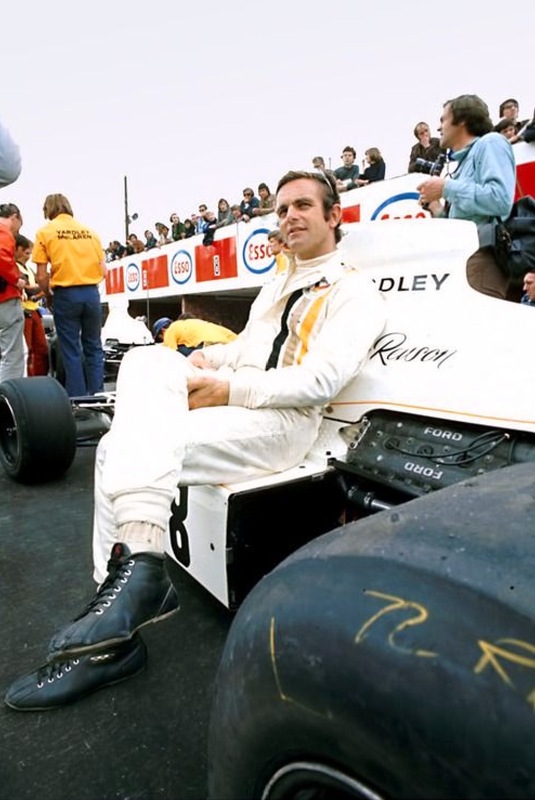 Other McLaren team drivers were Mike Hailwood and Peter Revson in his first fulltime Grand Prix season. Revson started his grand prix career in the early 60’s before returning to his native USA and making his name in the Can-Am series which he won in 1971 in a McLaren M8F. He was also McLaren’s Indy driver. 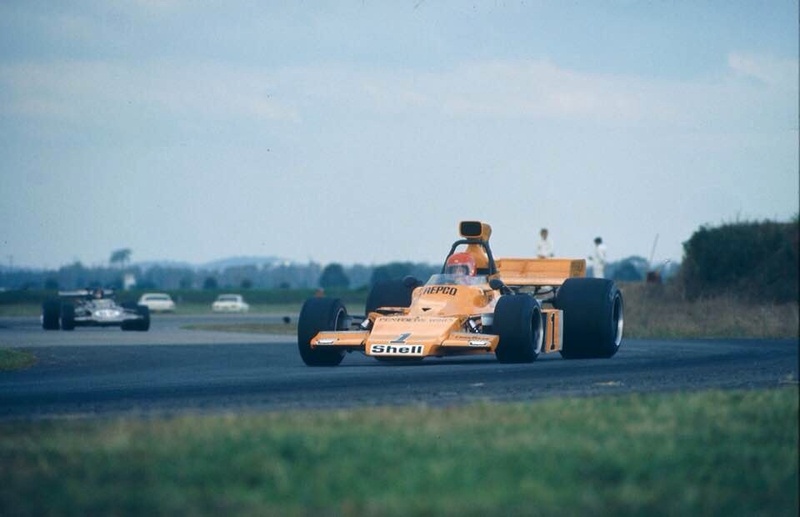 M23/2 debuted in Revson’s hands on 8 April 1973 at the Silverstone International Trophy, finishing 4th, it was to be his car for most of the year, his promise as an F1 driver fulfilled with a tremendous victory at Silverstone in the British Grand Prix. 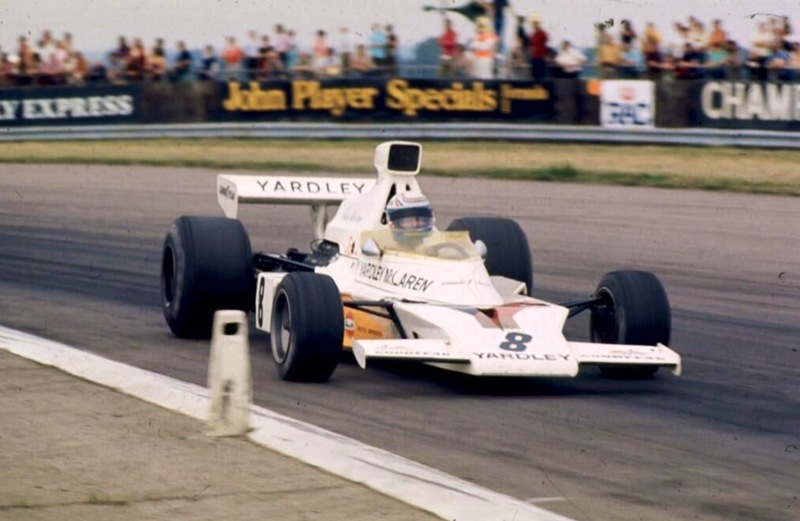 McLaren’s ‘cub driver’ Jody Scheckter, in another M23 famously caused a multi-car pileup after losing control at Woodcote at the end of lap 1 and proving the strength of Coppuck’s design. M23/2 was used by Scheckter later in the season in Canada and the US before being sold to South African ace Dave Charlton. 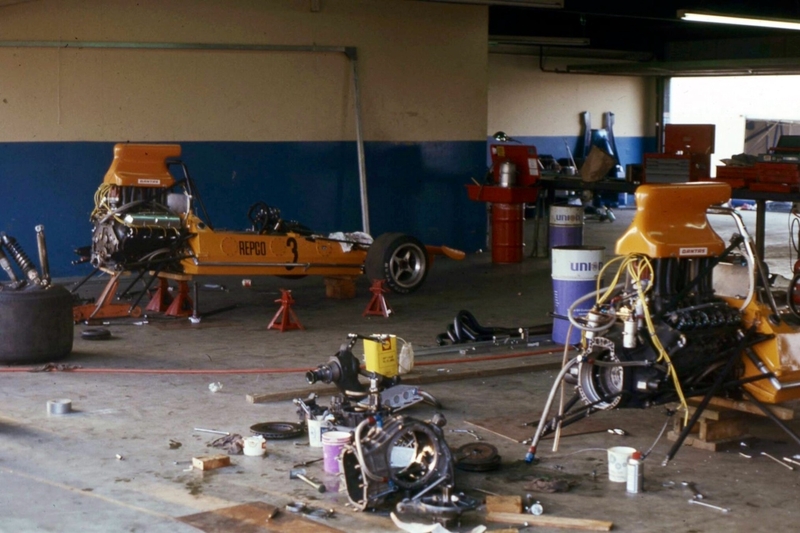 The McLaren replaced Charltons’ Lotus 72D for the South African National Championship, it was incredibly successful winning 8 races and Championships in ’74/5. 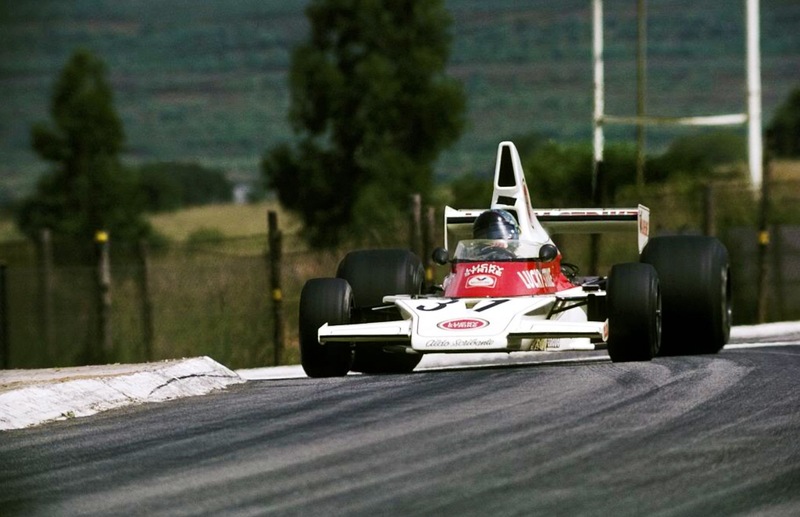 Dave set a Kyalami lap record in the 1975 Rand Winter Trophy which stood for years until broken in the ground-effects era. 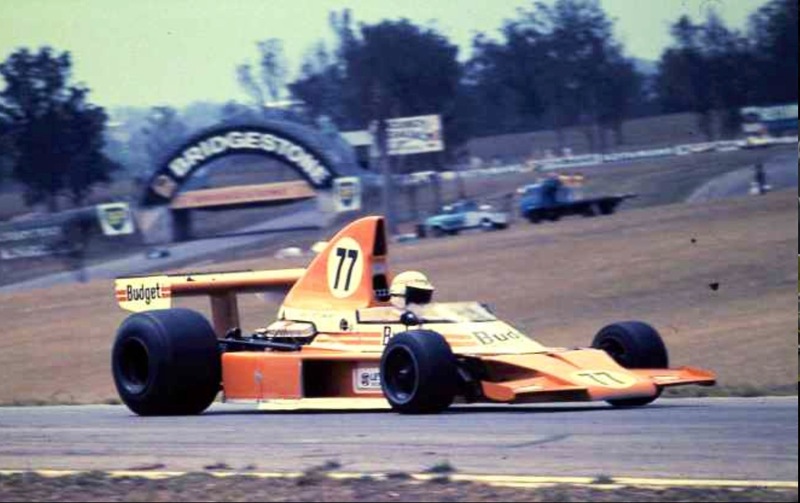 The cost of F1 cars was getting out of hand, so Charlton offered the car for sale with the introduction of Formula Atlantic as South Africa’s Championship class from 1976. Aussie F5000 racer John Mc Cormack was the eager purchaser- ’Charlton was a terrific bloke to deal with, I bought the car, 20 wheels, multiple sets of front and rear wings, bodywork, 2 types of airbox, less engines, which I should have bought and sold later, then the exchange rate moved in my favour so it was a really good deal’. 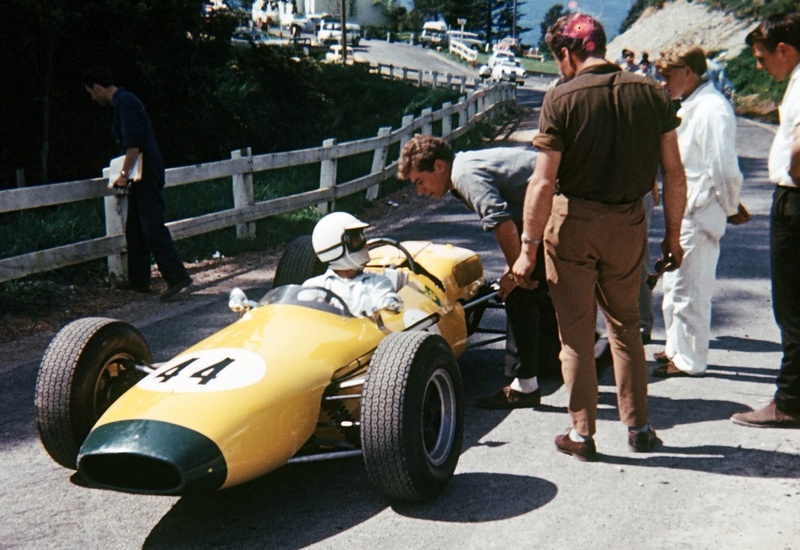 McCormack started racing in his native Tasmania breaking into the national scene with the purchase of Jack Brabham’s ’62 AGP car, a Brabham BT4 Climax. He proved he could mix with the ‘big boys’ in an Elfin 600C Climax, a very competitive car when fitted with a Repco ‘740 Series’ V8 in place of the old Climax. 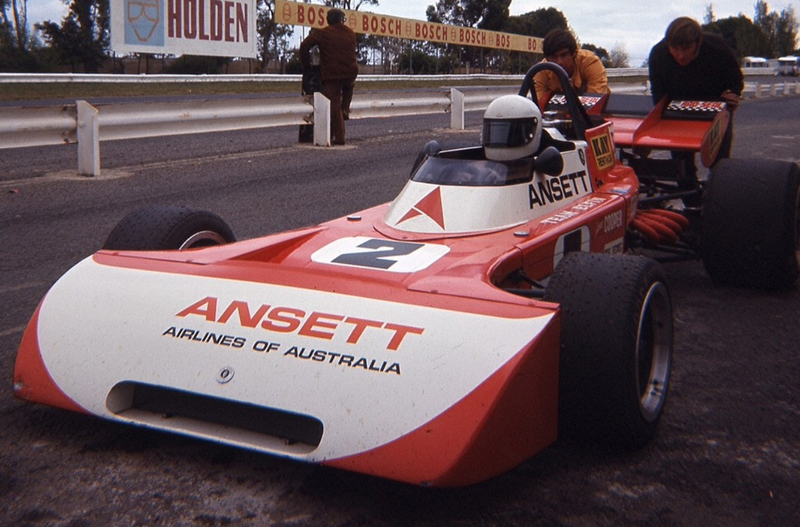 He bought the very first Elfin MR5 Repco in 1971 and via his connection with PIARC’s John Lanyon did the Ansett sponsorship deal to create the two car ‘Ansett Team Elfin’ with Elfin owner/designer/driver Garrie Cooper. 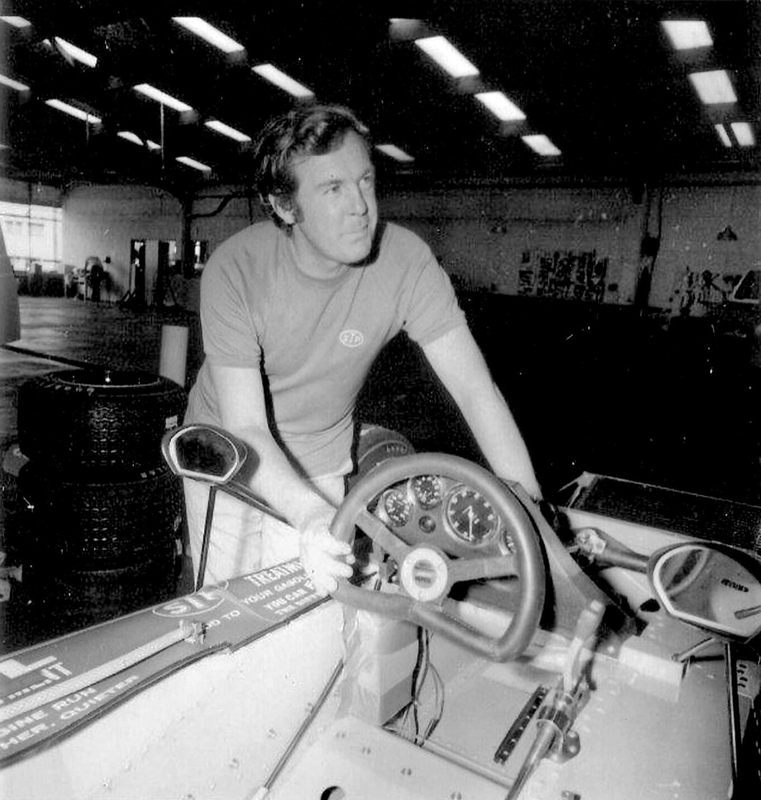 McCormack and his team developed his car to be very competitive, winning the Australian Drivers Championship, the ‘Gold Star’ in 1973 and the NZ GP, part of the annual Tasman Series of eight races run in Australia and New Zealand every summer, in 1973 and 1974. In search of ‘the unfair advantage’ over the heavy Holden and Chevrolet engined cars, Repco’s Phil Irving spotted the new Leyland P76 family car engine, a 4.4 litre aluminium block V8, at the Melbourne Motor Show. 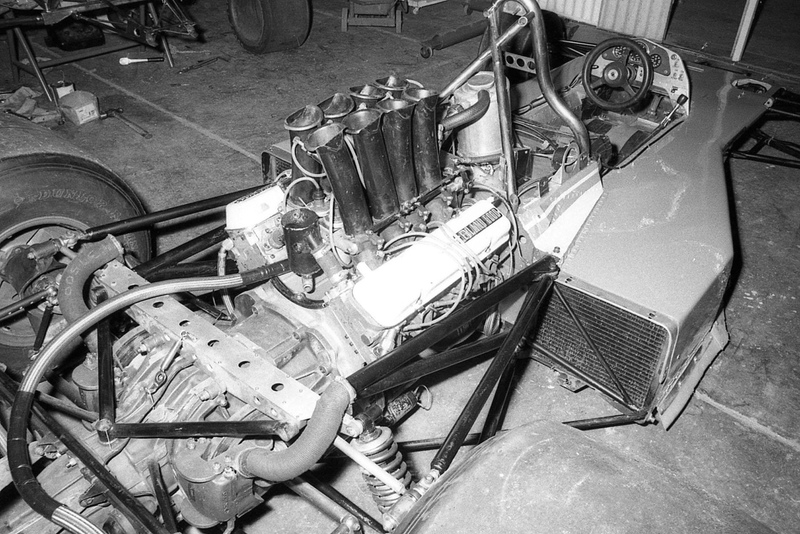 Elfin’s John Lanyon quickly did a deal with Leyland and Repco to jointly fund development of an F5000 variant of the new engine for a car specifically designed for it to distribute the weight in a fashion more akin to an F1 car, rather than the ‘ tail happy’ F5000’s. McCormack characterised the 5 litre beasts as ‘like having a pendulum in the car’. 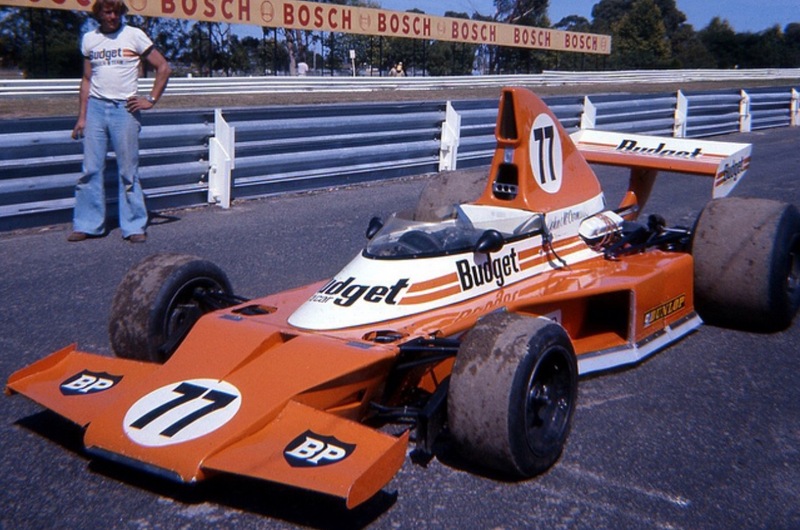 Cooper’s ‘Little Car’ was the Elfin MR6, a new design which debuted for the 1974 season. 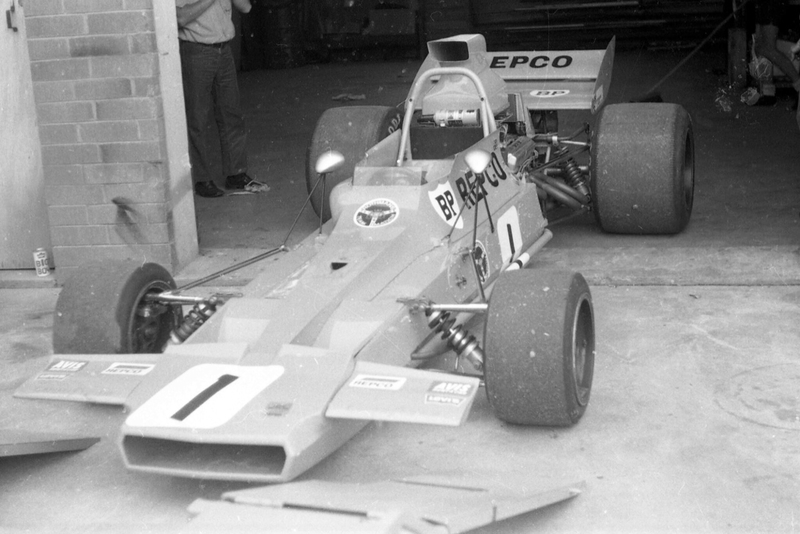 John McCormack debuts the Elfin MR6 Repco Leyland # ‘MR6L 6741′ at Oran Park on 30 January 1974. A big panic as the car was running late and was launched in NSW, at Oran Park near Leylands’ Zetland HQ, a long way from Elfin’s base in Edwardstown, Adelaide… Mac was not happy with the Tasman Series starting in NZ several days later but the car did manage a few laps despite not having ever turned a wheel before…MR6 small by F5000 standards and very 1973 Tyrrell 006 like in appearance. Repco developed an engine with a capacity of 4931cc, a 94mm bore and 89mm stroke. As originally developed, the engine used the P76 cylinder block fitted with special liners and main bearing stiffening plates, the cast iron crank was replaced with steel units after initial failures. Cylinder heads were P76 with flowed inlet and exhaust ports and larger valves. Pistons, con-rods and bearings were Repco, as was the dry sump setup which utilised three stage pressure and scavenge pumps. 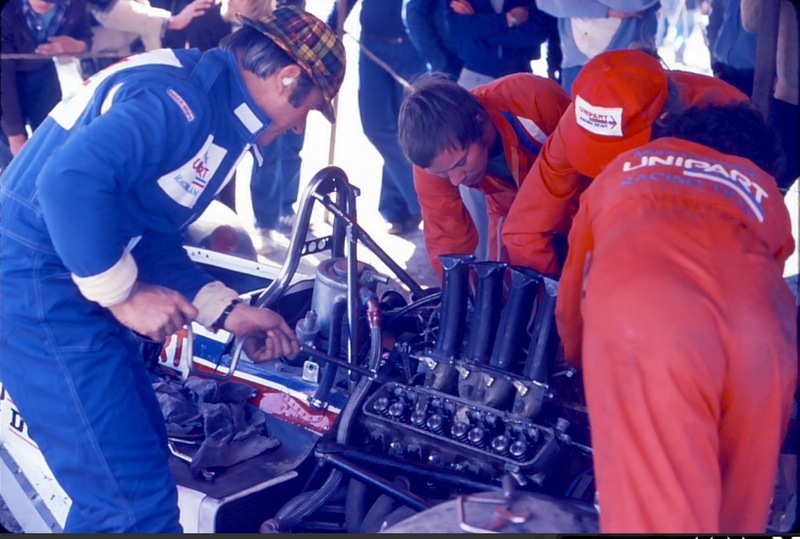 Fuel injection was by Lucas and a Repco Lorimer dual point distributor fed by coils provided the spark. Critically the engine weighed only 160kg compared with the Holdens 220kg, however the claimed power of 425 bhp @ 6800rpm and 375 lb ft of torque at 5500 rpm was far less than the circa 500 bhp of a Holden or Chev. Elfin’s Dale Koenneke quipped that the engine when first raced in early ’74 had ‘no more than 365 bhp’ when installed in the MR6. History tends to support the contention that the horses were ponies rather than stallions! 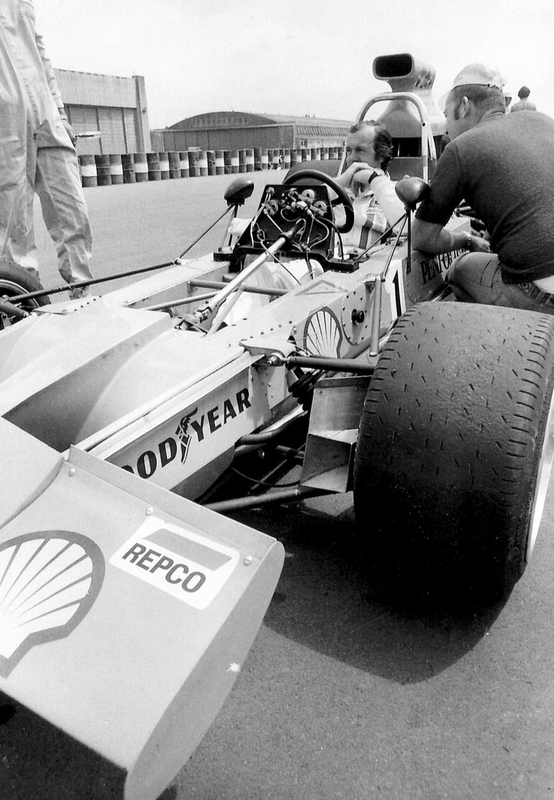 The engine had many teething problems, the fragility of the engines blocks and cast iron cranks together with consistent overheating were exacerbated by Repco’s withdrawal from racing and therefore lack of commitment to the project. 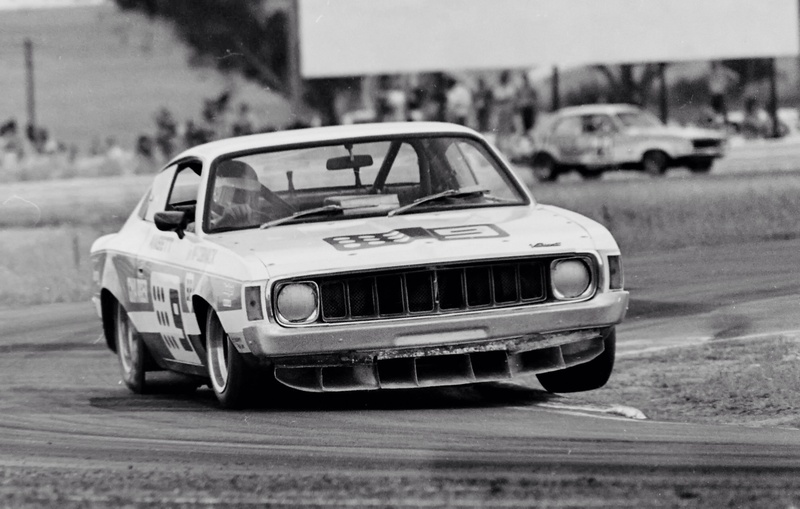 McCormack used both the MR5 and MR6 in ’74, before converting the MR6 to accept the Repco Holden engine. ‘Dale Koenneke said enough! We put in all this effort and the thing just shits itself, lets put the Holden into it’ in this form winning the ’75 Gold Star. McCormack, an independent thinker was still convinced the Repco Leyland could be a winner in the right car, the question was finding one! McCormacks team of Dale Koenneke and Simon Aram did a beautiful job installing the Repco Leyland into the car without ‘butchery’. The engine, after modification of the harmonic balancer and relocation of water pump and oil tank, fitted neatly into the tub albeit as an unstressed member, which the DFV of course was, the engine supported by traditional tubular ‘A frame’s. McCormack engaged famous Aussie engineer Phil Irving (ex Repco, Vincent) to further develop the engine from its Repco base. Irving designed new heads cast by Comalco, which eliminated separate valve guides and seats. The design also featured a ‘bent’ pushrod to allow more room for straight inlet ports. John said ‘Power increased to around 435bhp and 410 ft/lbs of torque, more mid range punch than the Repco Holden. An alternate cam delivered 470/380, but this stressed the overall package causing many block failures. All the talk on Friday night at the Horsepower Hotel never won races, it was about torque as well as power and whilst we were light on power we had plenty of mid range punch and a well balanced overall car package’. The Hewland FG 400 gearbox was marginal in F1, the torque of the beefy Repco required new gears cut by Peter Holinger’s now famous Holinger Engineering concern in outer Melbourne. 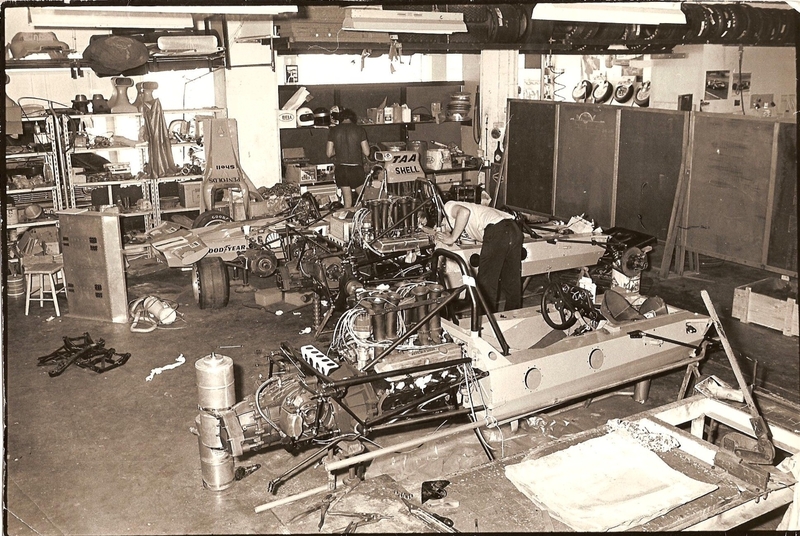 The Repco and Chev engined Lola, Matich, Chevron and Elfin chassis’ had more power but the McLaren was lighter, the superb balance, handling, and braking of the design was maintained as the DFV and Repco Leyland were similar weights. After much media interest McCormack raced the car at the Oran Park Gold Star round in September ’76 putting it fourth on the grid, a valve failing on lap 22. A win followed at Calder in October then pole at the ‘Island, leading until a tyre deflated, despite this the car finished third in its inaugural Gold Star Series. 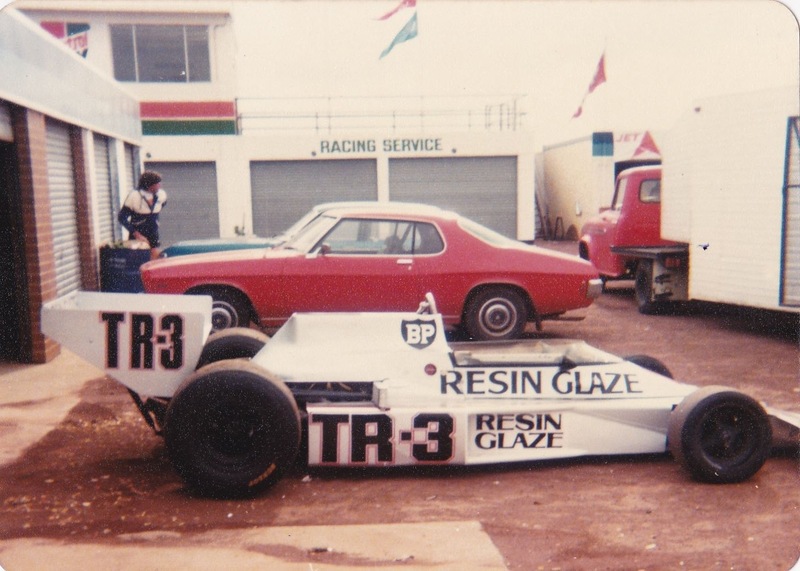 Car sponsor Budget Rent a Cars’ Bob Ansett convinced John to hire Frank Gardner to assist with Team Management in the Rothmans International series but a poor championship caused by unreliability was succeeded by a Gold Star win at Surfers. At Sandown the car gave cooling problems but the final round at Phillip Island showed its true pace, 2 seconds a lap clear of the best Lola on this circuit which is a test of power and handling. McCormack was well in the lead when problems again intervened, John pitting for 2 laps then limping home picking up enough points to win his third Gold Star Series. 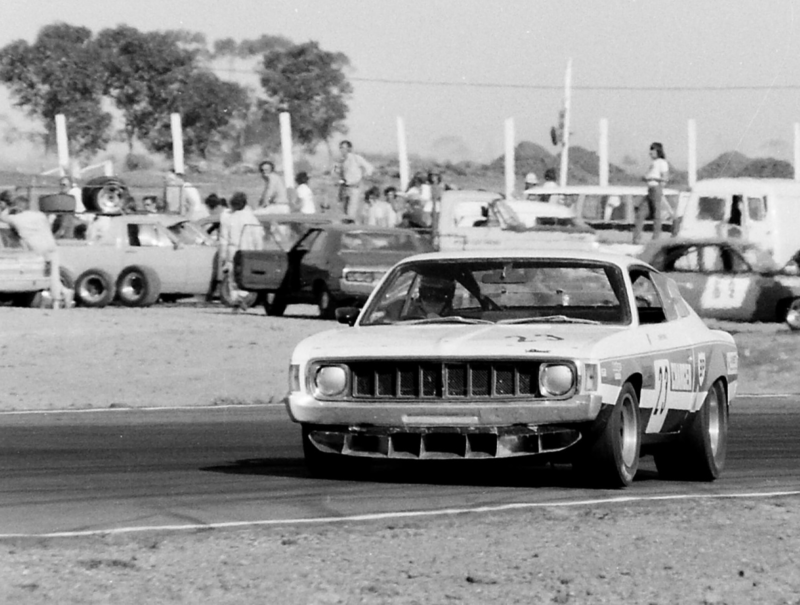 The year was capped with a win in the ‘Rose City 10,000’ at Winton. 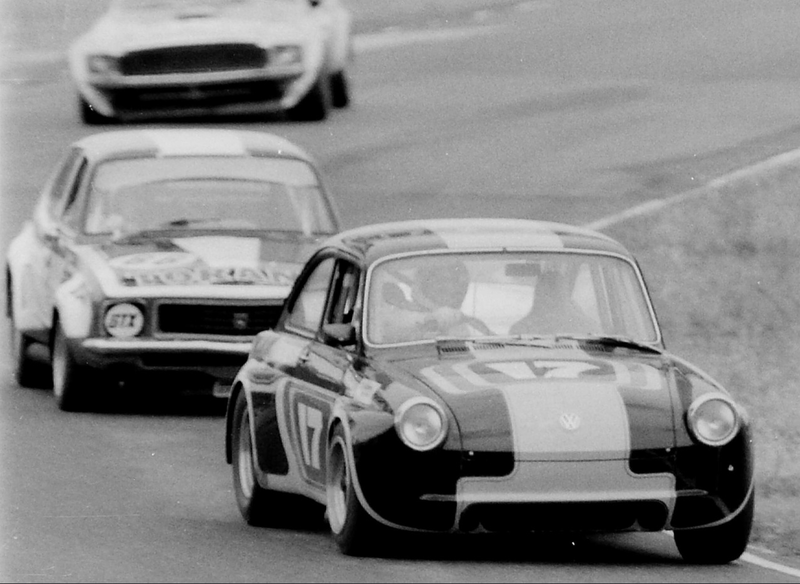 1978 started poorly with Rothmans Series unreliability followed by an Oran Park Gold Star round win. The Sandown AGP was a terrible race with multiple accidents, the McLaren out virtually from the start with head gasket failures. John dominated at Calder only to run out of fuel with a lap to go. The Phillip Island round was cancelled- John finished second in the Gold Star. The season ended again with the ‘Rose City 10,000’ at Winton. Amongst the competitors was James Hunt, the 1976 World Champion making a one-off appearance in Australia driving an Elfin MR8 Chev. 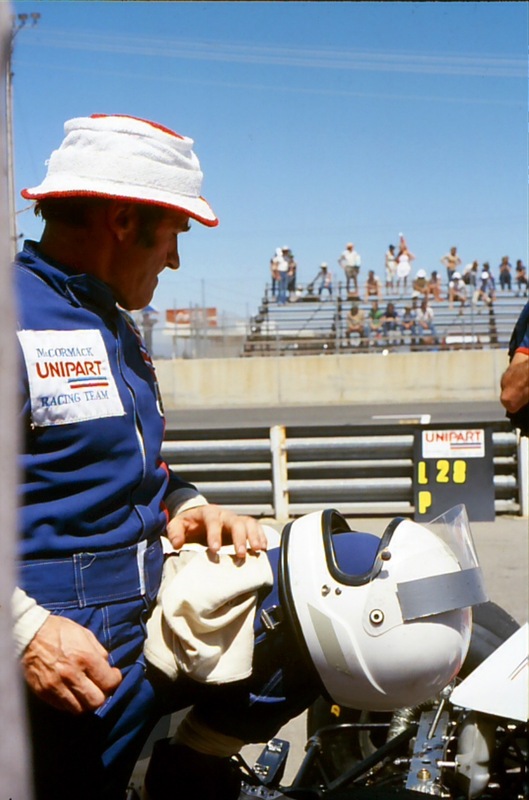 John was second on the grid to him, Mac having an unfortunate event in which a stone jammed a brake caliper causing a pit stop- he finished fourth in the race won by Hunt. 1979 also started poorly with 5th the best result from four Rothmans International Series meetings, Larry Perkins won the title in an Elfin MR8 Chev. 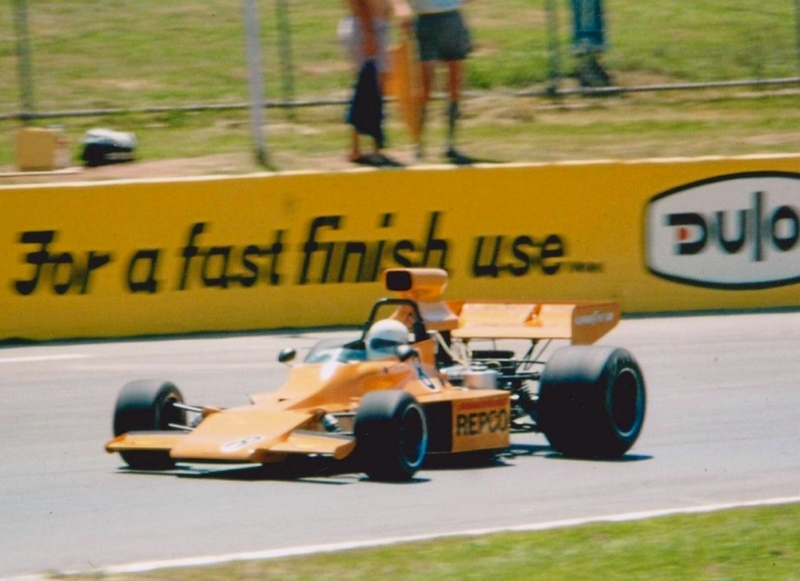 The McLaren’s last F5000 race was the 1979 AGP at Wanneroo Park, Western Australia where a gear broke. McCormack entered 20 F5000 events for 3 wins and victory in the 1977 ‘Gold Star’ ahead of cars much younger and more powerful than his 1973 McLaren! Unreliability was the issue with 10 DNS/DNF results, mind you the Chevs and Repco Holdens were also brittle. By 1976 F5000 had been ‘destroyed’ by Eric Broadleys fantastic, dominant Lola T330/332/332C series of cars. 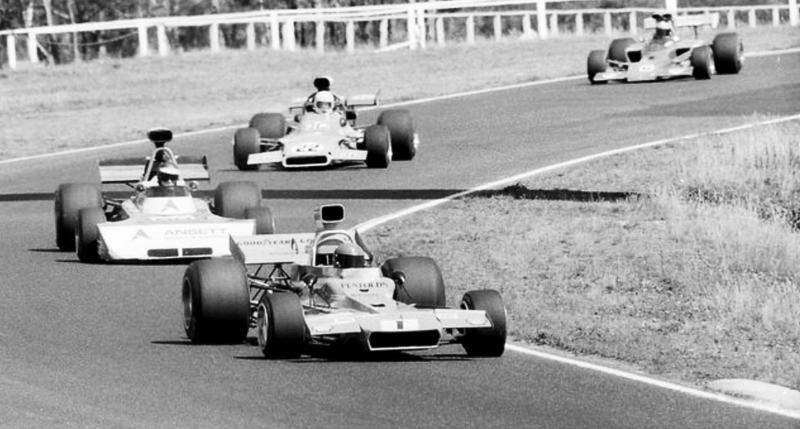 The Tasman series was over, the Kiwis adopted Formula Atlantic/Pacific and Australia persevered with F5000, somewhat against the global tide. 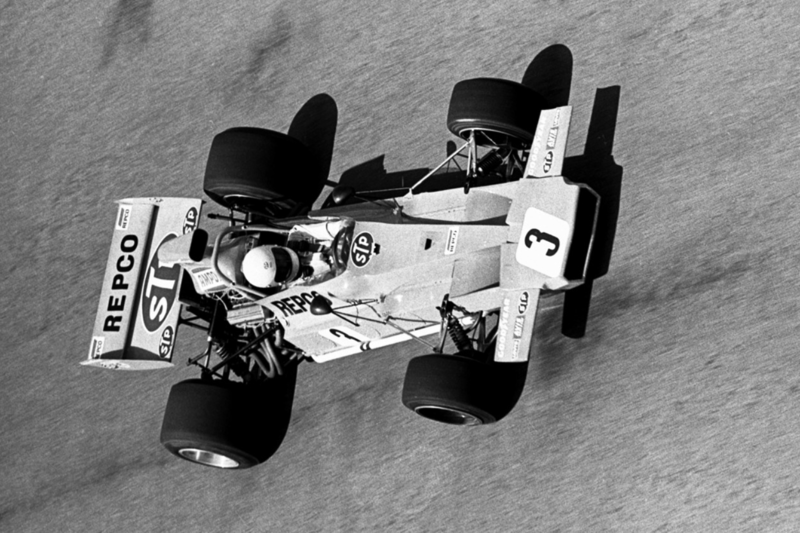 The US F5000 series ended at the duration of the 1976 season and morphed into 5 litre single seat Can-Am sports cars, with Lola T332 derivatives remaining the dominant car for some years. 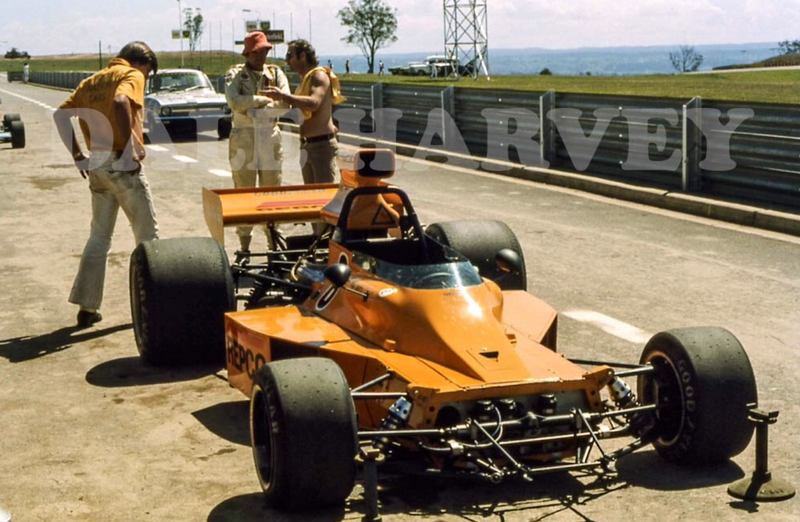 McCormack, a professional racer, converted the McLaren from an F5000 to a very attractive Can-Am car- M23/2 travelled back over the Pacific again! ‘It was time to have a look at what was happening in the US, things were quiet here so Simon Aram and John Webb designed and built an attractive body and off we went’. He was taking on a big challenge, the Can-Am series in 1979 included Keke Rosberg, Jacky Ickx, Alan Jones, Geoff Lees, Vern Schuppan (Elfin MR8), Bobby Rahal and Al Holbert amongst its competitors. 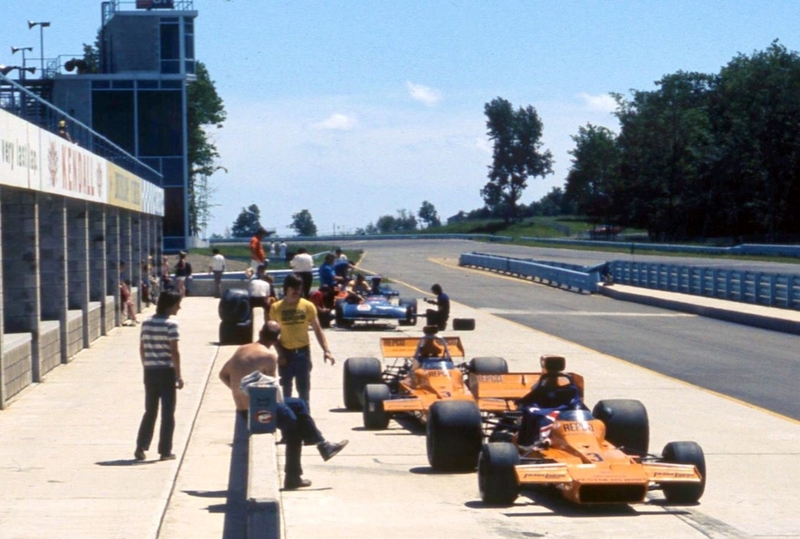 The McLaren competed in three rounds for a best result of 12th at Watkins Glen in a series dominated by Lolas with Ickx winning in a T333CS. ‘There was a weight advantage if you ran 4 litre engines, we did two of the races with the 5 litre Leyland and one, the final round, with the 4 litre which gave around 400BHP, the weight thing was academic as the cars were never weighed’. It was no disgrace in this company in a six year old car run by a small team far from home. 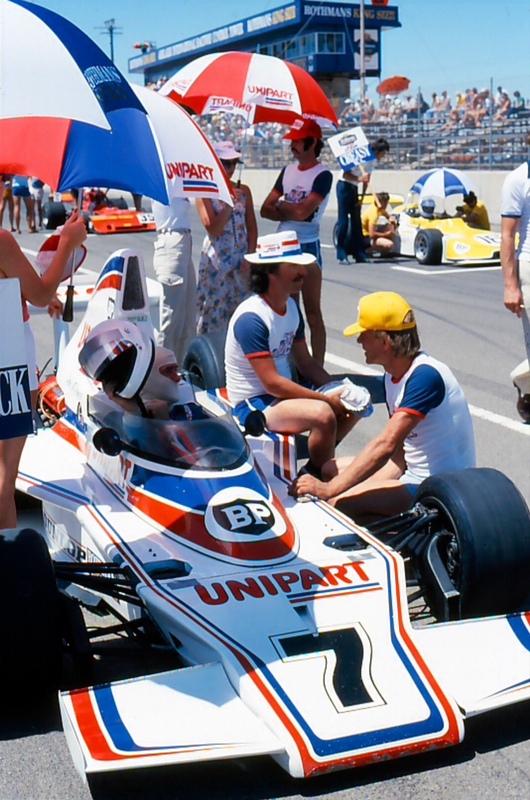 In the end money was tight and it was time to return to Australia to compete in a Jaguar Sports Sedan his team had built, and at the instigation of sponsor, Unipart, contest the 1980 AGP which was run to F5000 and F1 rules! 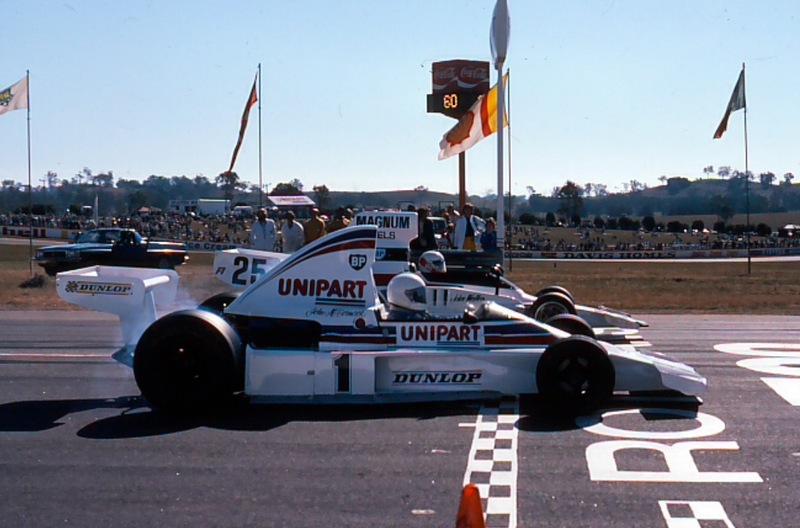 Alan Jones was on his way to winning the 1980 World Championship, so the 1980 AGP rules were amended to attract the new champion and his Williams FW07 to Australia. Also making the trip from Europe were Bruno Giacomelli and his Alfa 179 and Didier Pironi, of Team Tyrrell who drove an Elfin MR8 for Ansett Team Elfin. 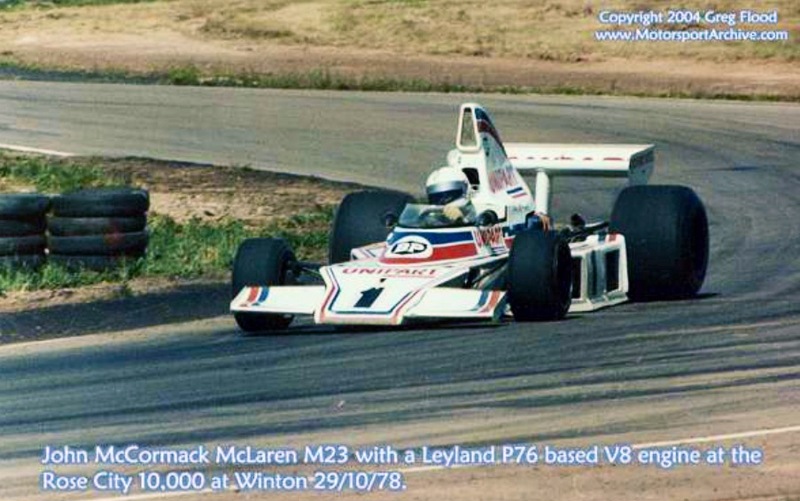 McCormacks’ team converted the McLaren back into F5000 specifications, he was looking forward to the race. ‘The McLaren was not a light car, it then weighed about 1430 lbs, because the AGP was being run to F1 rules we lightened the car enormously by about 200 lbs’. ‘I normally flew to meetings but we a were running late with the preparation of the car so I travelled as a passenger with my mechanic to get some sleep. There was some fog about, he dozed off at the wheel near Keith (in rural South Australia) hitting a tree having glanced off an earth mover which made an horrific accident slightly better than it may have been! I got a brain injury in addition to the physical ones, I have about 70% of my mental capacity, not enough to race again’. Sadly, that was the last race for both McCormack and the much used M23. John went on to build a number of successful sports sedans for others and today has property, retail and mining interests near his home town of St Helens on the Tasmanian East Coast. McLaren built thirteen M23’s. M23/2 competed in 54 events, more than any other M23 chassis and winning more races than any other M23 as well, 54 starts for 12 wins. 1 F1 Championship GP, 8 South African Championship rounds and 2 Championships, 3 Australian Gold Star rounds and 1 Championship. 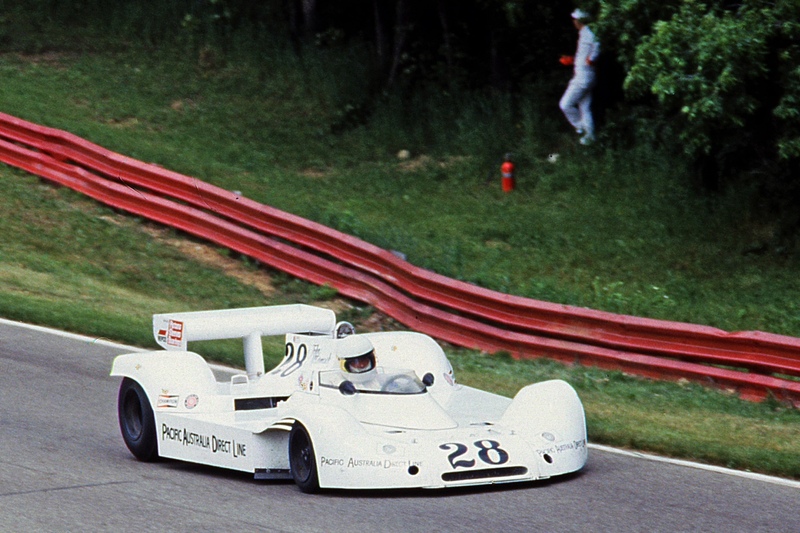 Only a Can-Am win eluded it in its multi-faceted life. 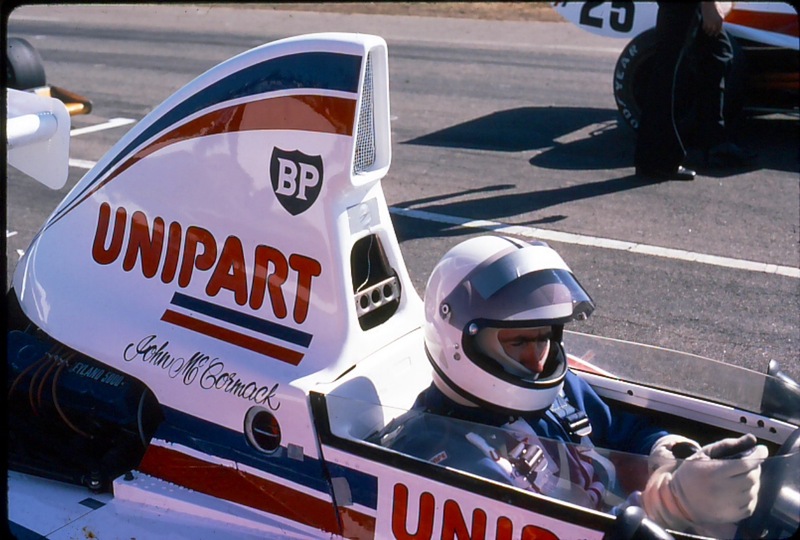 McCormack was focussed on his health and rebuilding his life, the car was offered locally for sale around 1982, without any takers as F5000 had been replaced by Formula Pacific. It was just an old uncompetitive car at the time! 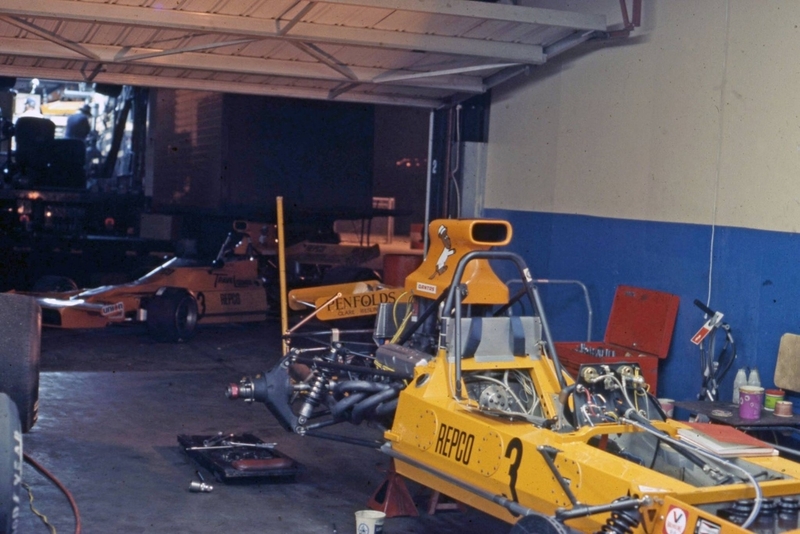 And then along came McLaren’s Ron Dennis ‘hoovering up’ cars for the factory collection where M23/2, converted back to its Yardley McLaren F1 spec, takes its Museum place in the pantheon of the company’s rich, ongoing 50 year history! M23/2 travelled the globe as an F1 car, crossed the Atlantic to South Africa, the Pacific to Australia, the back across the Pacific to the States, back to Australia and finally to Woking in the UK, just down the road from Colnbrook where it was built all those years before- a remarkable journey from class to class and back again, competitive all the way throughout! 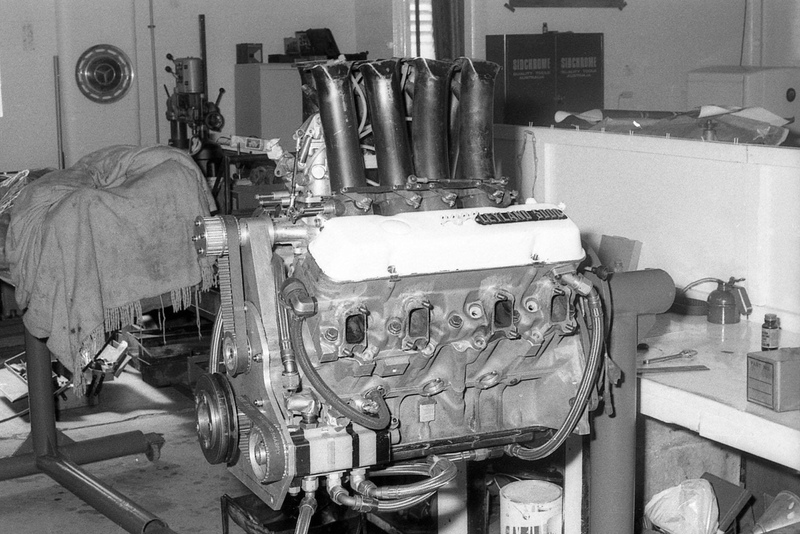 Coventry Climax, the ‘Cosworth of their day’ caused chaos for British Grand Prix teams when they announced that they would not build engines for the new 3 litre F1 commencing in 1966. They had been engine suppliers to most of the British teams since 1958. 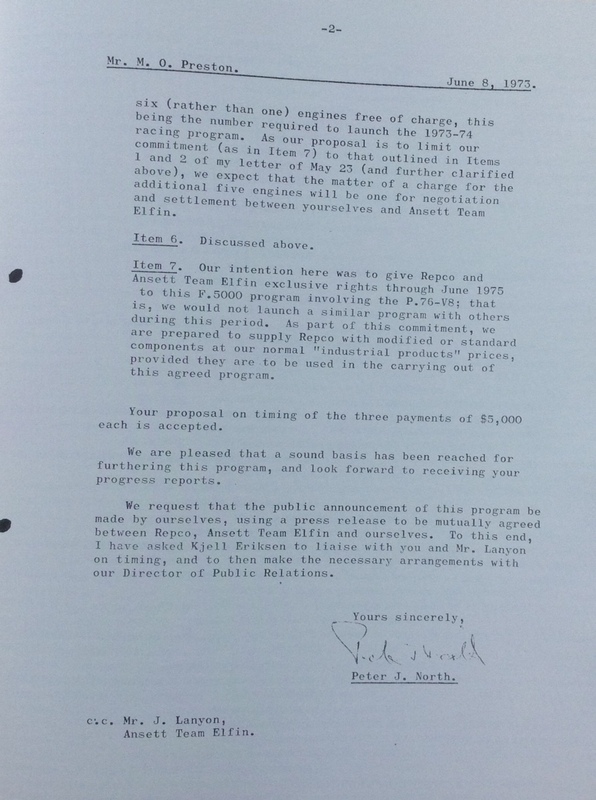 Repco had serviced (and built the engines under licence) the 2.5 litre Coventry Climax FPF 4 cylinder engines, the engine ‘de jour’ in local Tasman races, but were looking for an alternative to protect their competitive position, Jack Brabham suggested a production based V8 to be built by Repco . He identified an alloy, linerless, V8 GM Oldsmobile engine, a project abandoned due to production costs and wastage rates on imperfectly cast blocks. He pitched the notion of racing engines of 2.5 litre and 3 litre displacements using simple, chain driven, SOHC heads to Repco’s CEO Charles McGrath. 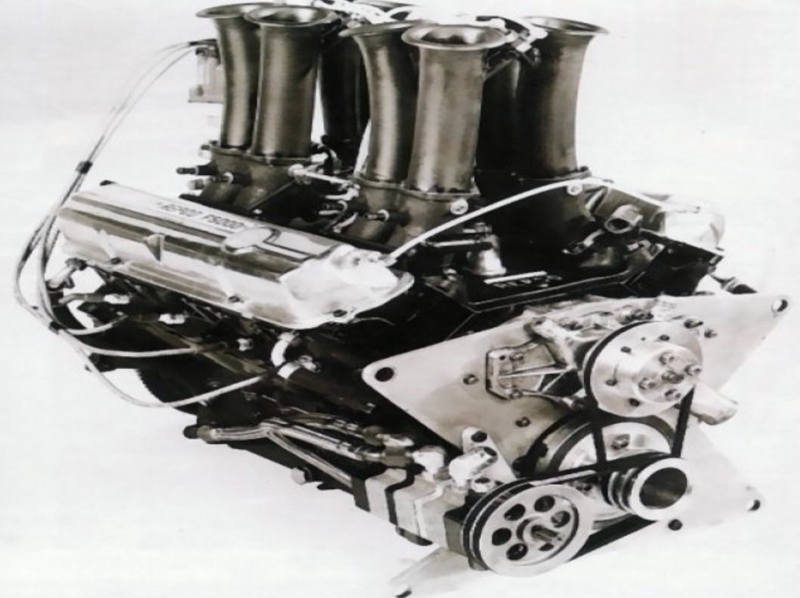 GM developed a family of engines, the Oldsmobile F85 and Buick 215 were almost identical except that the F85 variant had six head studs per cylinder head rather than the five of the 215 and was therefore Brabhams preferred competition option. Brabham had seen the engines potential much earlier, racing against Chuck Daigh’s Scarab Buick RE in the cars one off- and only race appearance at Sandown in early 1962. The car raced in 3.9 litre form and had plenty of ‘squirt’, albeit the underdeveloped chassis was not as competitive as the Coopers under brakes or through corners. The engines competition credentials were further established at Indianapolis that year when Indy debutant Dan Gurney qualified Mickey Thomsons’ 215 engined car 8th, the car failing with transmission problems after 92 laps. It was the first appearance of a stock block engined car at Indy since 1945. Whilst the engine choice was not a ‘sure thing’ its competition potential was clear to Brabham, as astute as he was practical. At the time the engine was the lightest mass production V8 in the world with a dry weight of 144 kg with compact external dimensions to boot. Repco acquired 26 of the F85 blocks and won the 1966/7 World Drivers and Manufacturers Championships as well as countless other races globally with engines using these and later, from 1967, Repco’s own ‘700’ and ‘800’ Series blocks. GM sold the production rights of the engine to Rover in 1967. When Phil Irving saw the Leyland engines at the Melbourne Motor Show he thought he knew them well. However the original GM design had suffered in its transition to Rover and then to Leyland. In essence their were fewer head bolts on both the inlet and exhaust sides of the heads, in addition the block and heads were sand, rather than die cast which made them weaker and less uniform. Finally, the heads had smaller ports than the originals. The fundamentals of the engine to take increased operating loads and power were lacking. Irving made changes by adding material to the block and head castings which also facilitated the installation of main bearing strengthening bars, such changes homologated by Leyland in accordance with F5000 rules. Repco claimed 440 BHP with an absolute rev limit of 7500 rpm and a crank life of one hour. It was soon found that the fragility of the block and cranks required a maximum of no more than 7000 rpm. 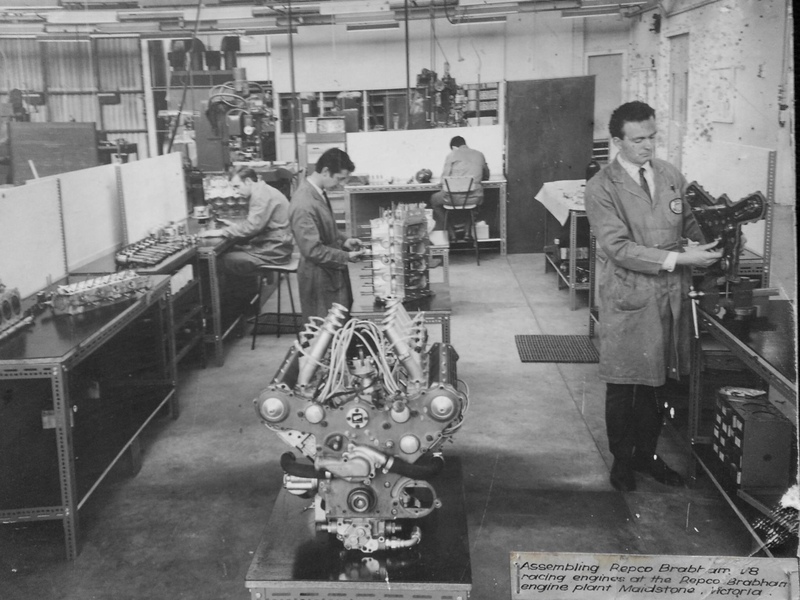 With further development post Repco, McCormacks’ team- with the new Comalco heads, different valve sizes, inlet port shapes inspired by Honda and shorter exhaust primaries, John had a vaguely reliable engine consistently giving 435BHP and 410lb ft of torque. Not a lot but enough to do the job, much like Phil Irving’s Repco Brabham ‘620 Series’ engine in F1 in 1966, that engine was not the most powerful in the field but it did the job, albeit much more reliably than its F5000 relation! 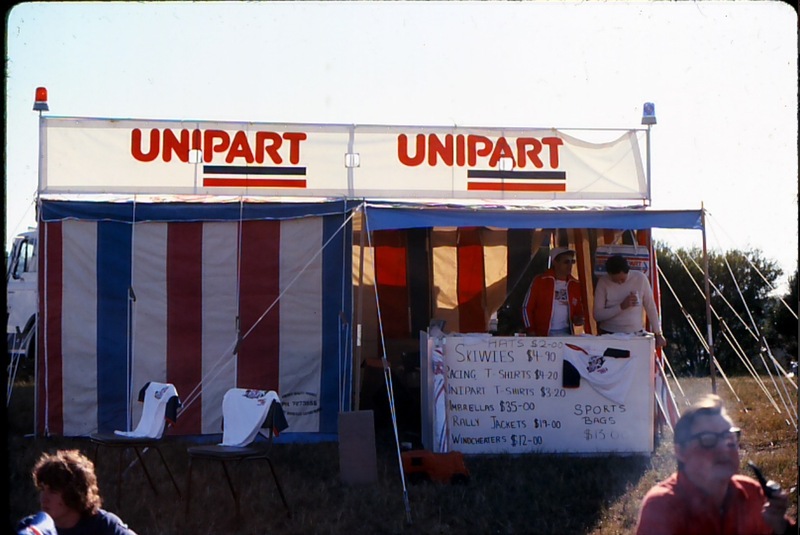 And finally, Unipart Merchandising 1978 style…the T-Shirts @ $3.20 are a snip….